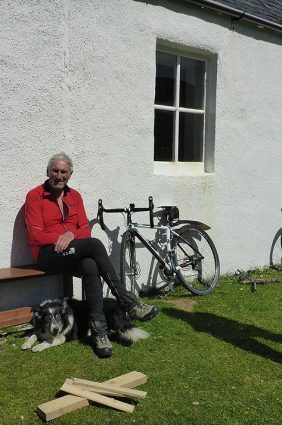 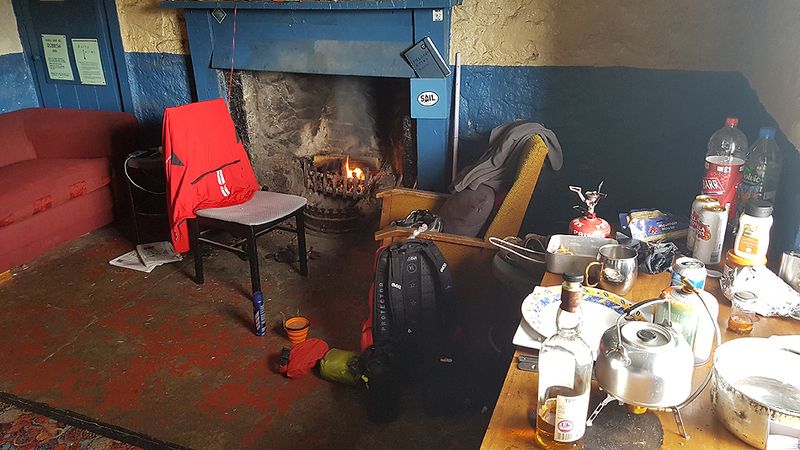 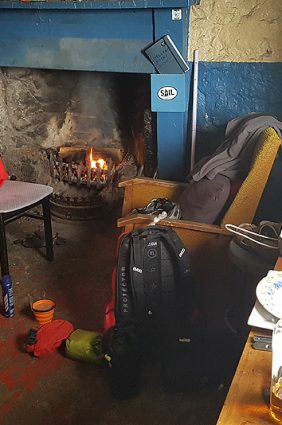 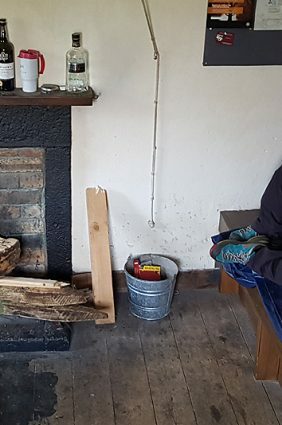 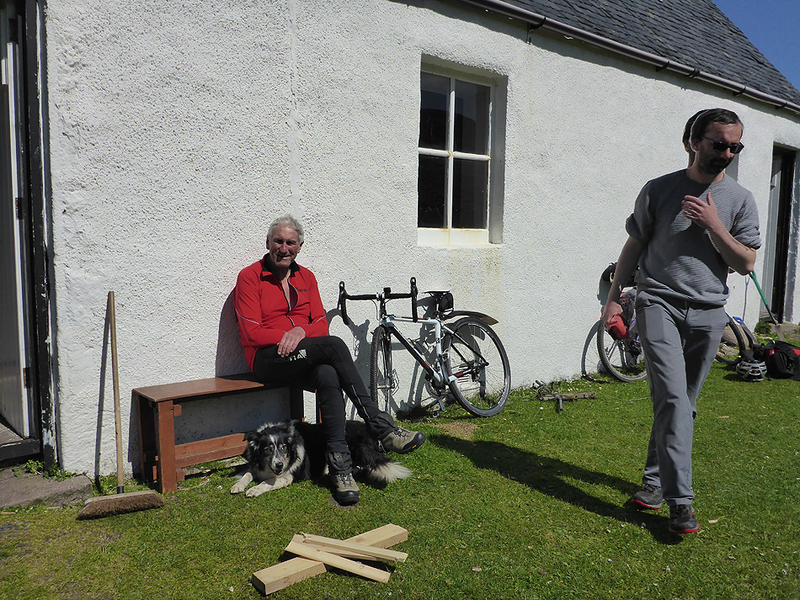 A welcome rest day at the hostel on day 10, waiting for two friends to come along with me on the final couple of short days to Cape Wrath. 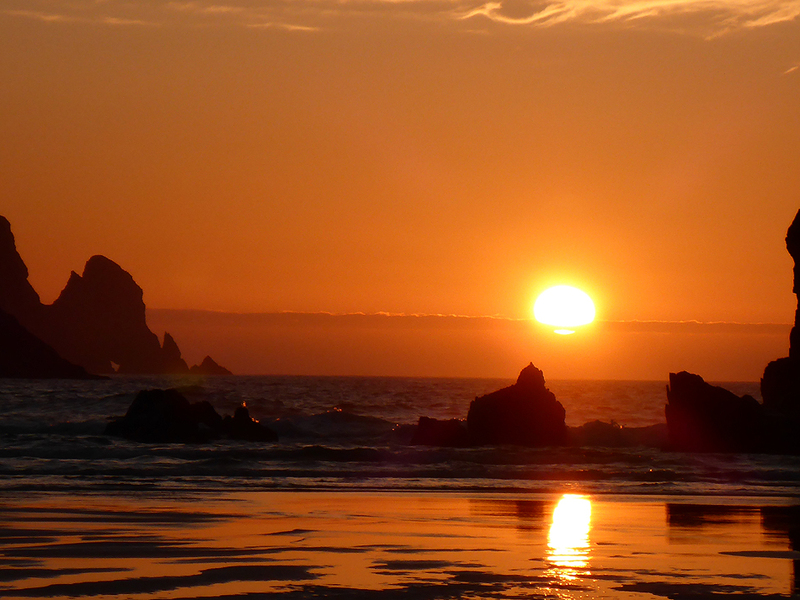 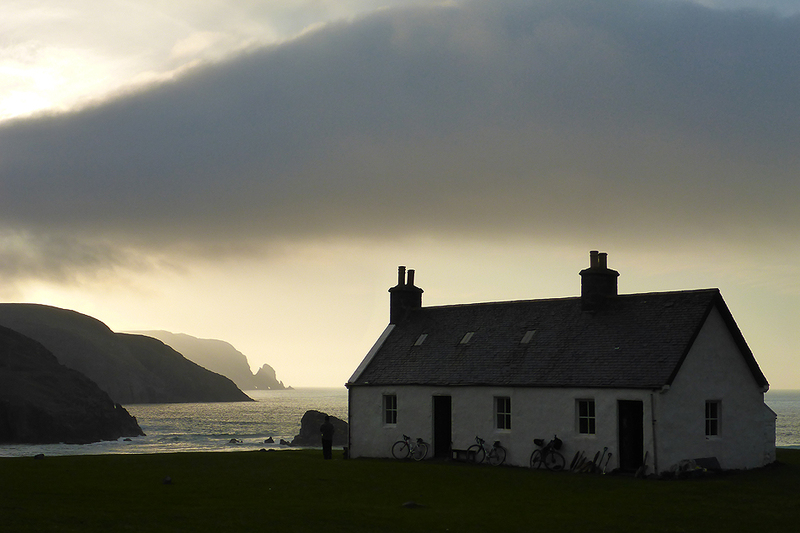 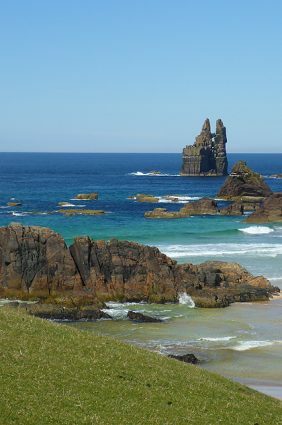 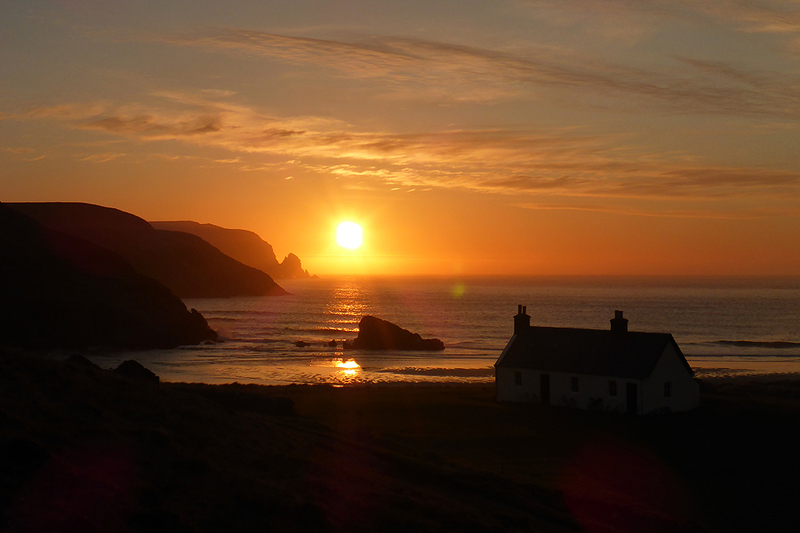 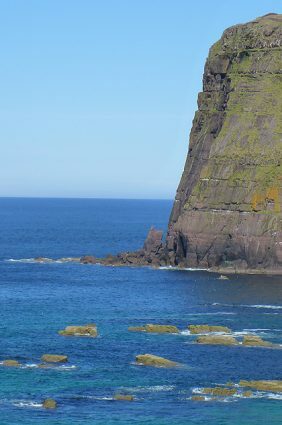 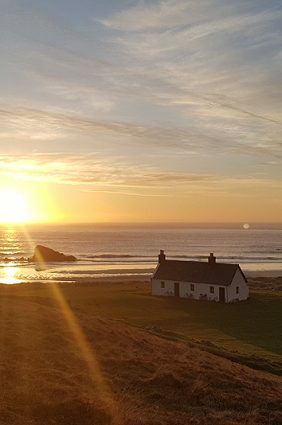 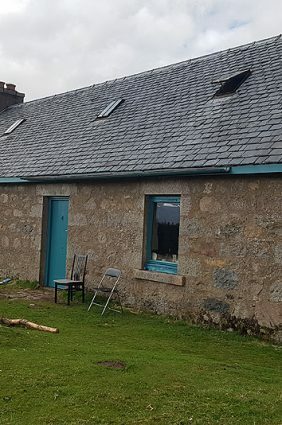 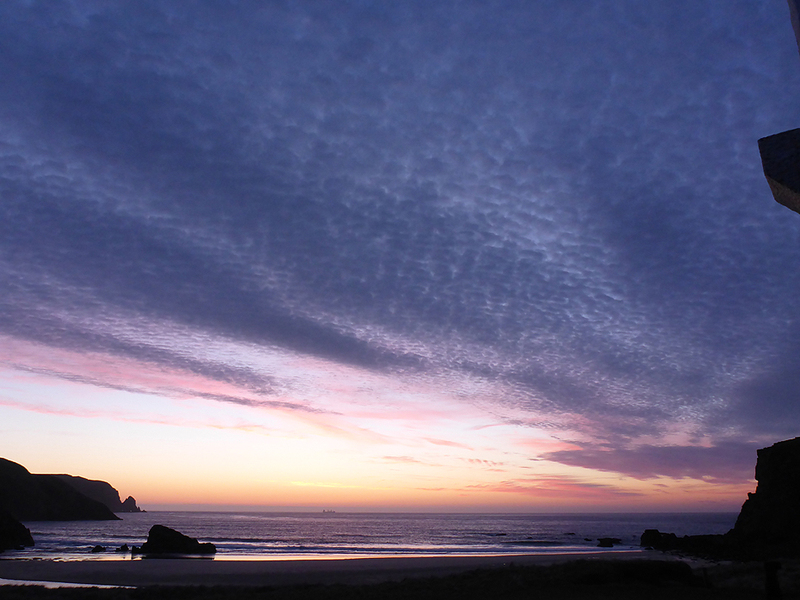 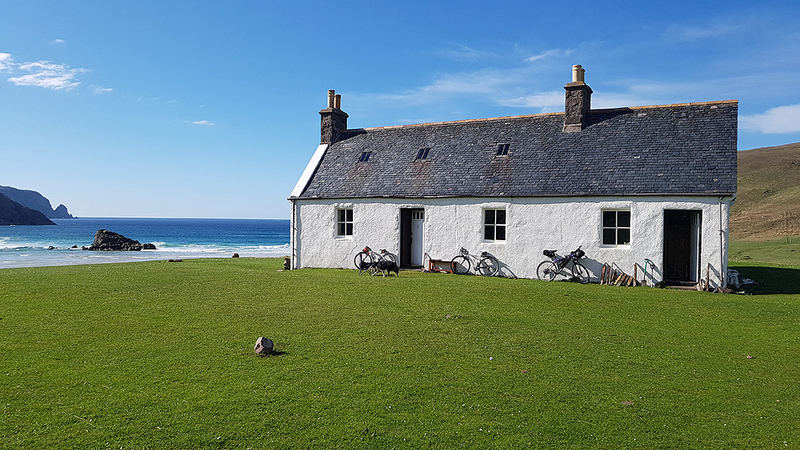 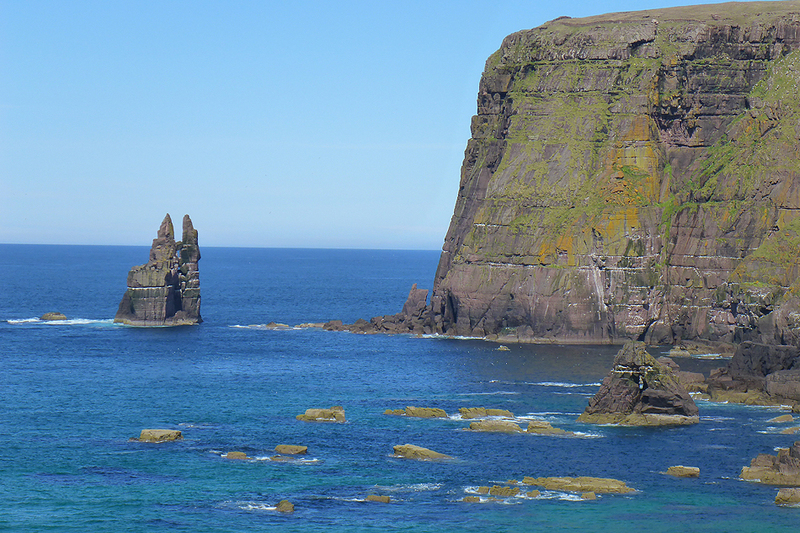 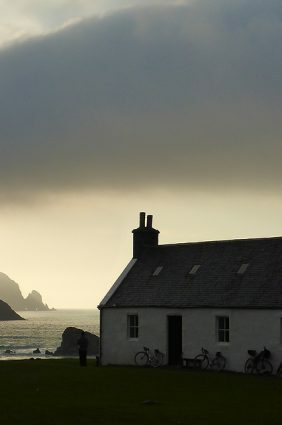 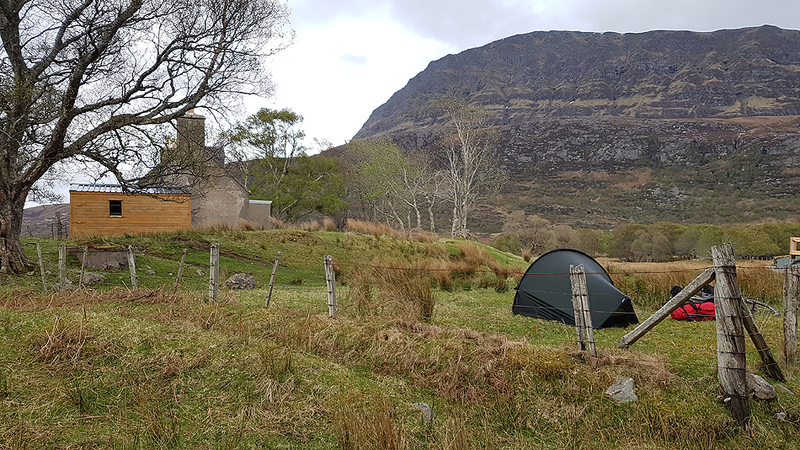 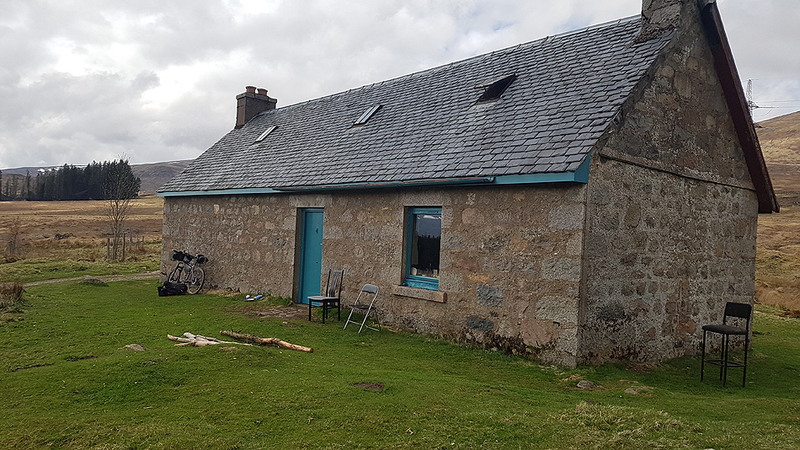 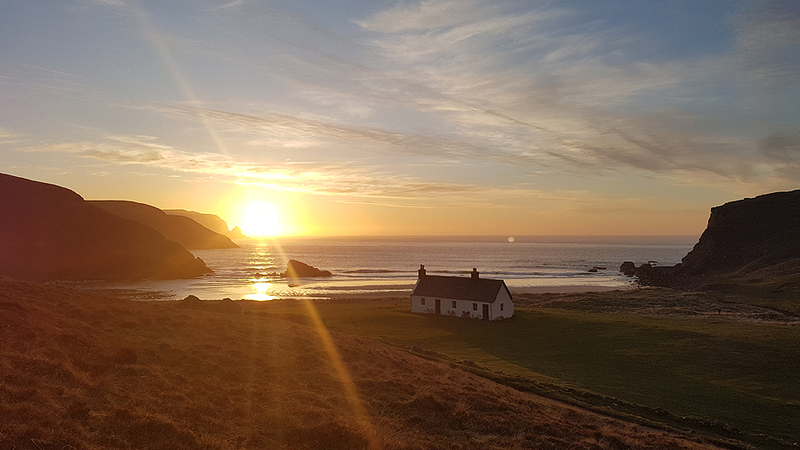 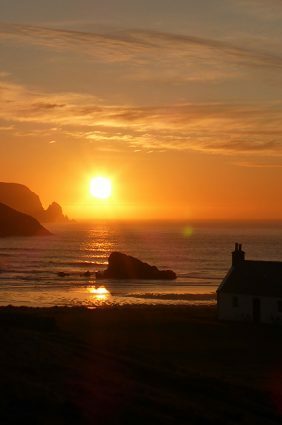 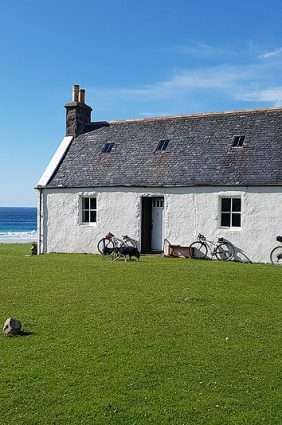 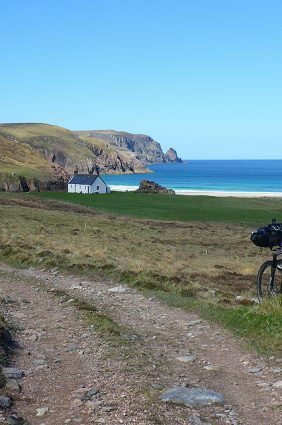 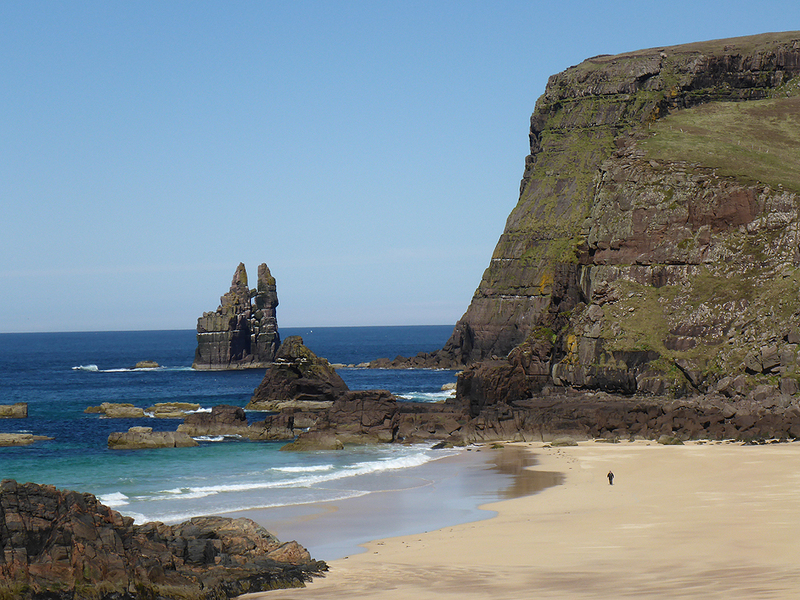 A night in Kearvaig bothy had always been in my plan and I was fortunate to stay in this idyllic, sandy bay, surrounded by vertical sea cliffs in good weather and good company. 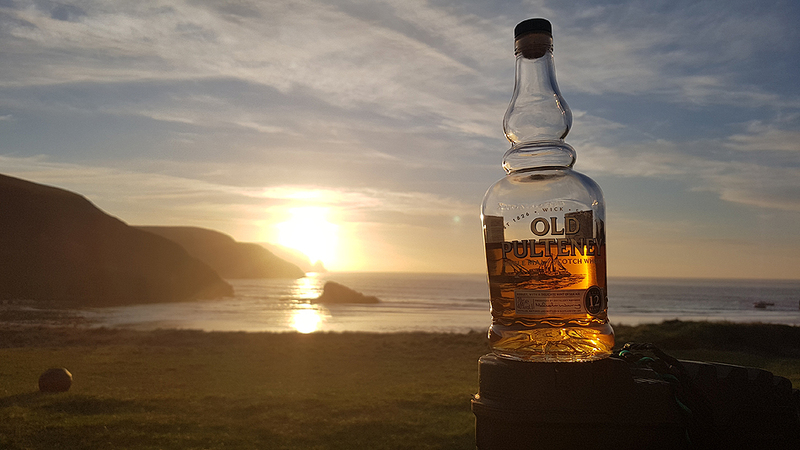 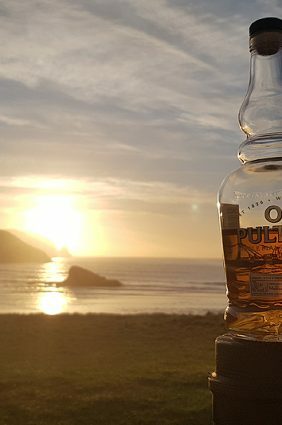 A dram or two from the local distillery added to the perfect last night on the journey. 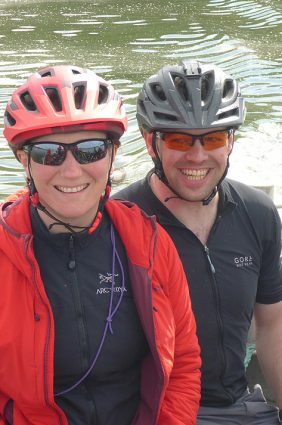 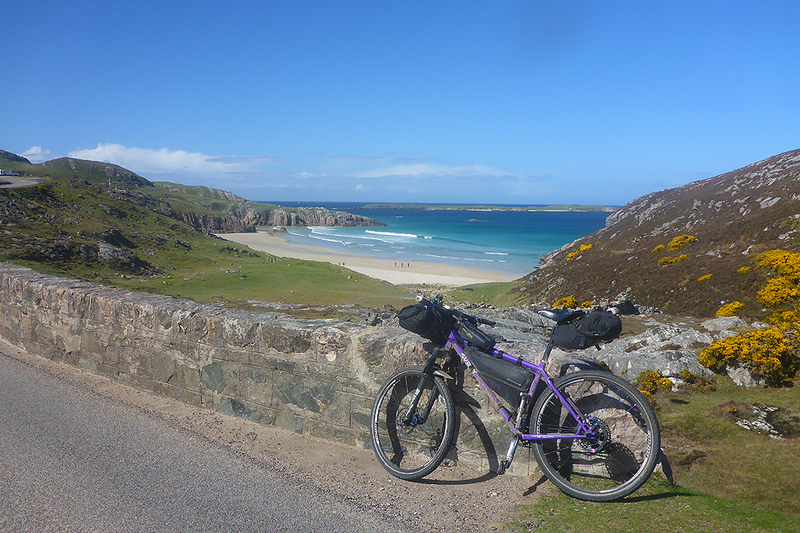 On the last day I was joined by the peleton, including the author of this journey. 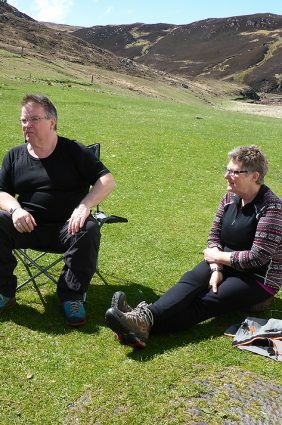 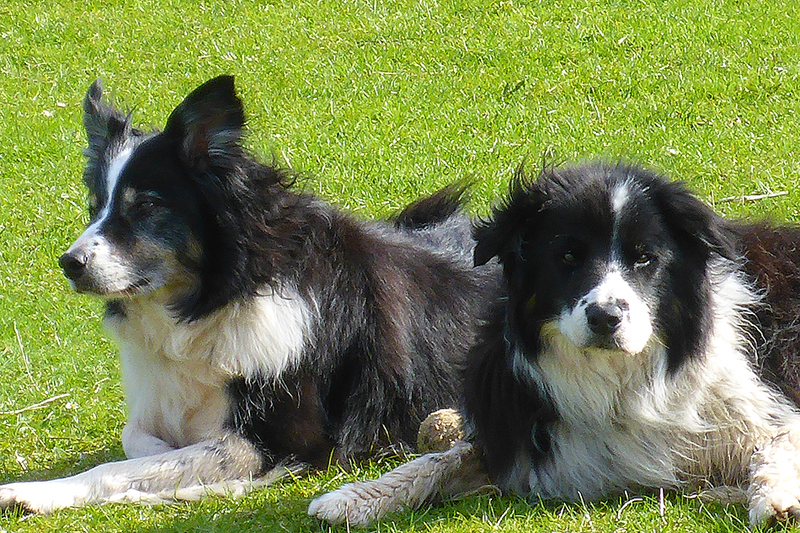 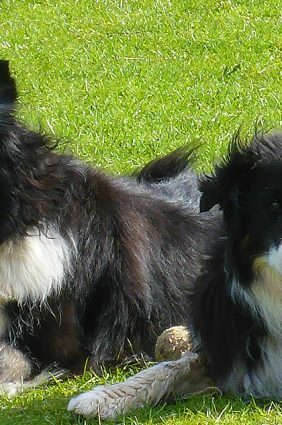 They had completed the trip in a shorter time than my more relaxed pace. 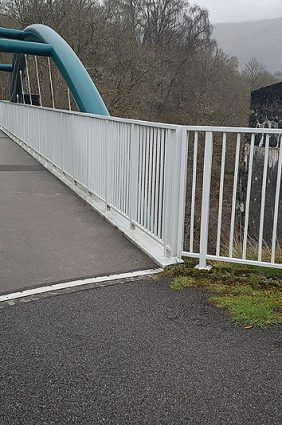 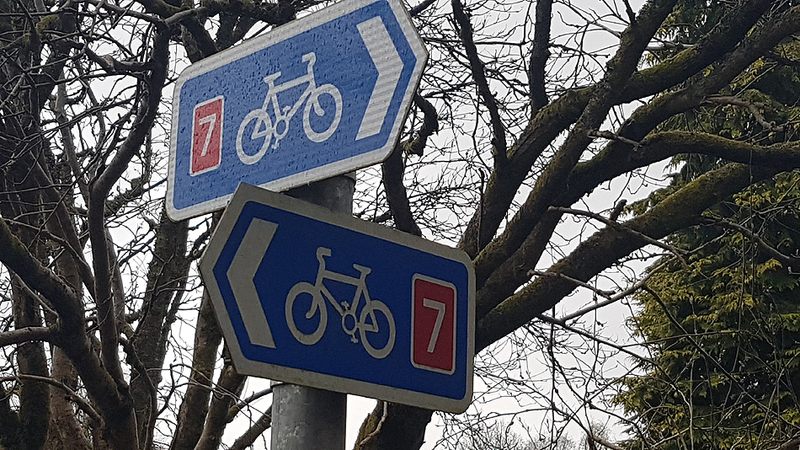 How you ride this route is entirely up to you. 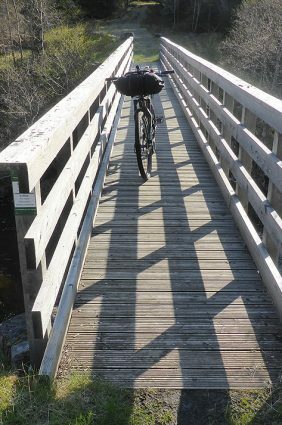 The other riders had started later than me and travelled farther each day. 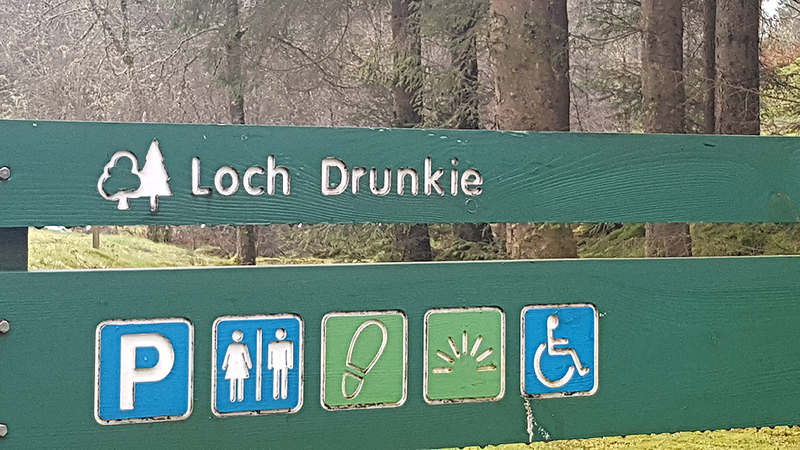 Celebrations were appropriate. 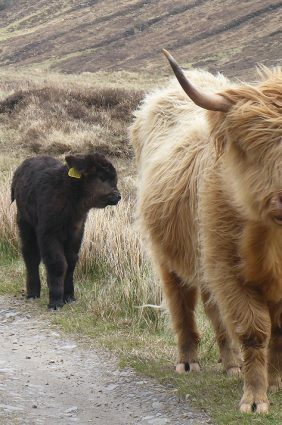 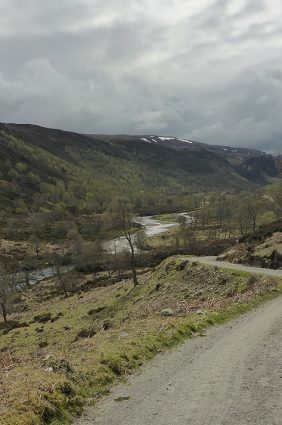 This final section of the journey is characterised by distance views over bleak moorland, softened by occasional gorse forests. 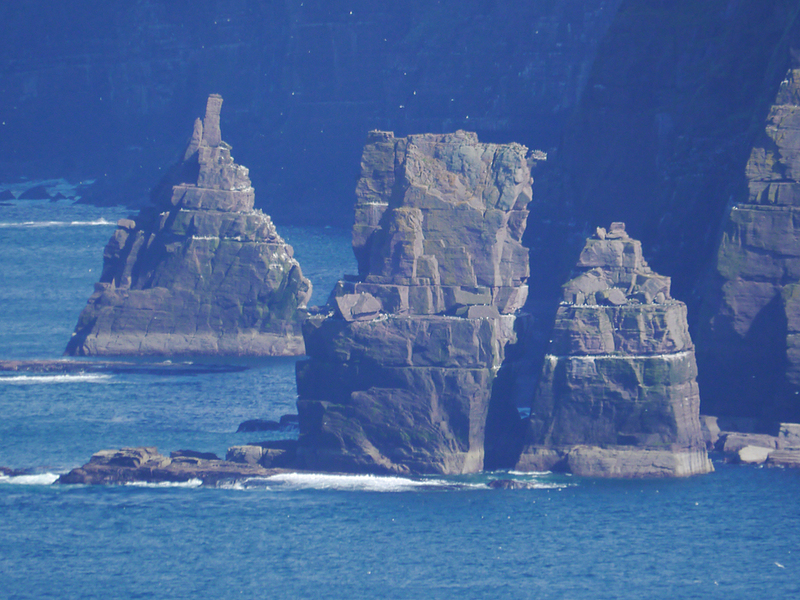 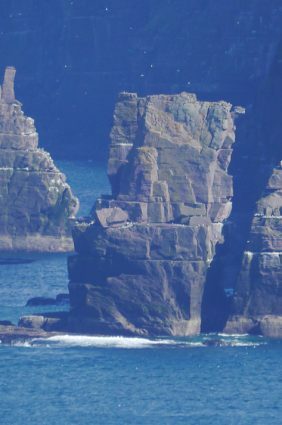 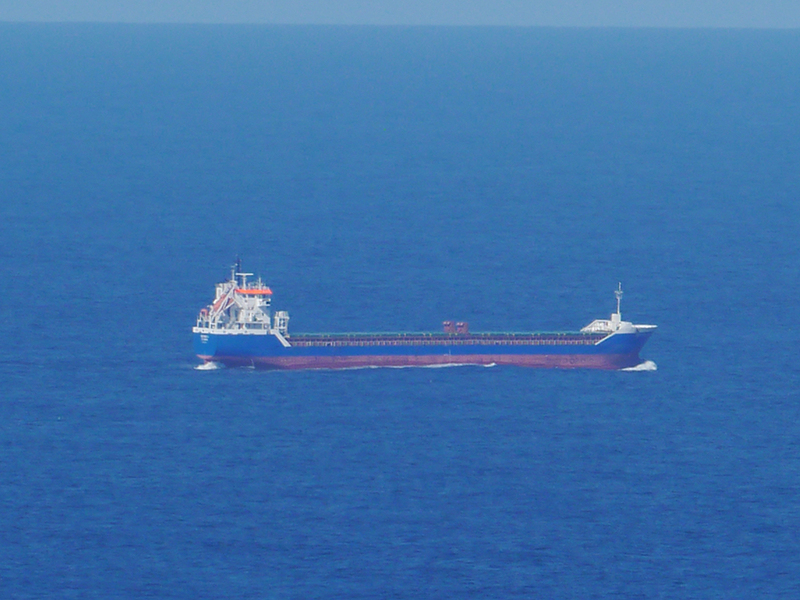 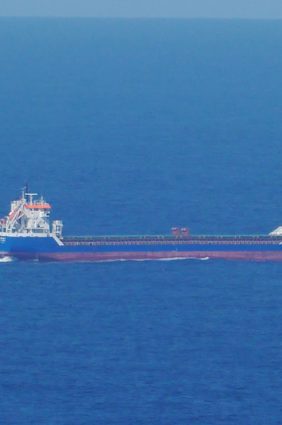 The astonishing tide races of the Pentland Firth colliding with the Atlantic Ocean often provide a glimpse, benign or otherwise. 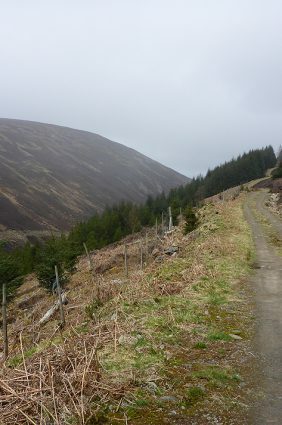 The track is the usual rutted and puddled surface, with a central comb of grass and weeds. 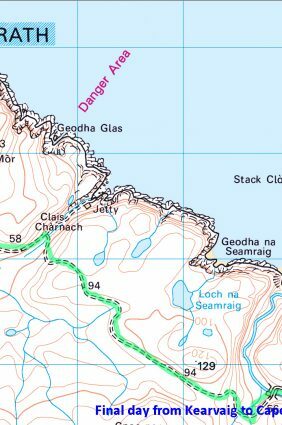 The steepest section appears immediately after you leave the ferry. 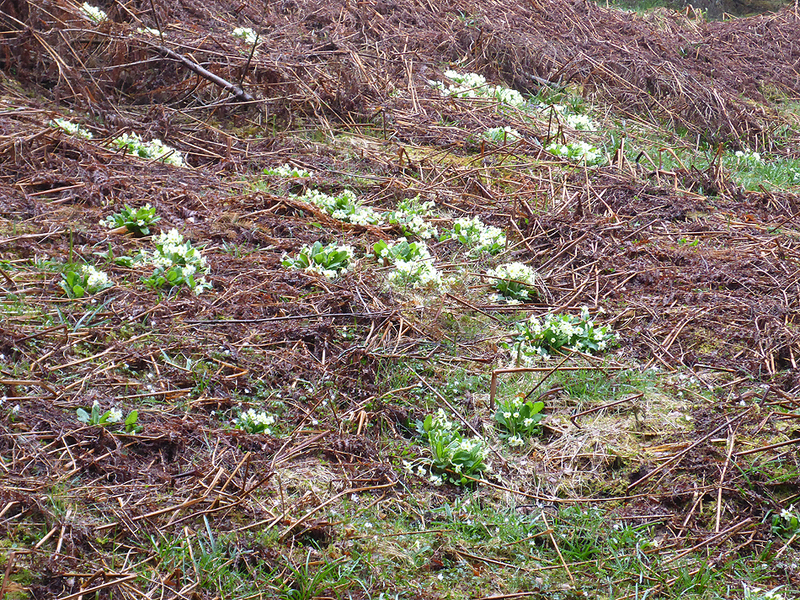 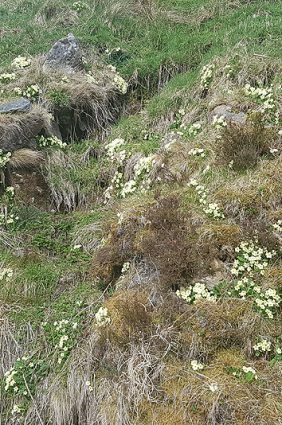 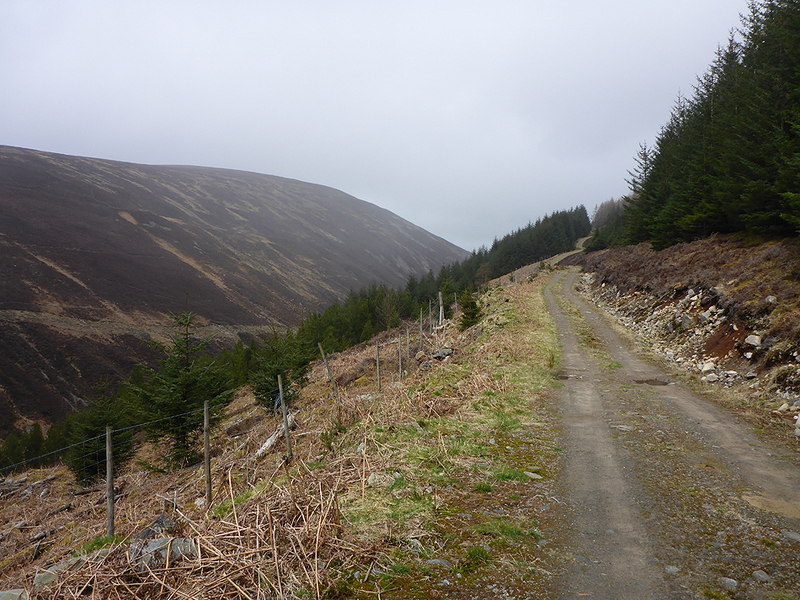 Beyond that, mostly gentle inclines are the order of the day. 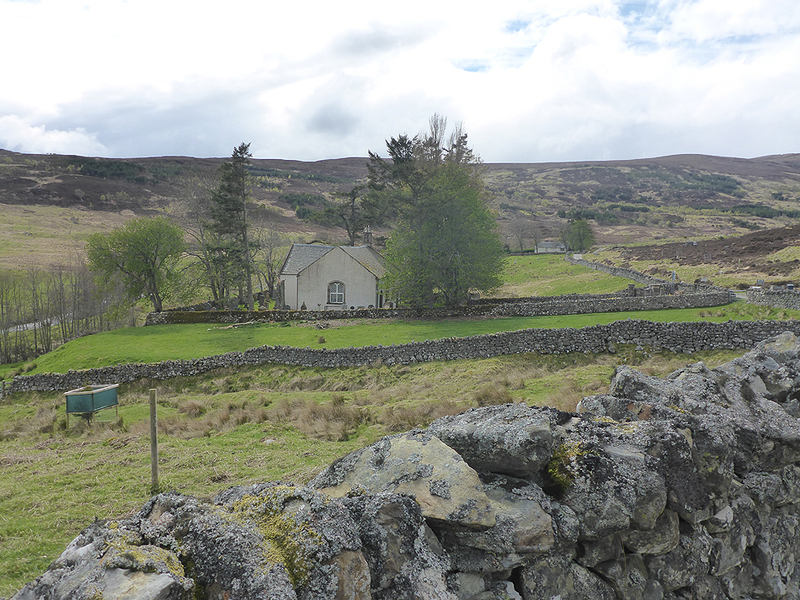 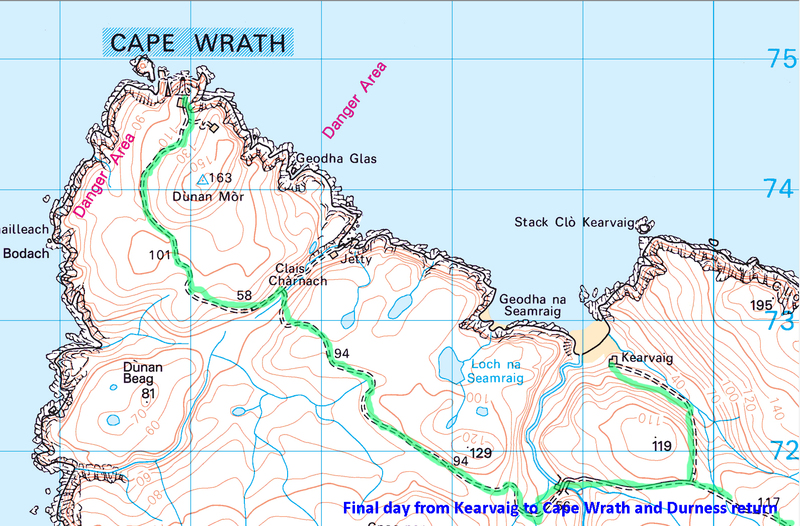 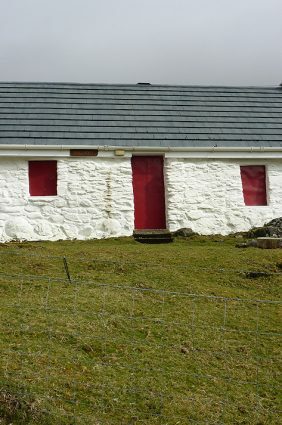 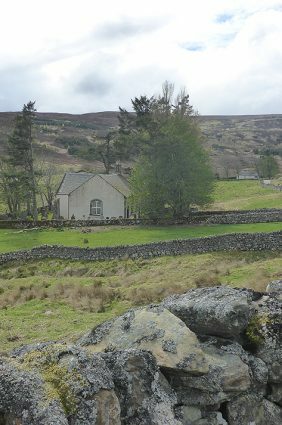 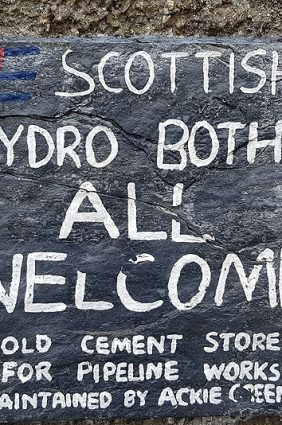 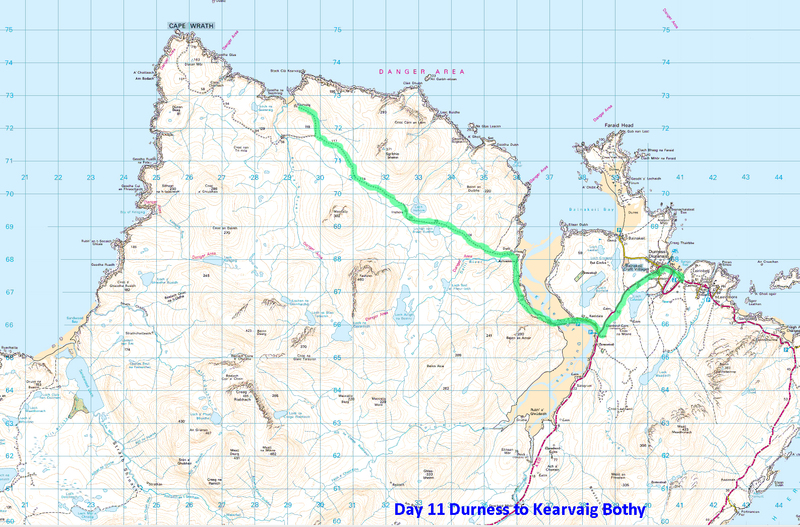 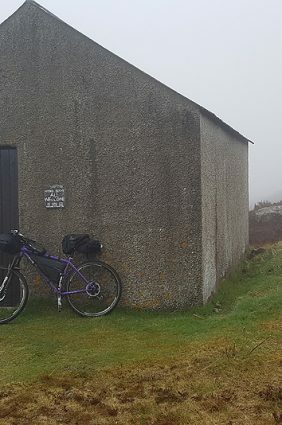 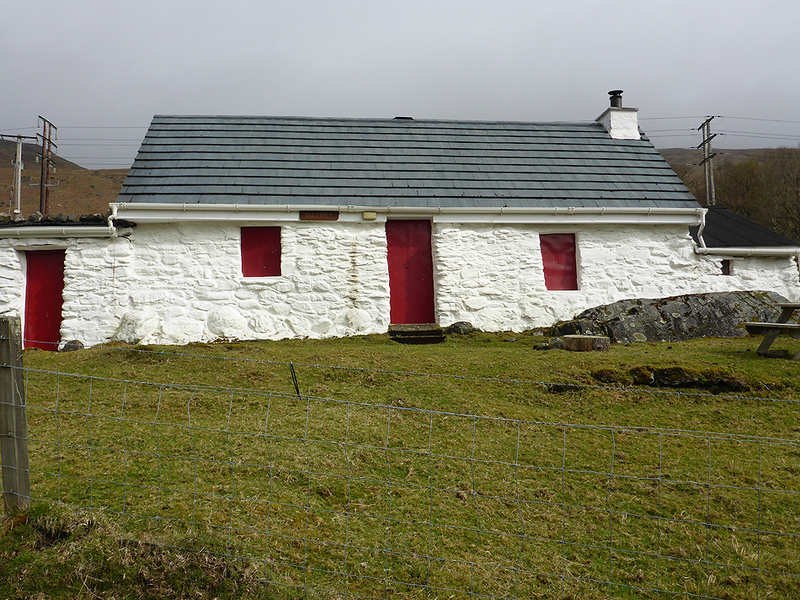 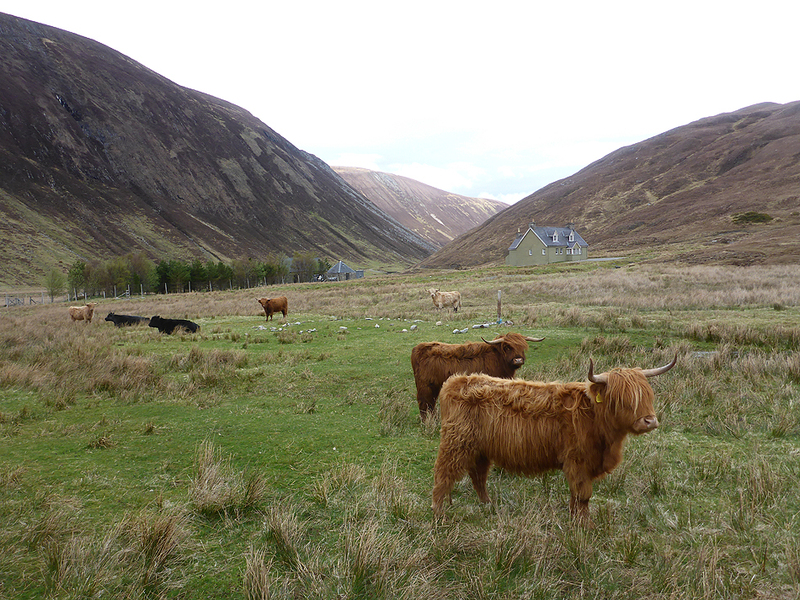 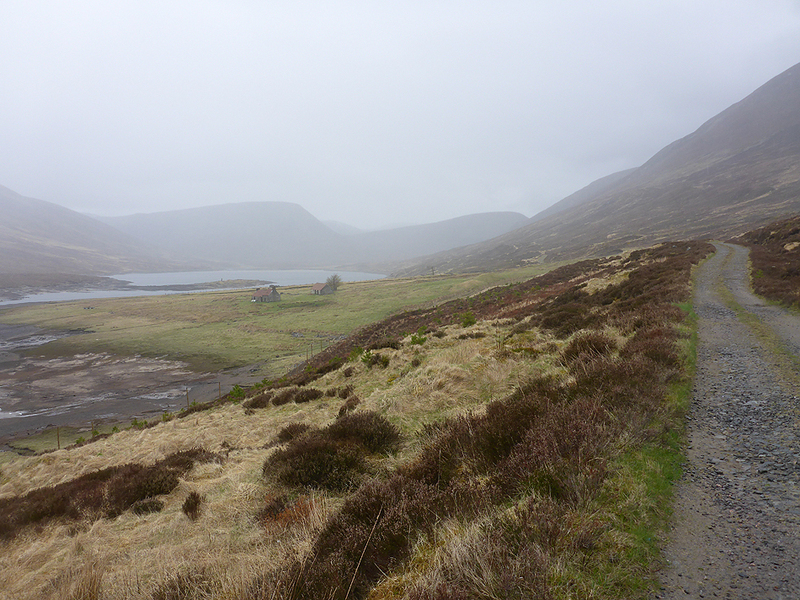 Kearvaig Bothy is a rough side turning off of the route to Cape Wrath, that only takes ten minutes to descend. 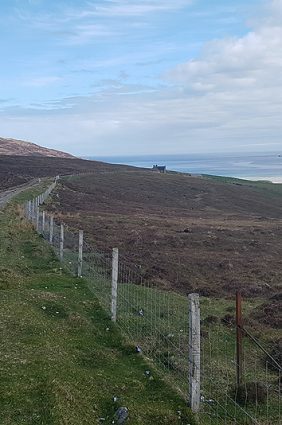 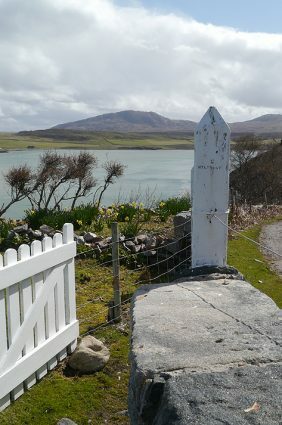 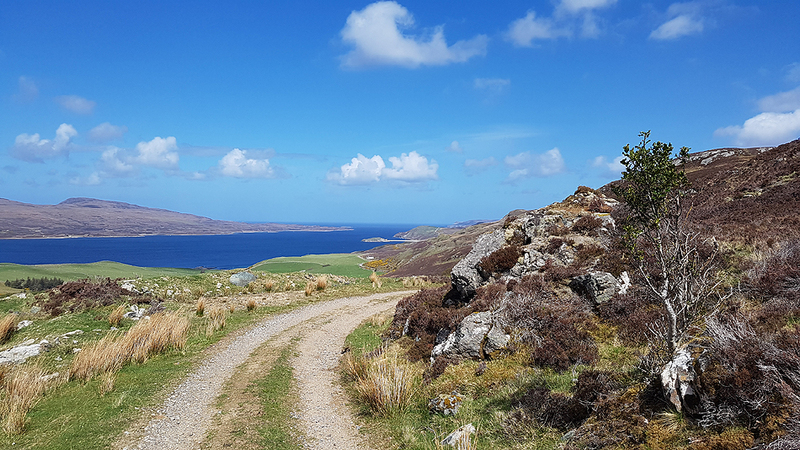 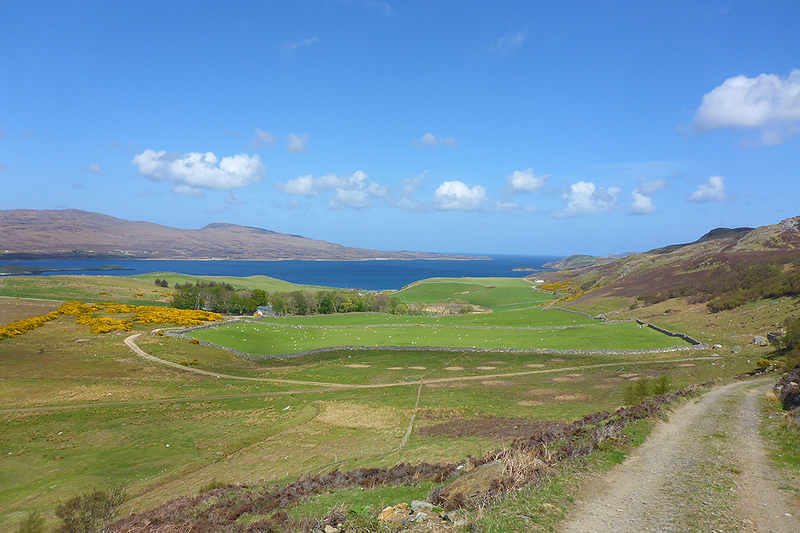 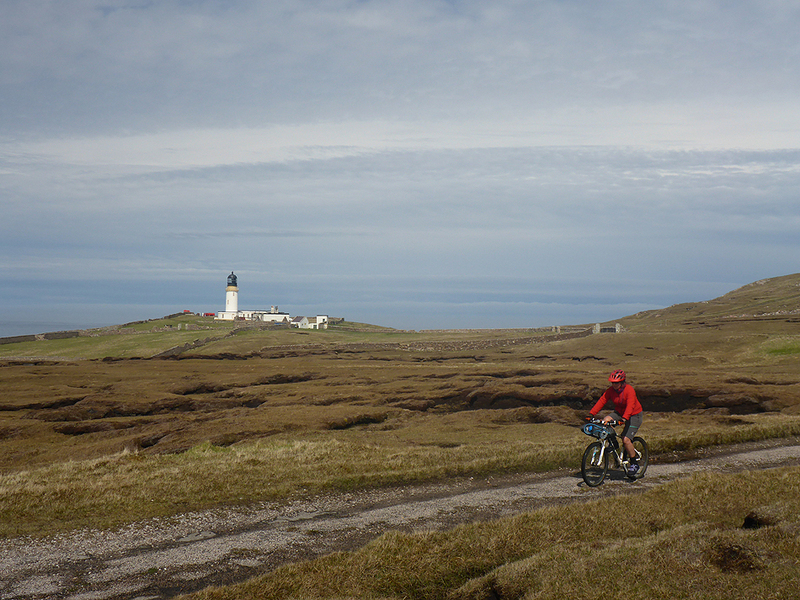 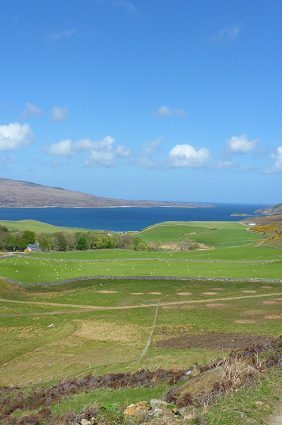 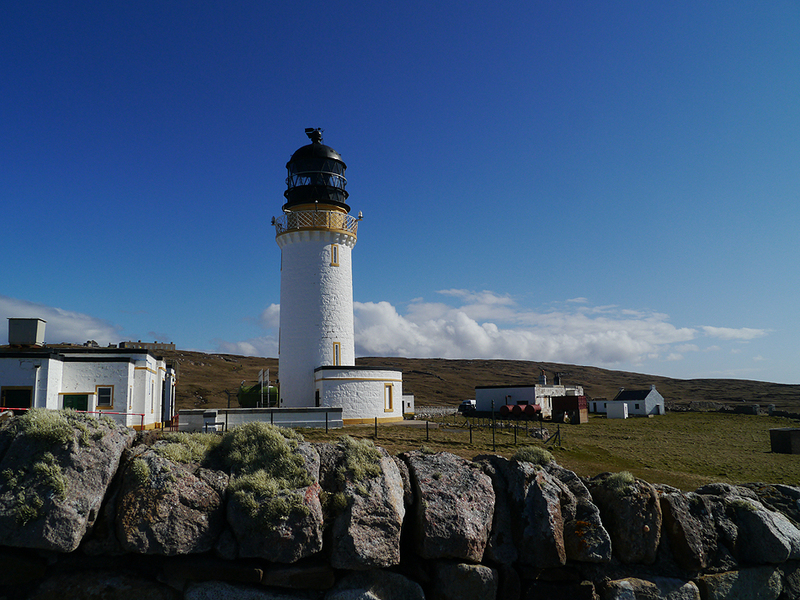 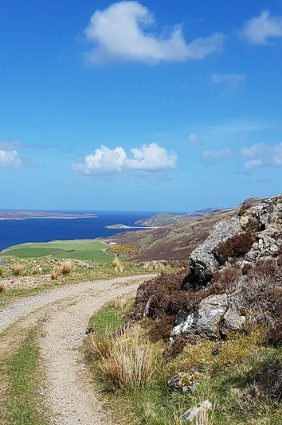 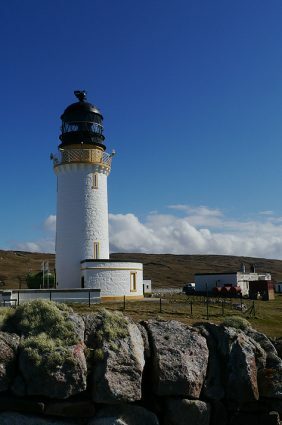 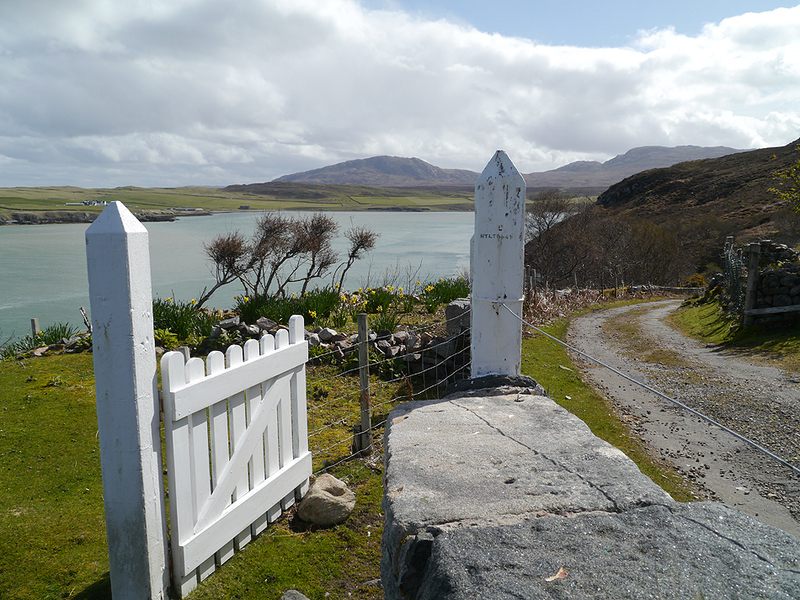 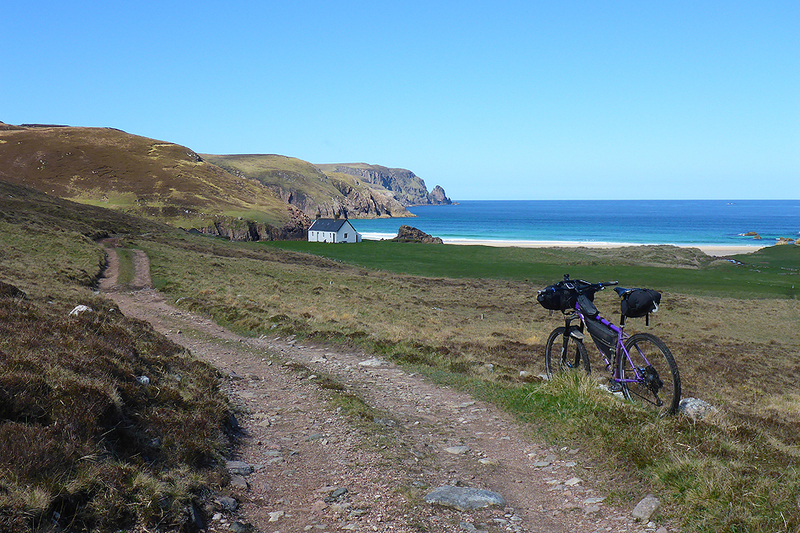 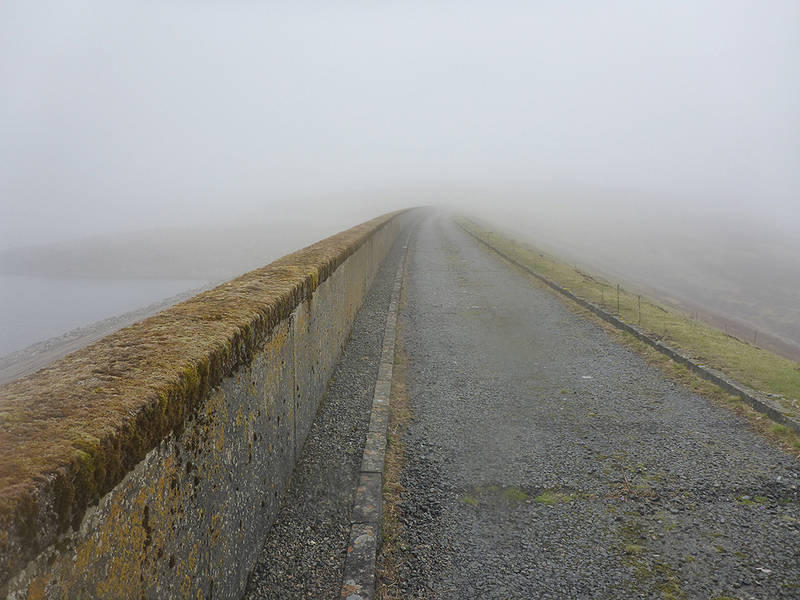 Climb back up from the bothy and the route to the lighthouse and Cape Wrath Cafe is short and clear. 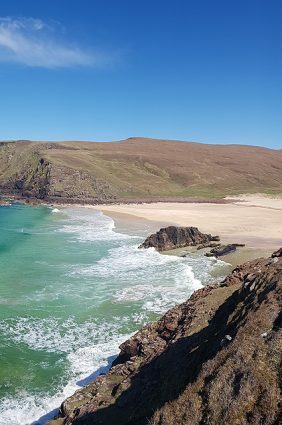 From the concrete canyons of Glasgow and the River Clyde to this perfect finish will remain a highlight for me, forever. 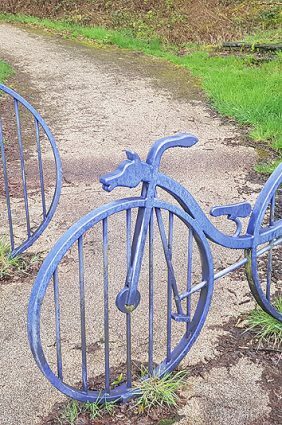 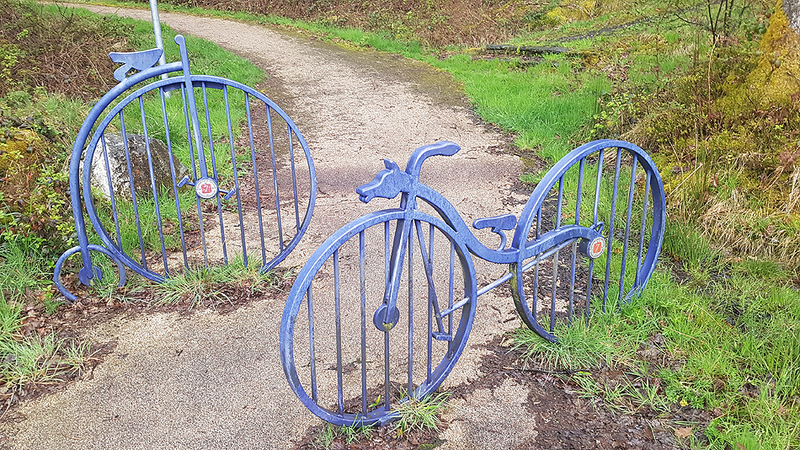 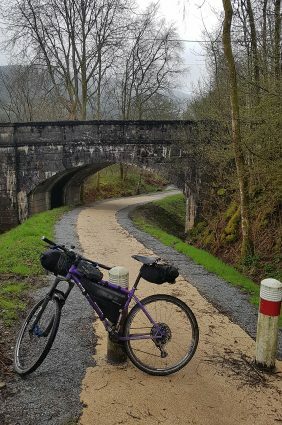 Thanks to Dave Wilson, whose restless mind conceived and researched this route of of the ‘Long Journey’ Without his inspiration I doubt I’d ever have cycled this way. 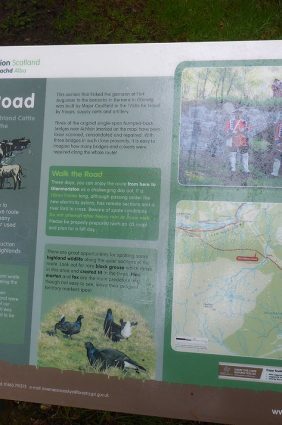 A guide book is available. 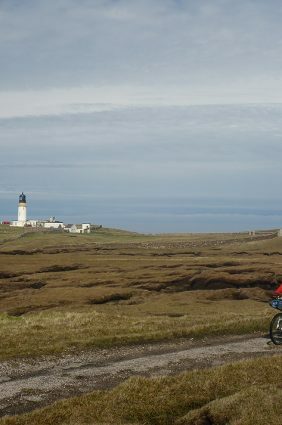 Hereabouts, many vehicles are on the road, following the North Coast 500. 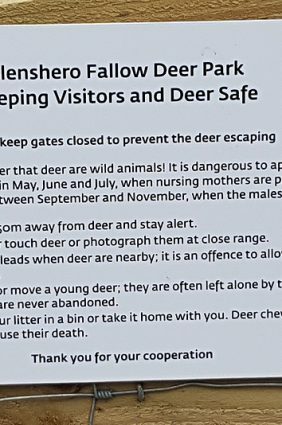 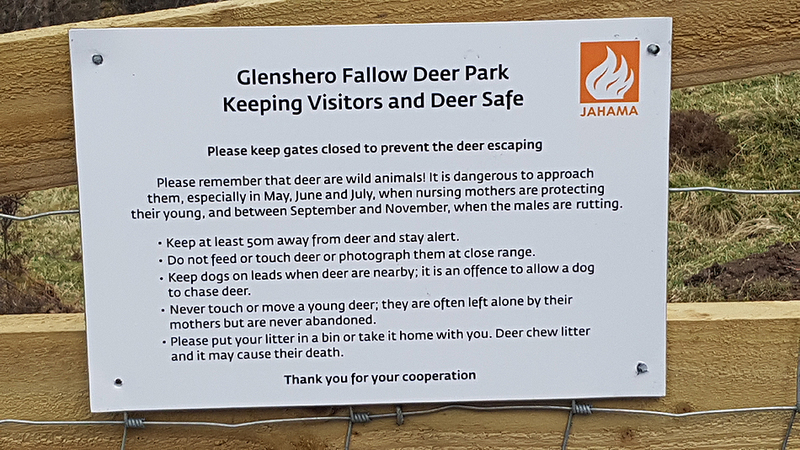 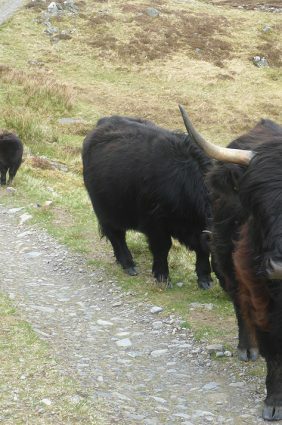 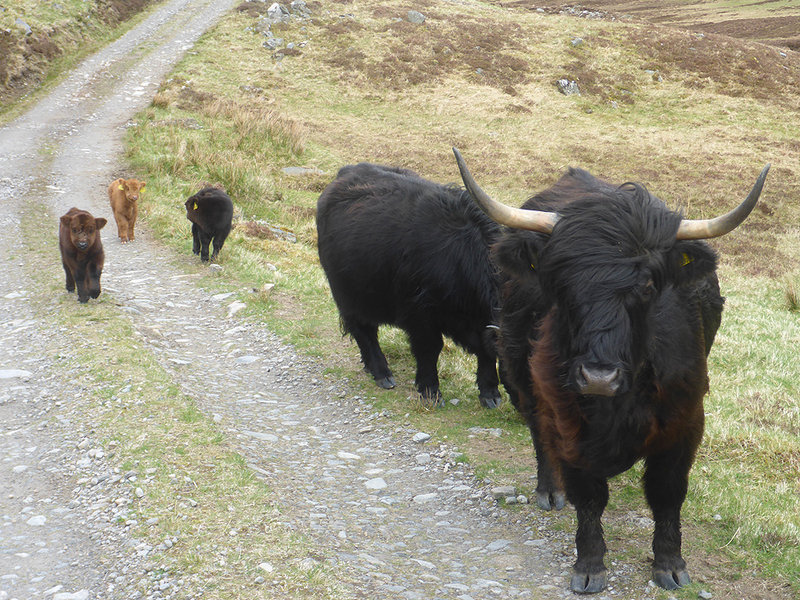 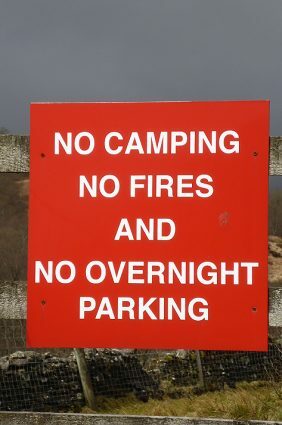 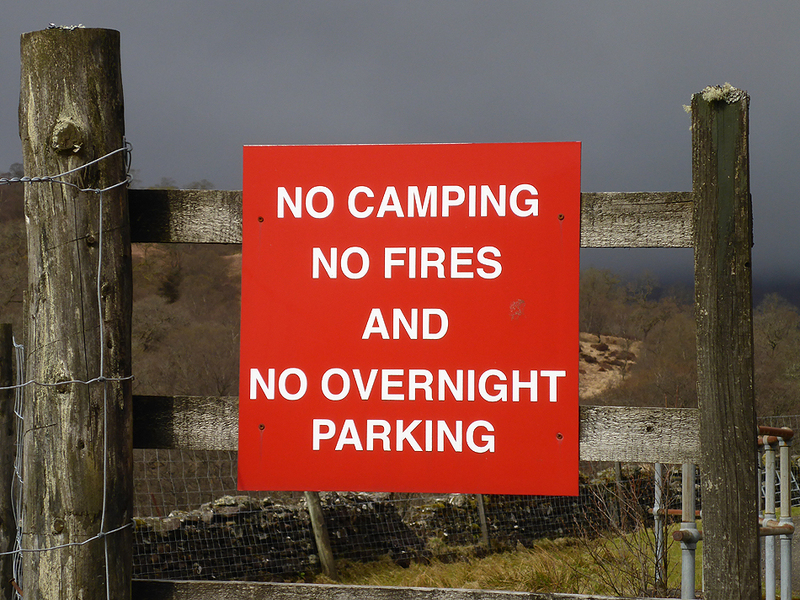 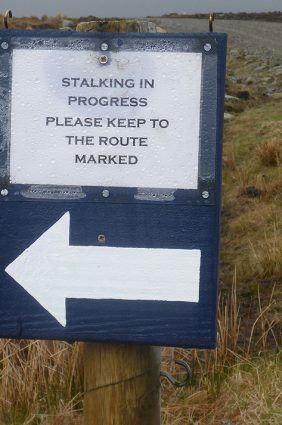 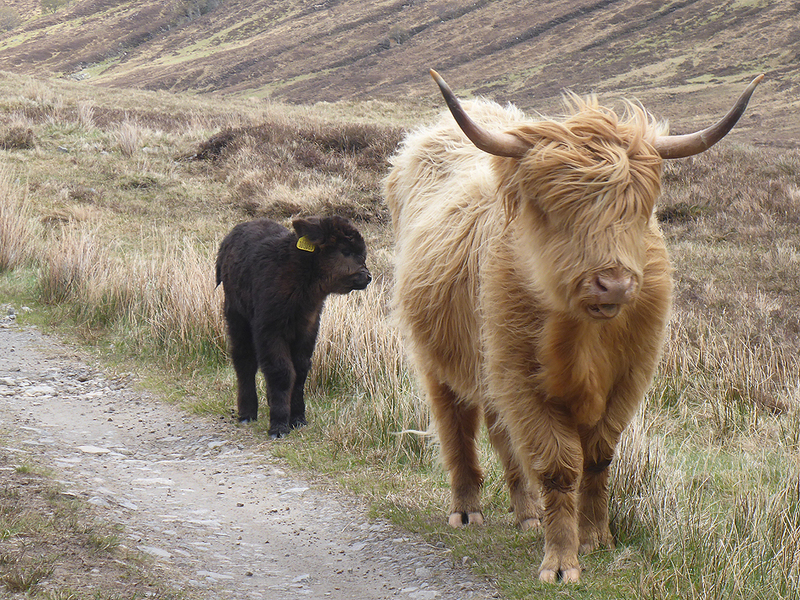 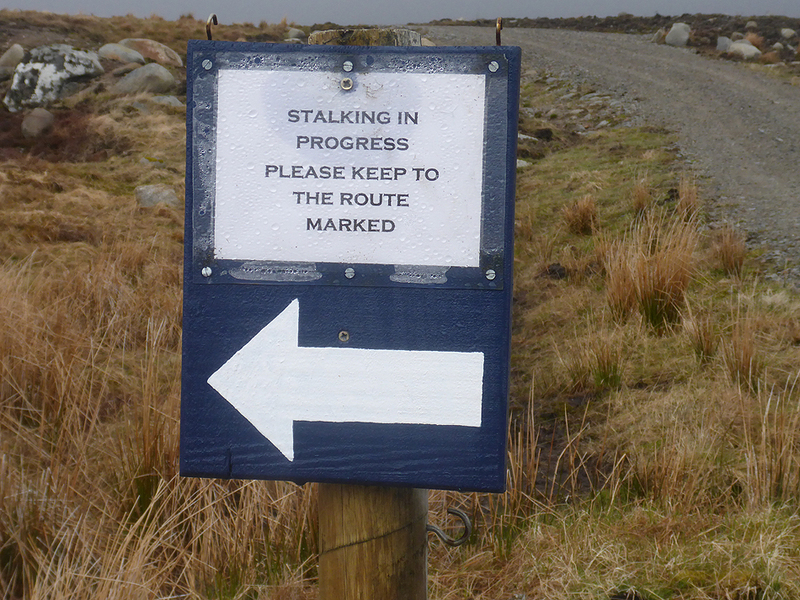 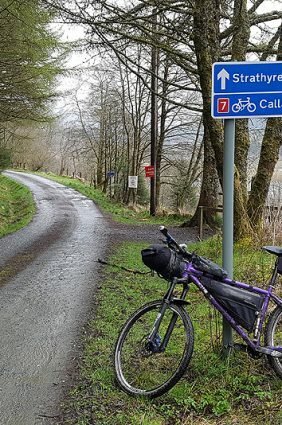 Be wary, as the single-track paved roads with passing places are inhabited by people, not used to this system. 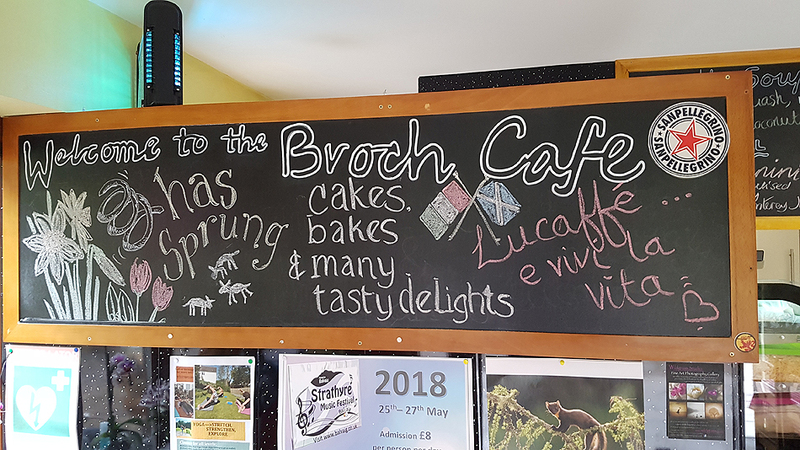 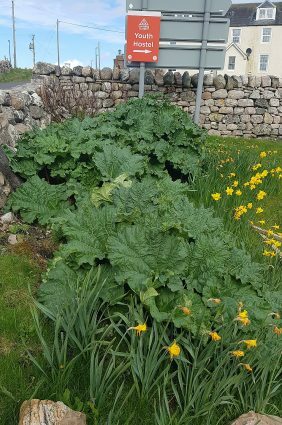 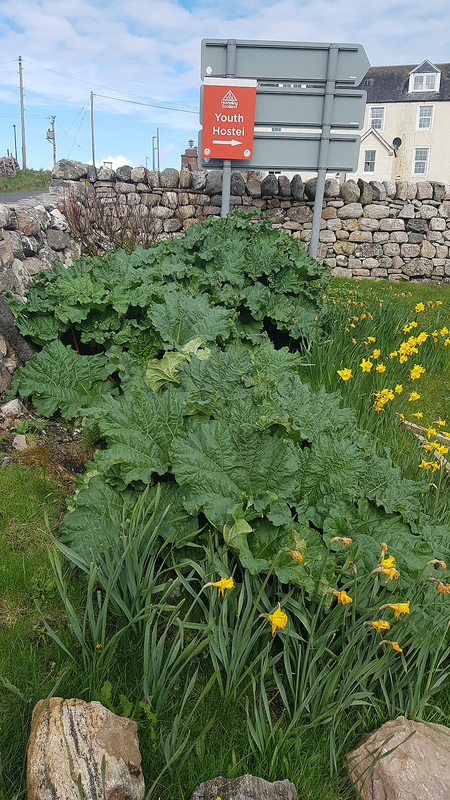 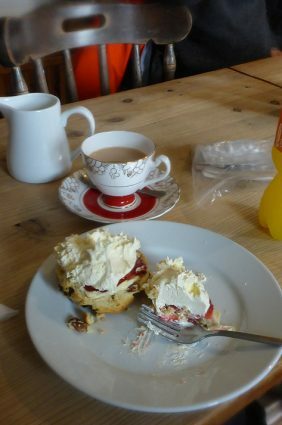 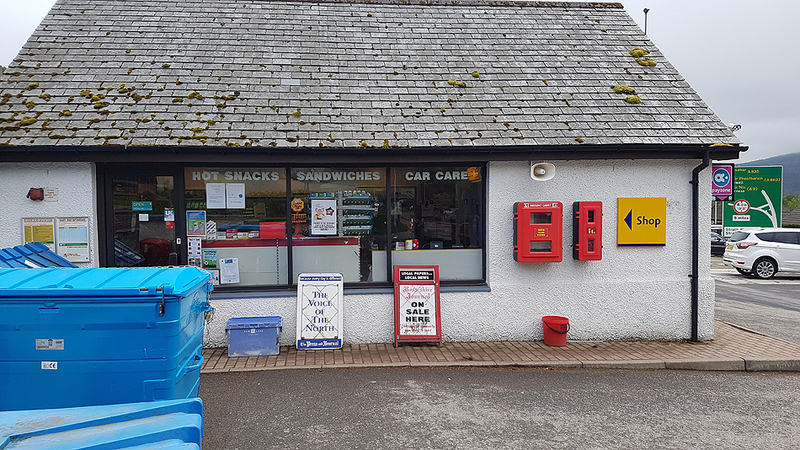 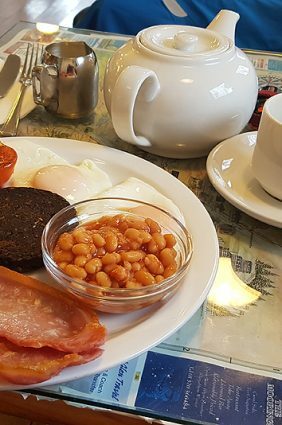 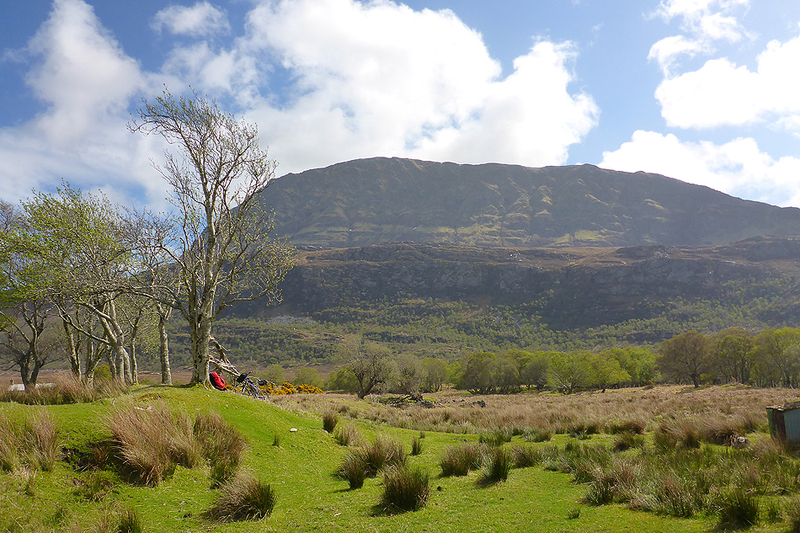 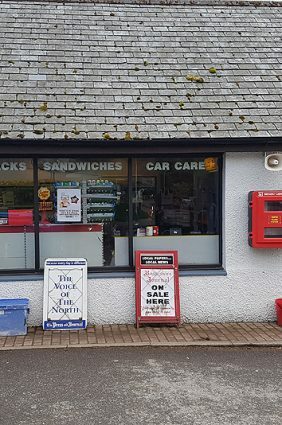 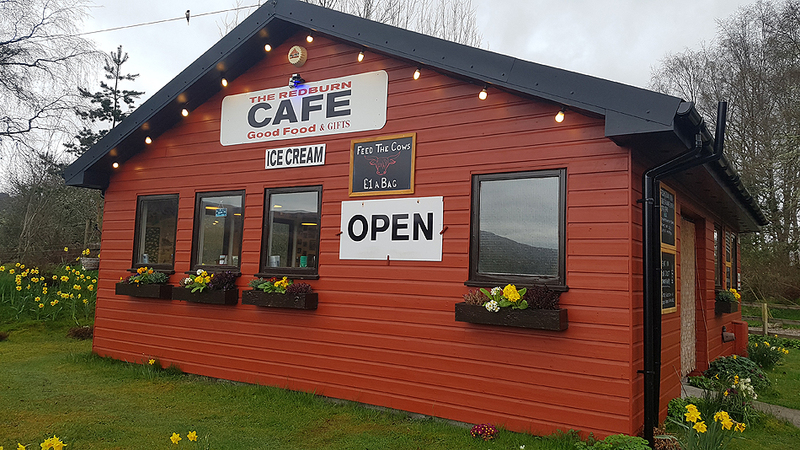 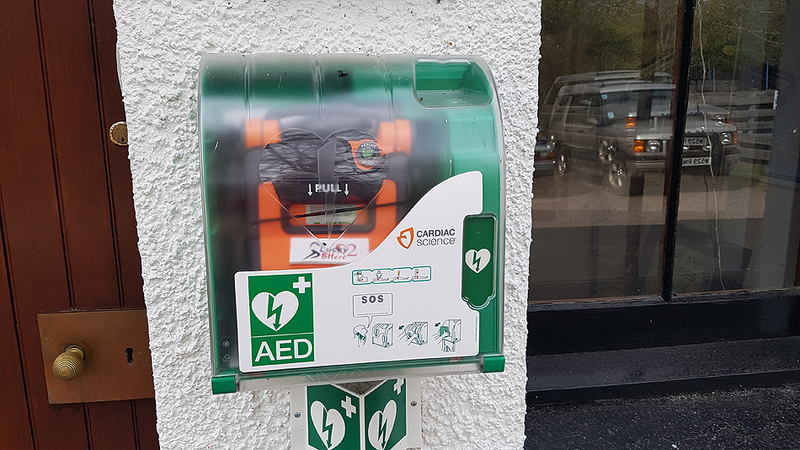 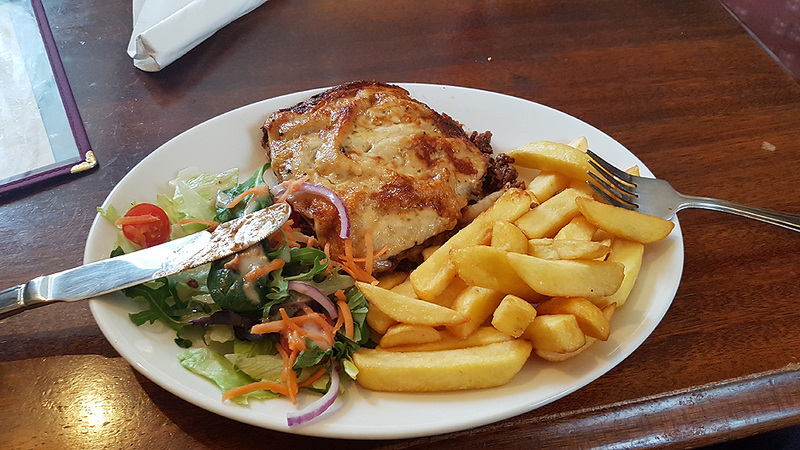 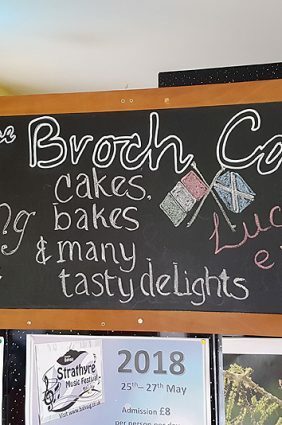 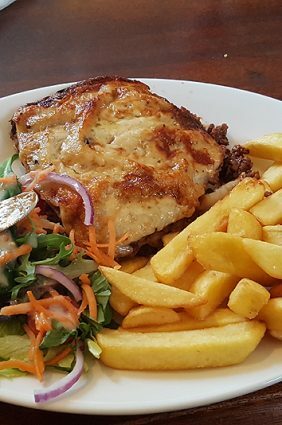 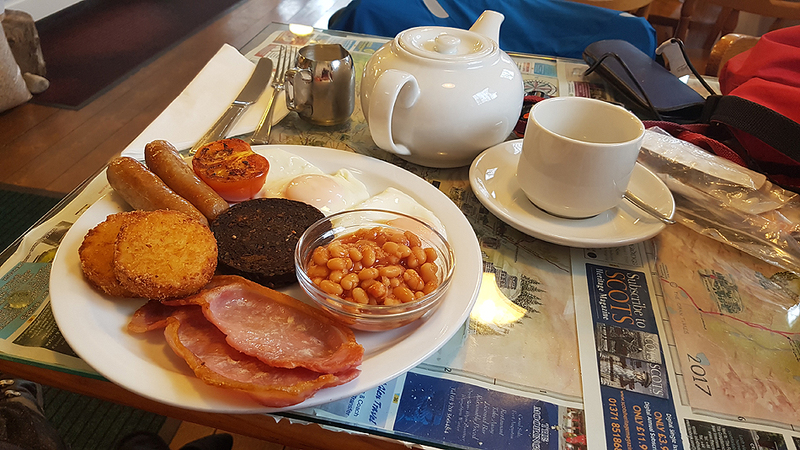 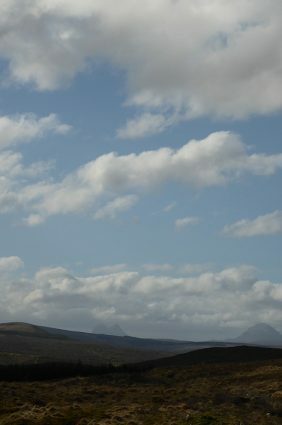 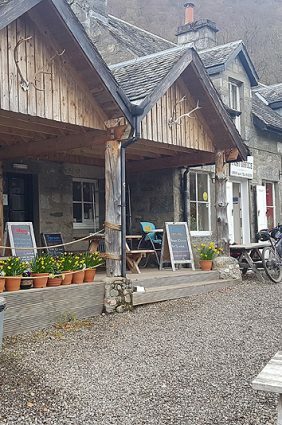 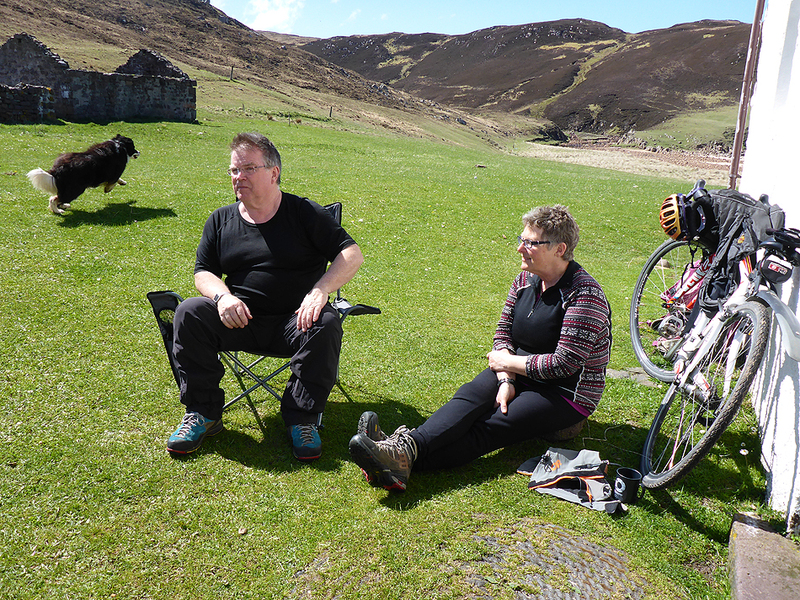 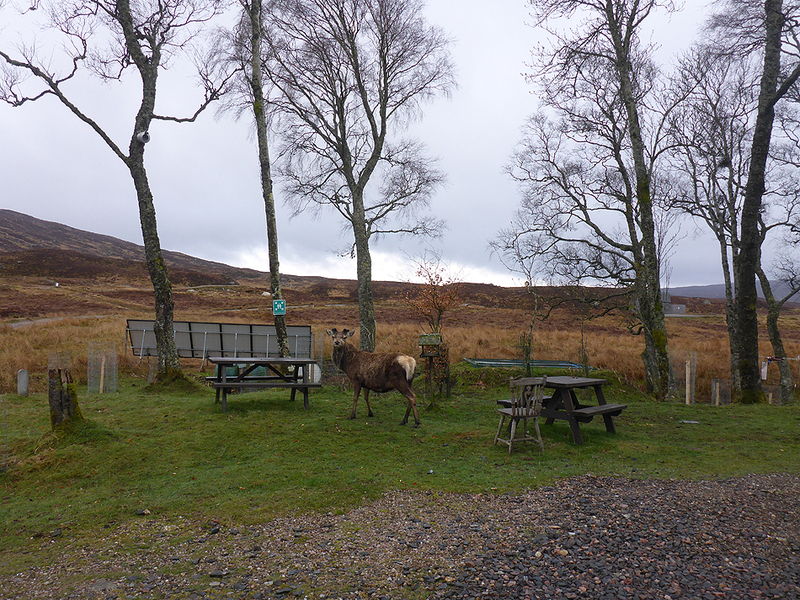 Swing in to The Tearoom for a calming rest stop, before heading on to the very busy little village of Durness. 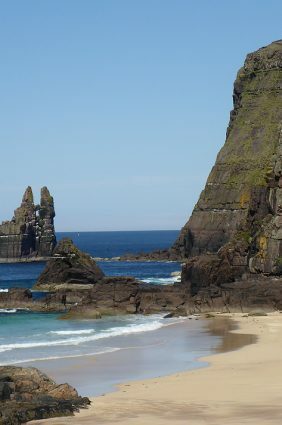 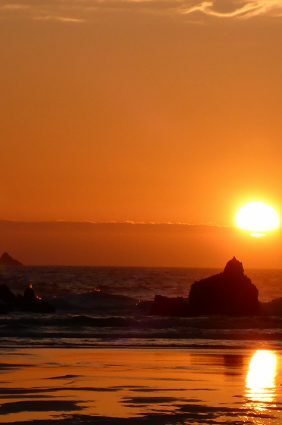 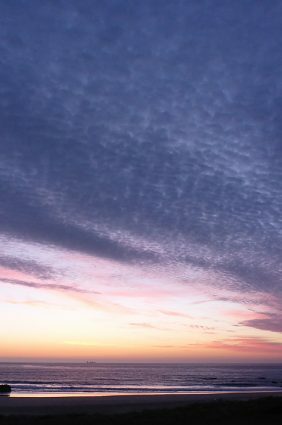 Again, be wary of where you stop to photograph the stunning coastline, as it unfolds with sandy beaches and rugged cliffs. 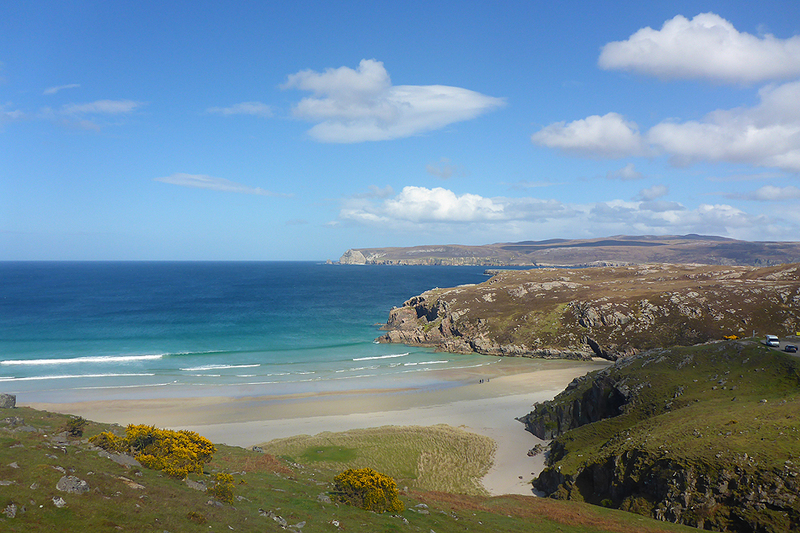 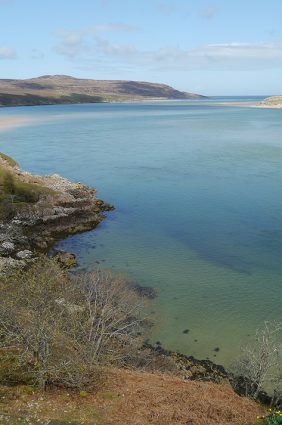 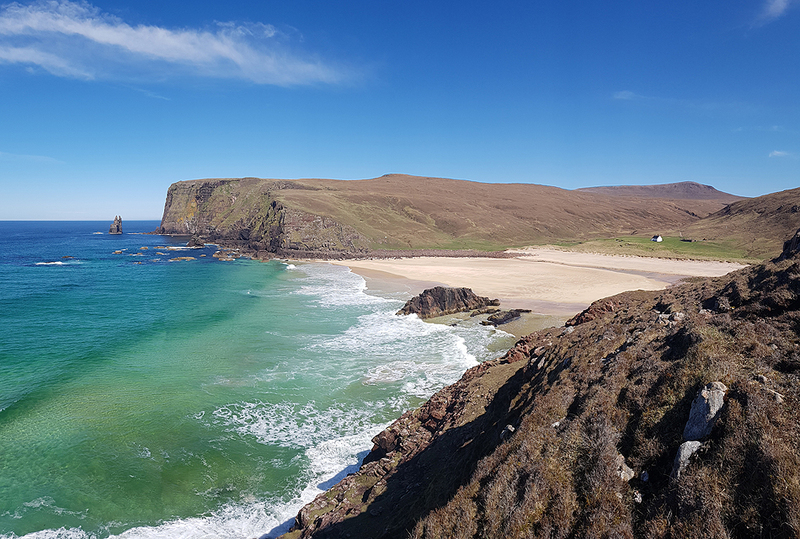 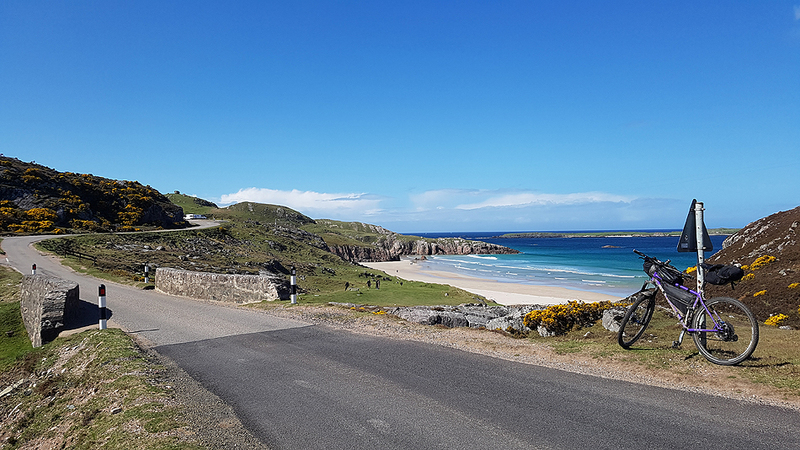 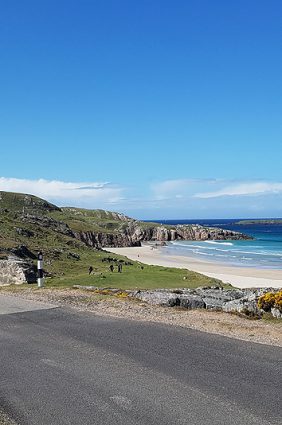 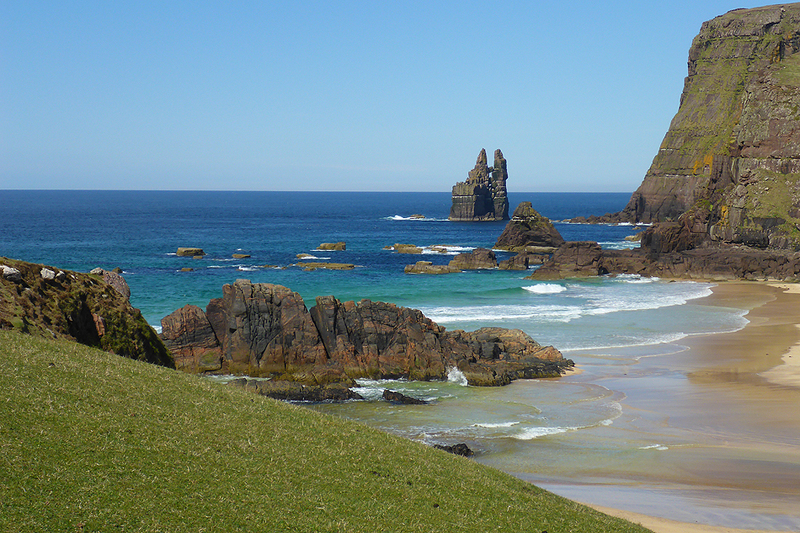 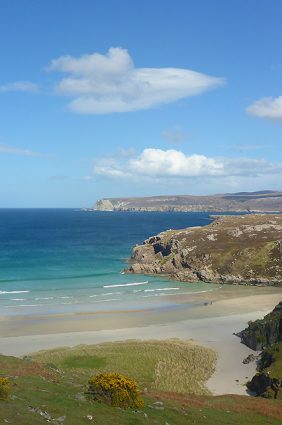 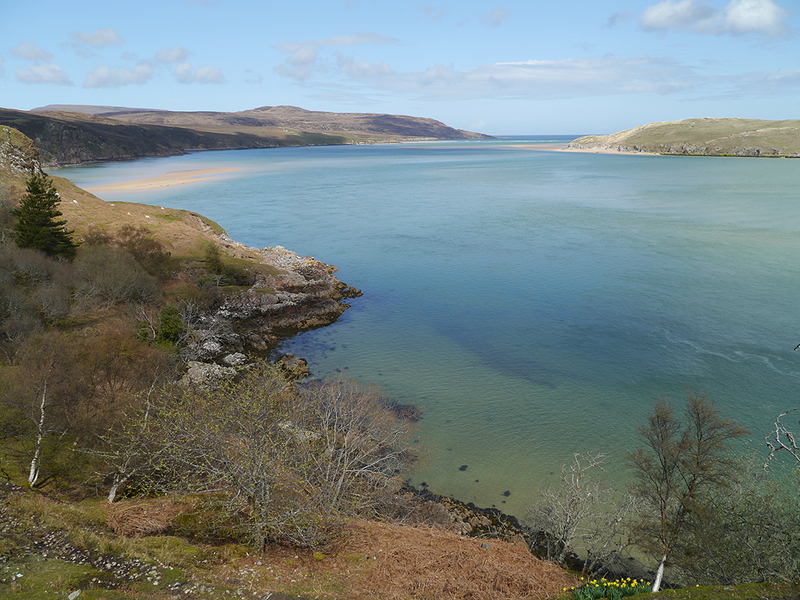 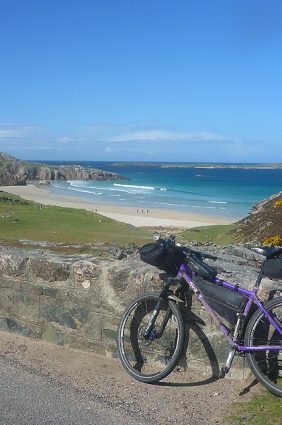 The first beach to appear is Traigh allt Chailgeag A couple of nights rest at the SYHA Durness hostel before heading over to Cape Wrath. 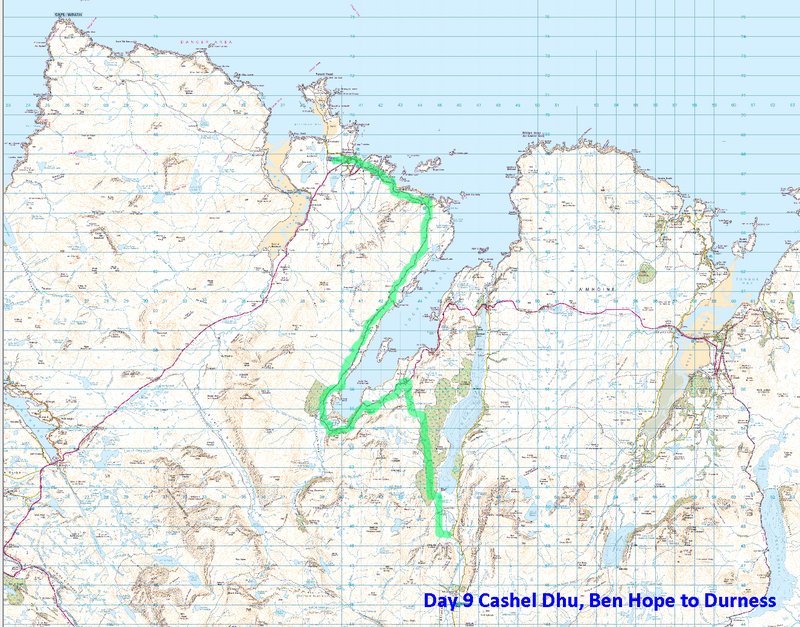 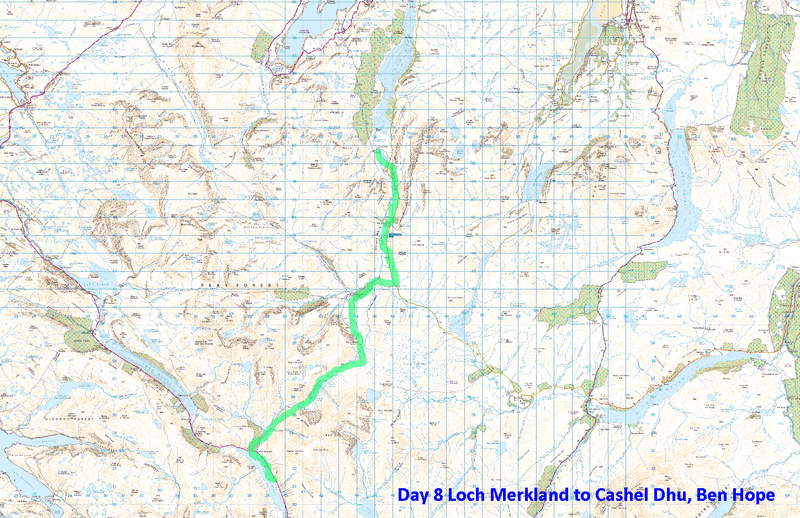 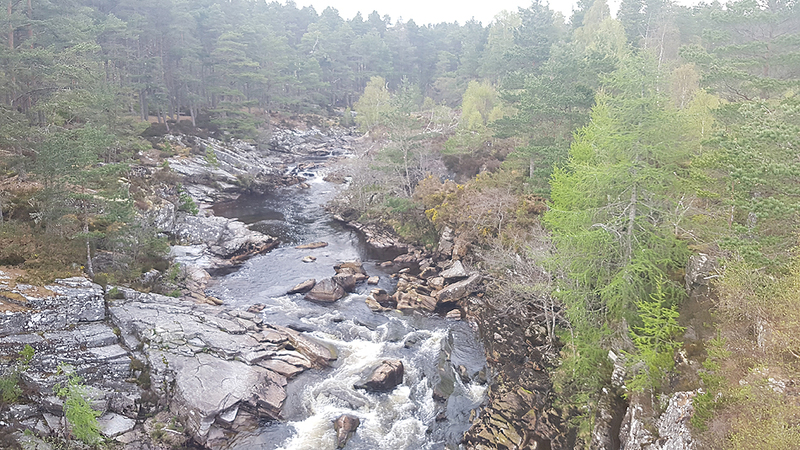 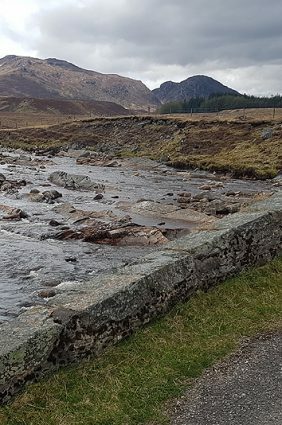 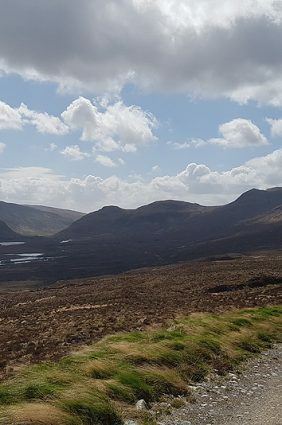 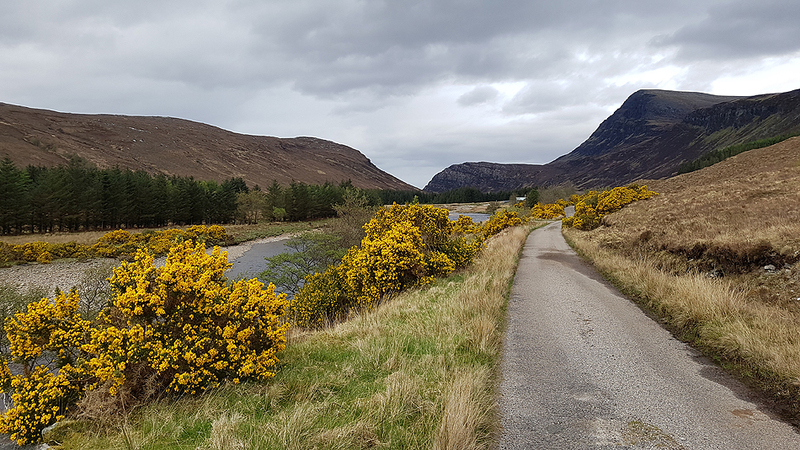 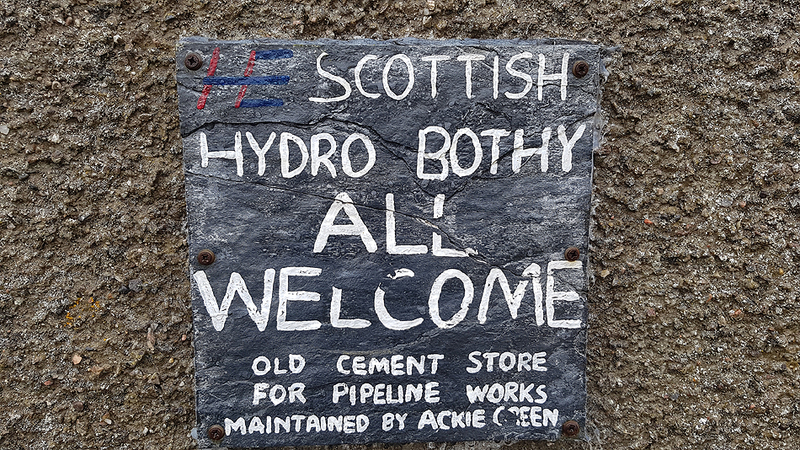 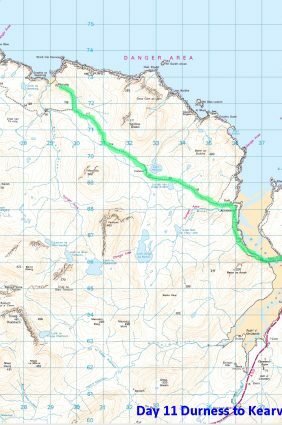 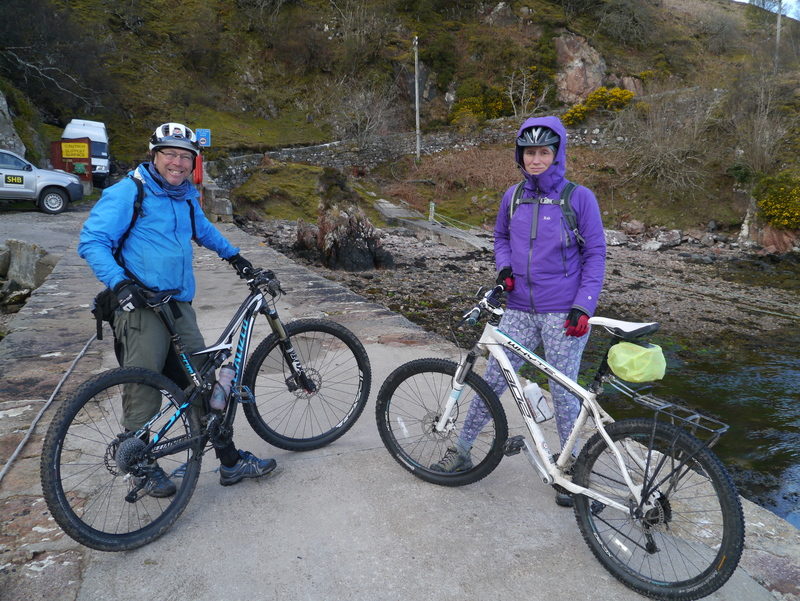 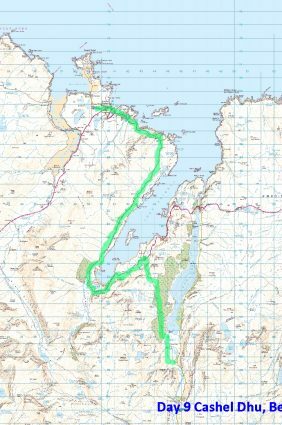 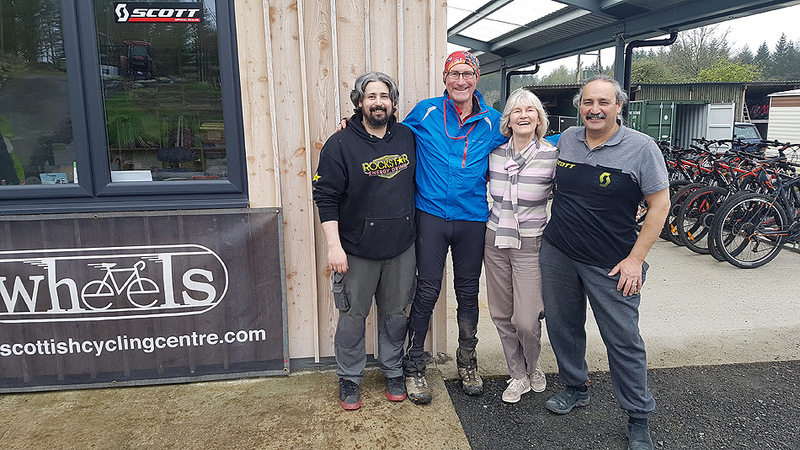 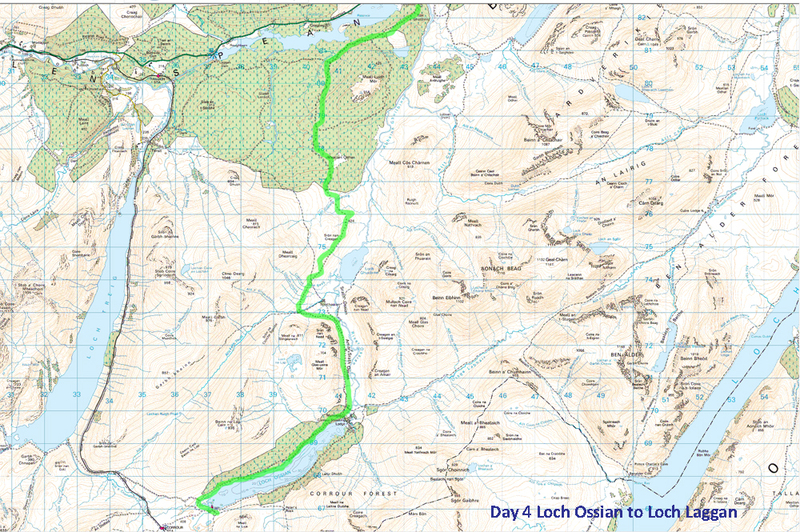 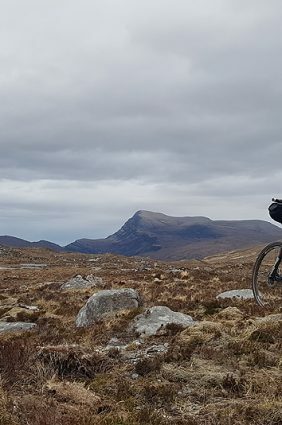 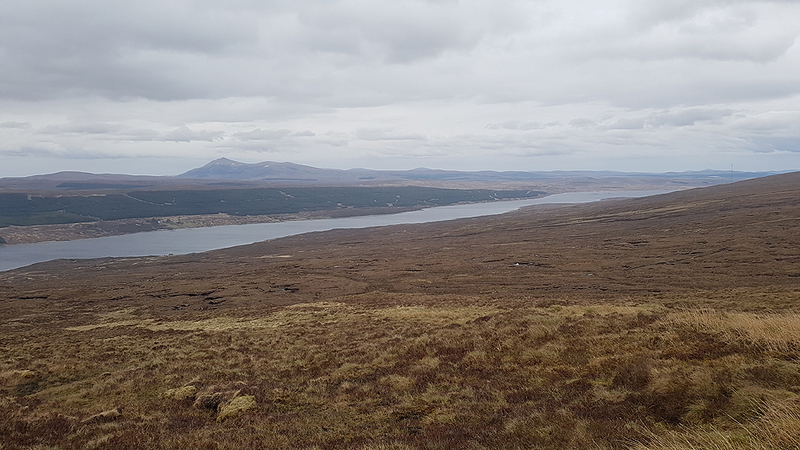 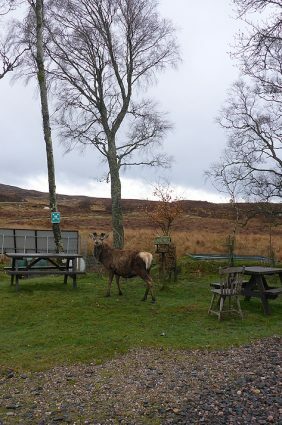 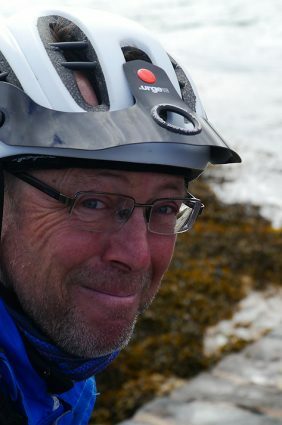 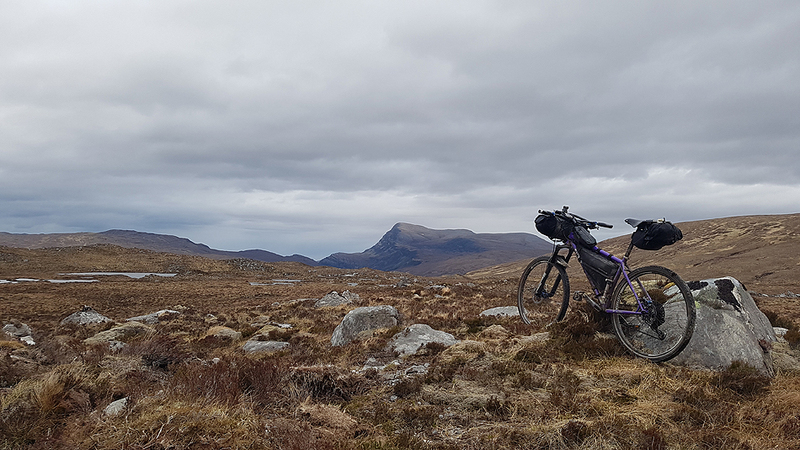 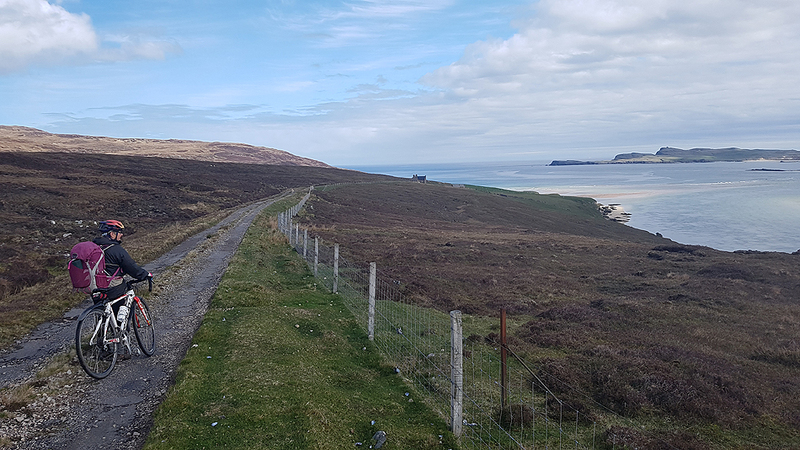 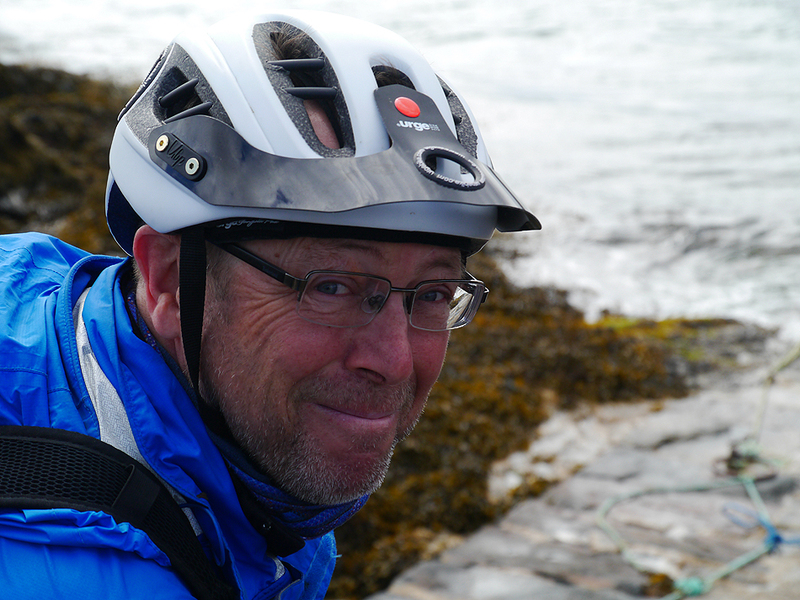 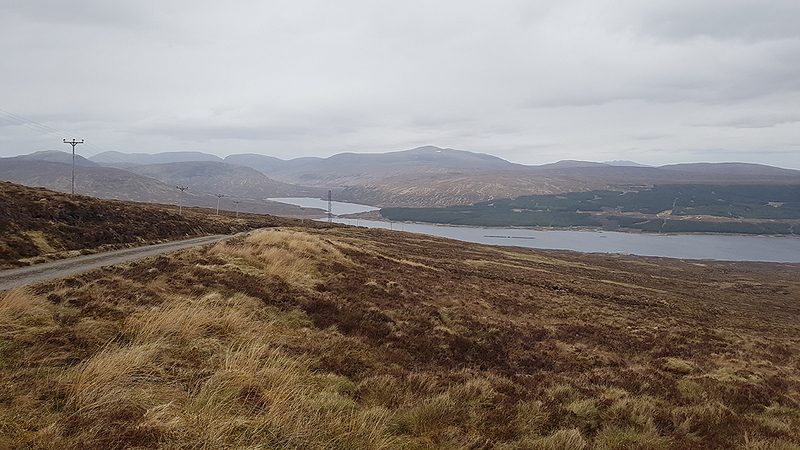 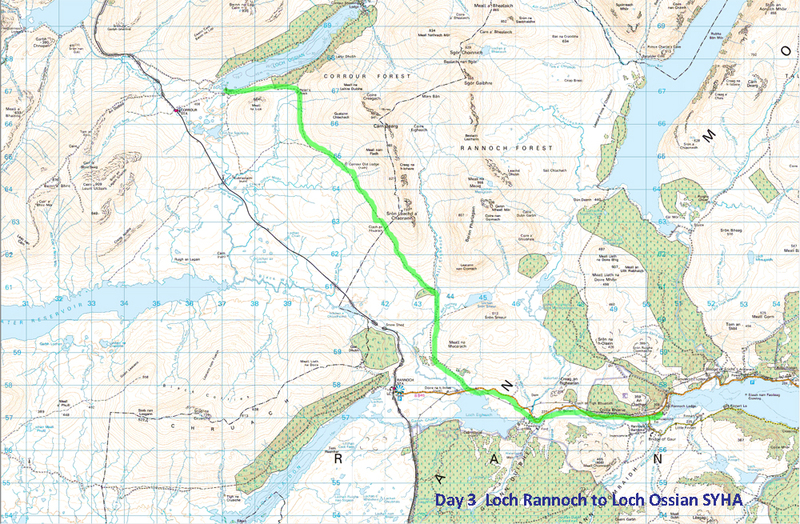 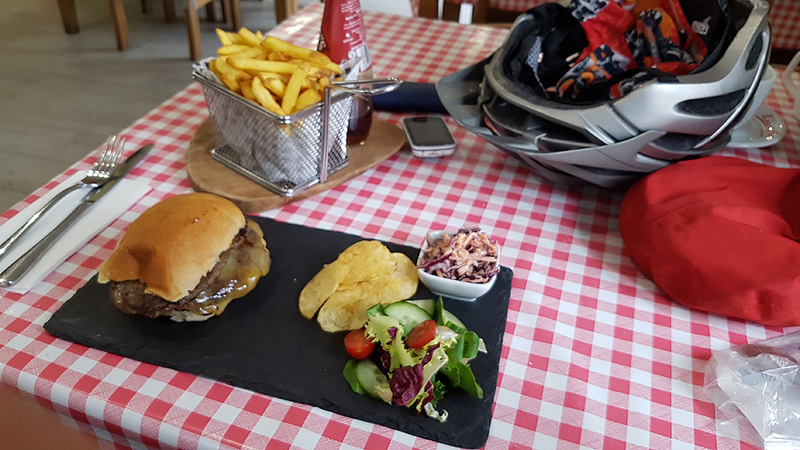 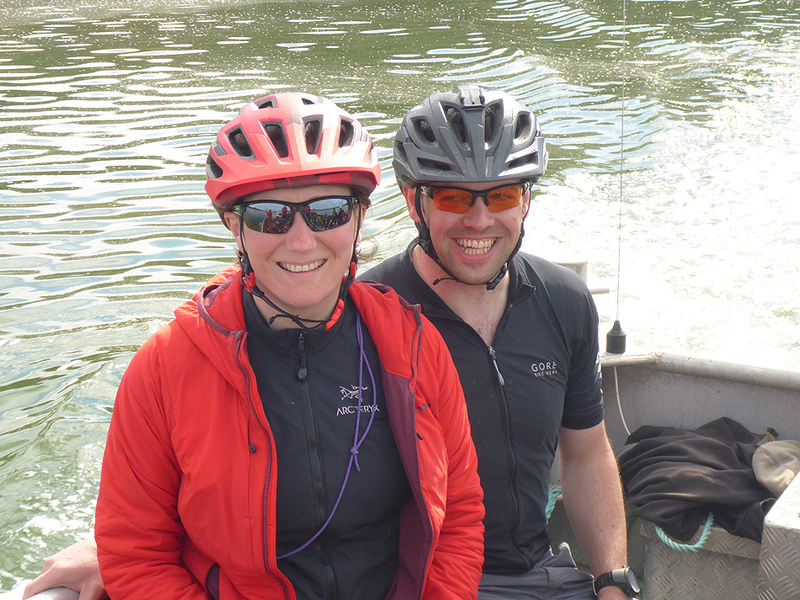 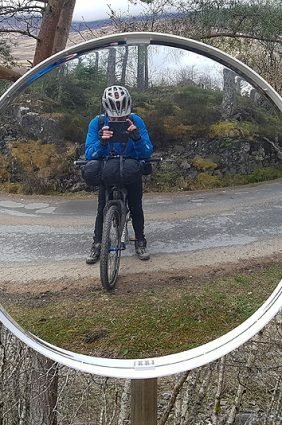 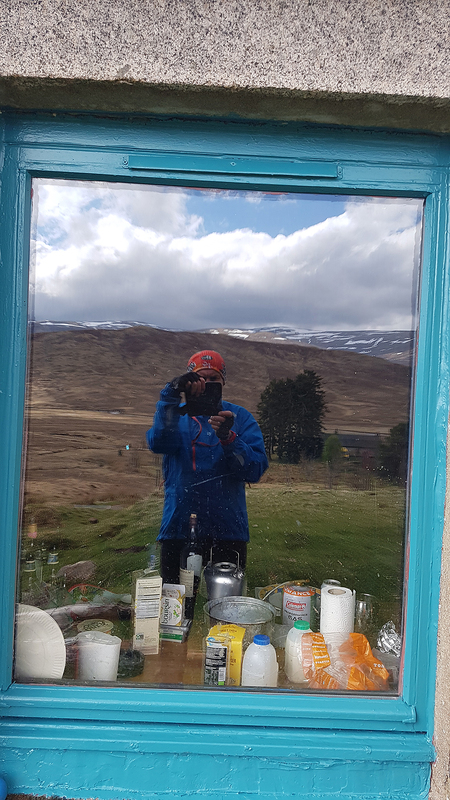 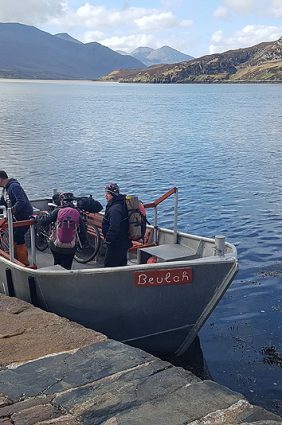 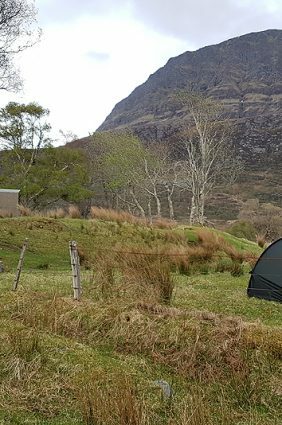 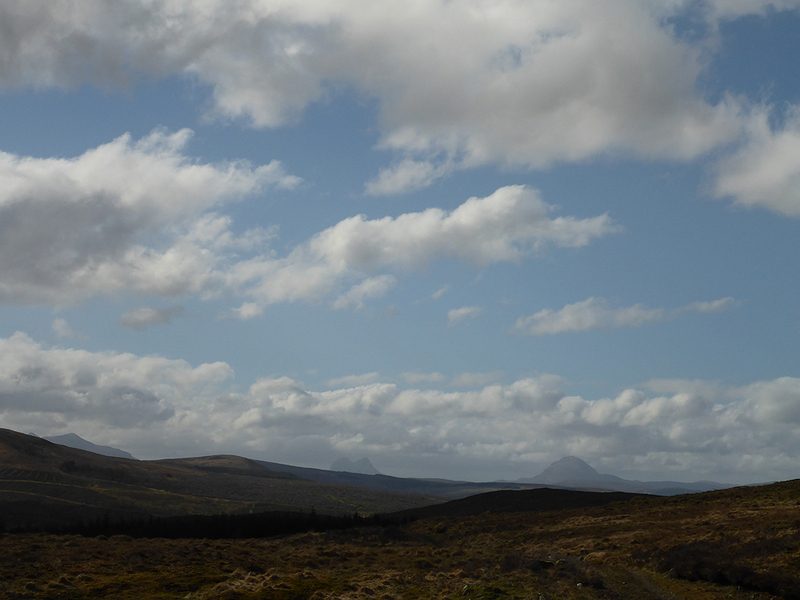 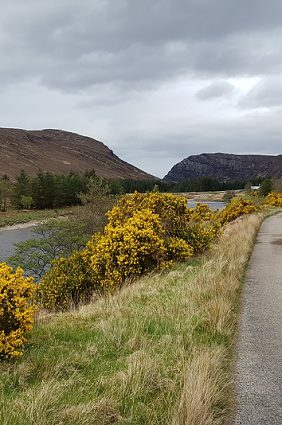 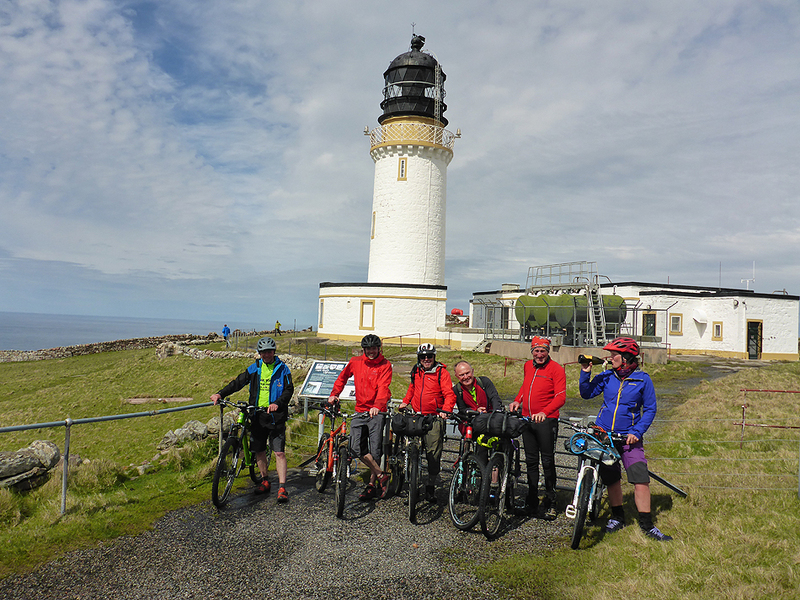 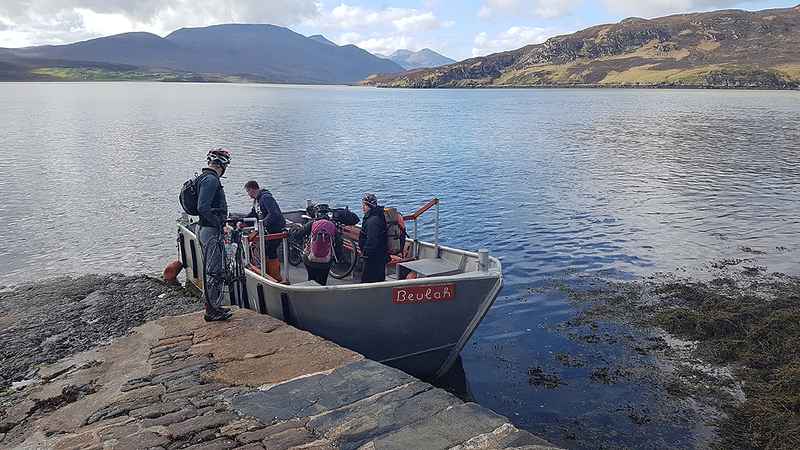 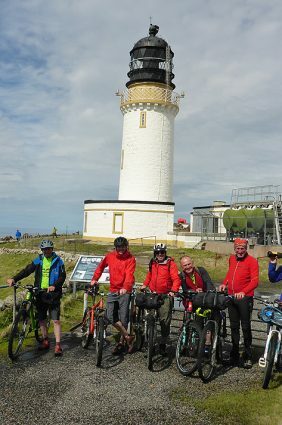 Day three of the Clyde to Cape Wrath trail, off-road bike route After two shorter introductory days, today added fifty miles and three climbs. 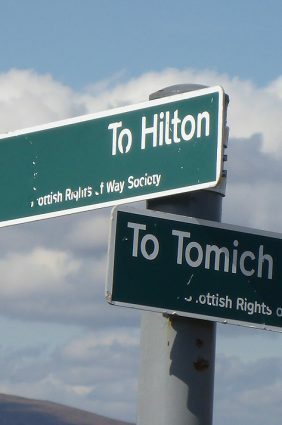 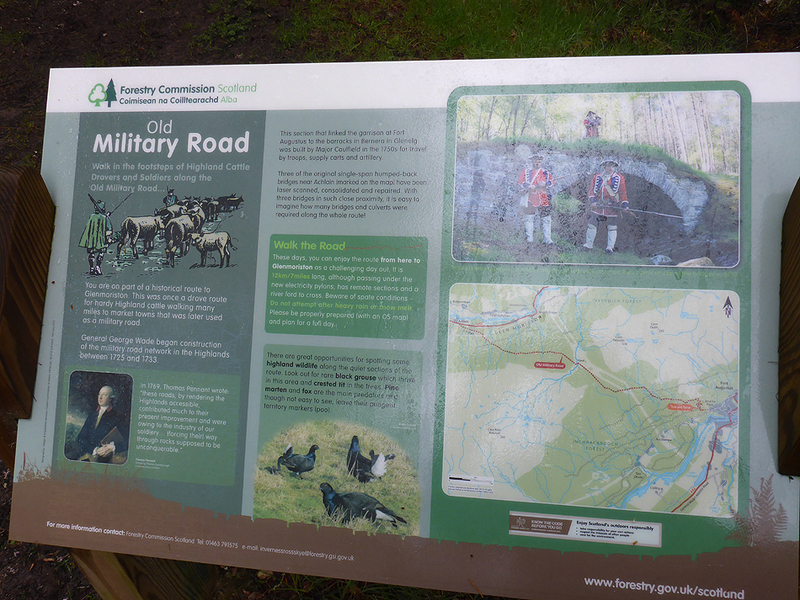 The second of these being the Kirk Road a short distance east of the main refereshment stop at Bridge of Balgie. 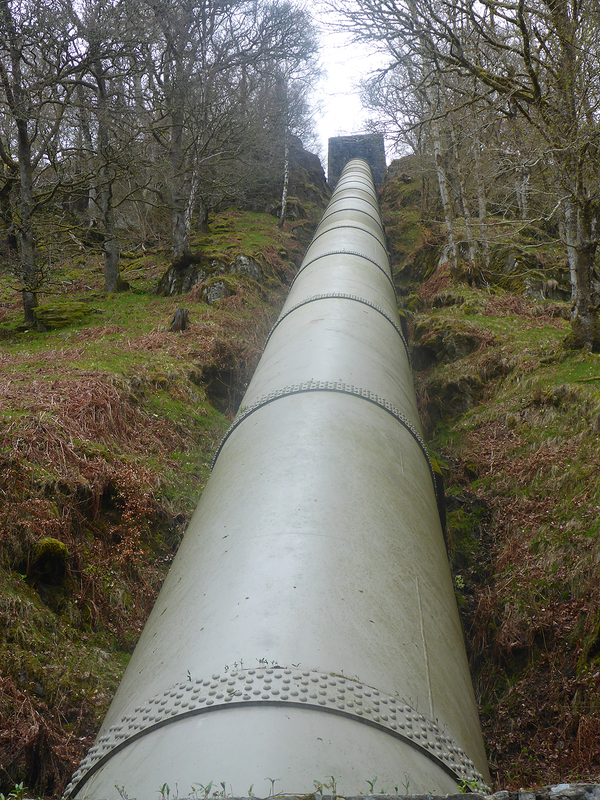 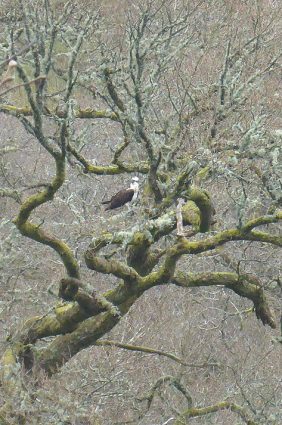 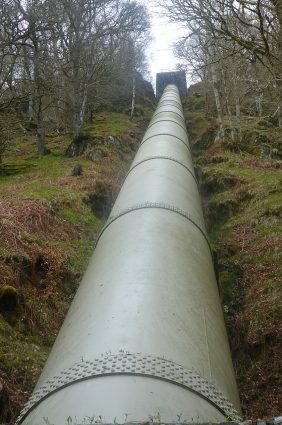 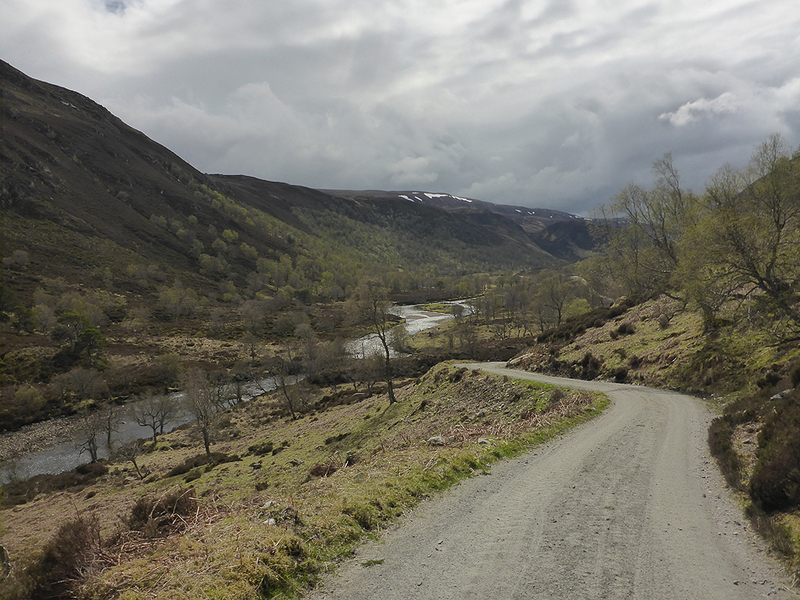 The journey to that lunch pause involved ascending the peaceful Glen Lochay from Killin, passing hydro schemes that would be appearing more frequently as I headed north. 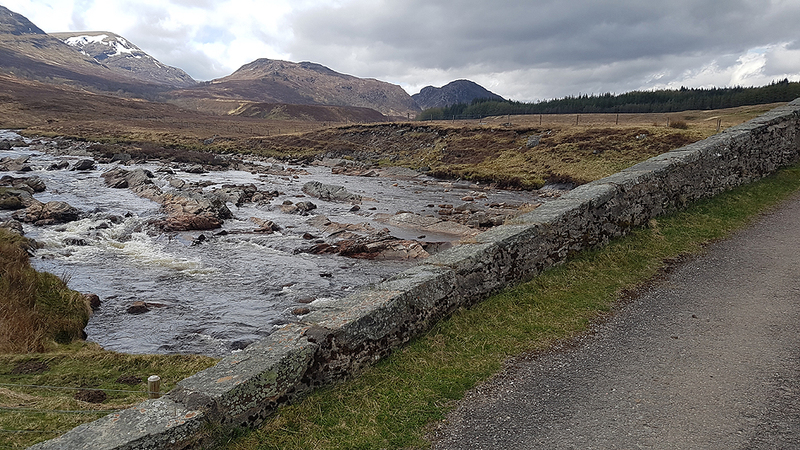 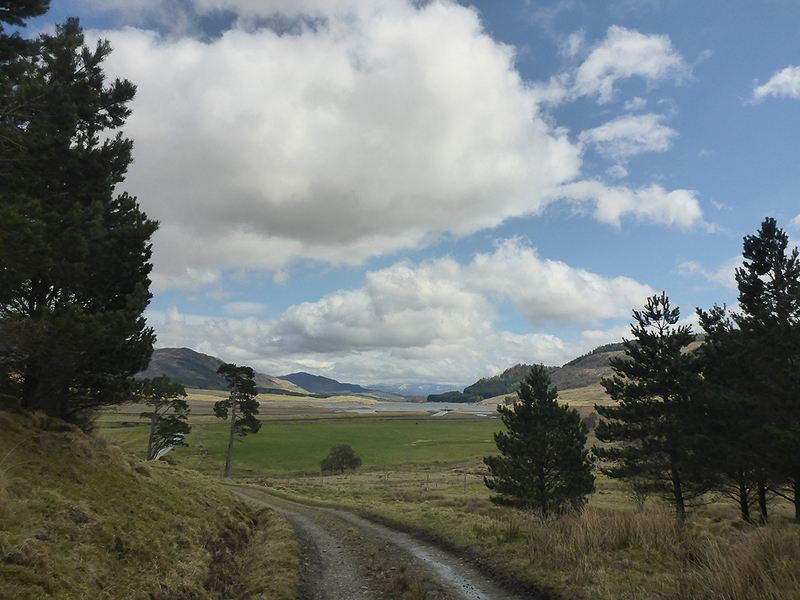 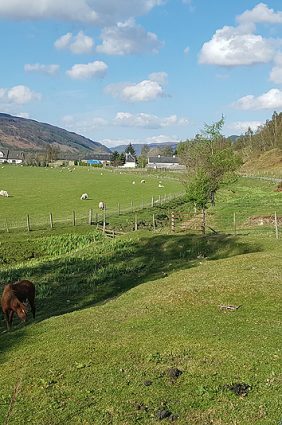 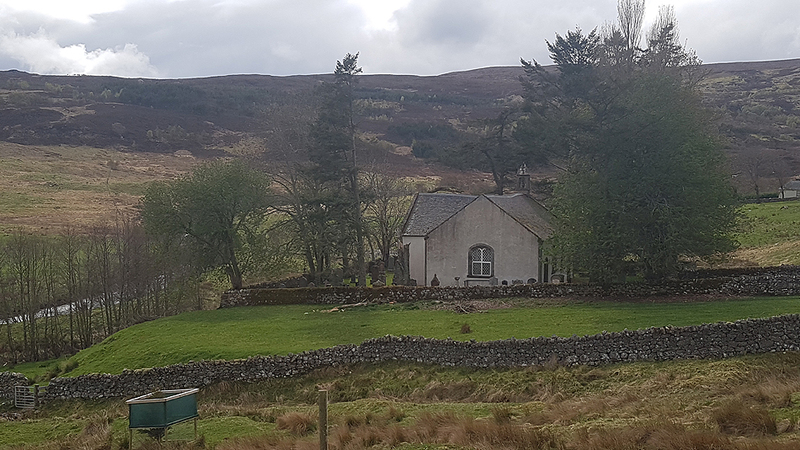 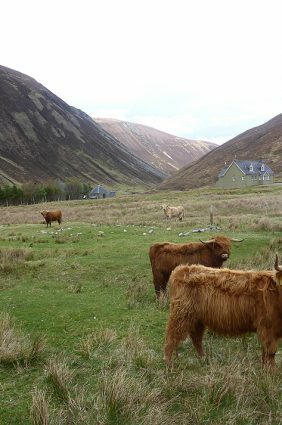 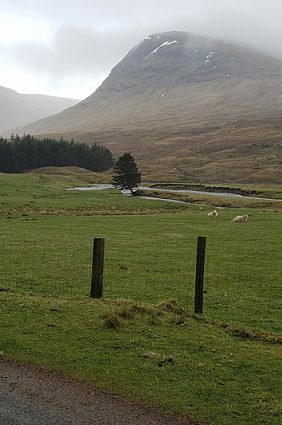 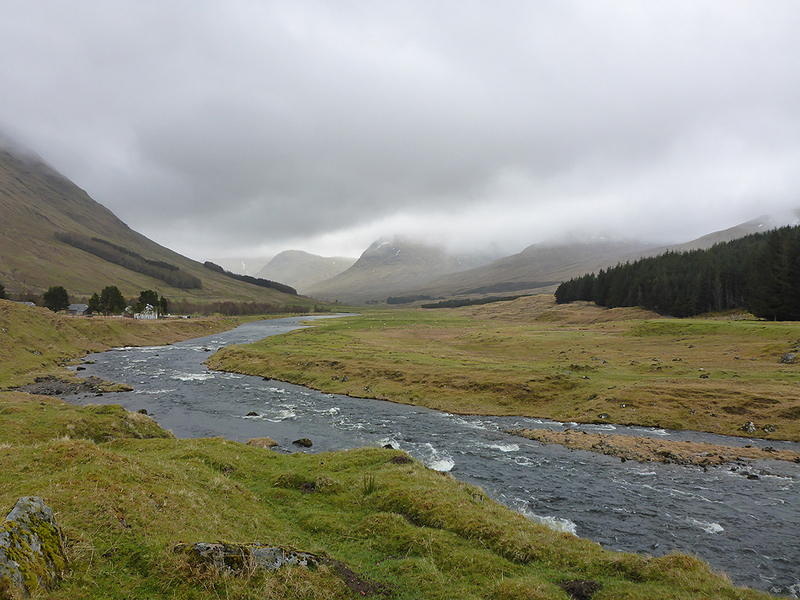 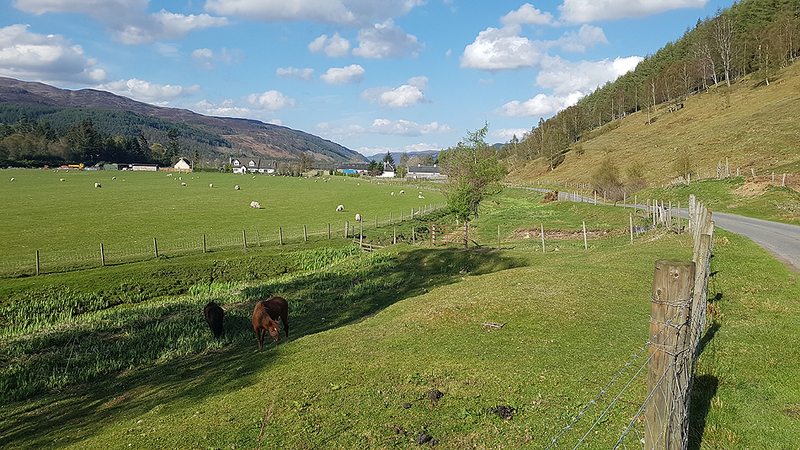 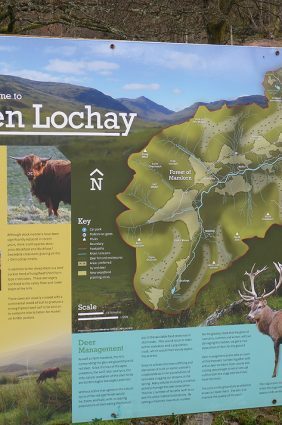 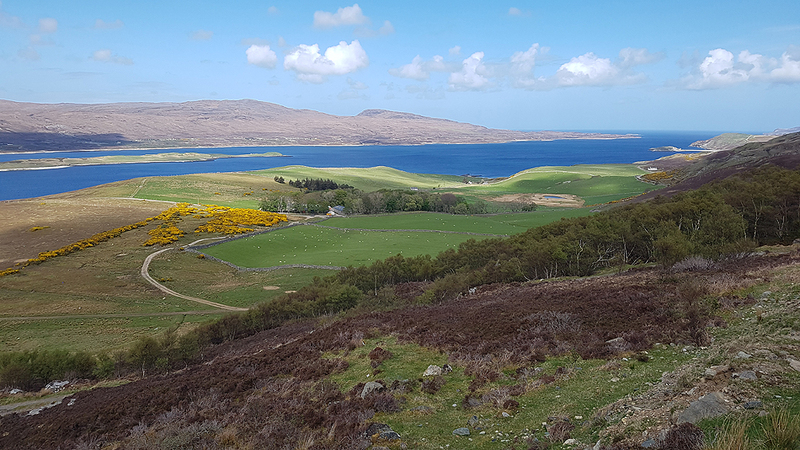 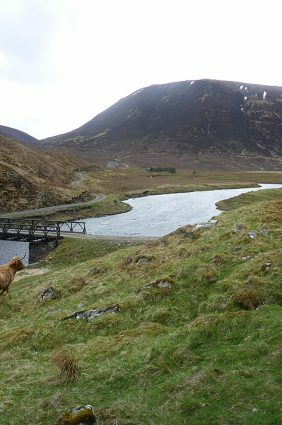 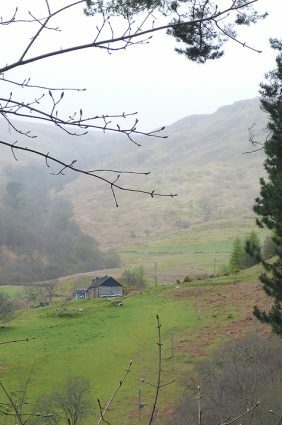 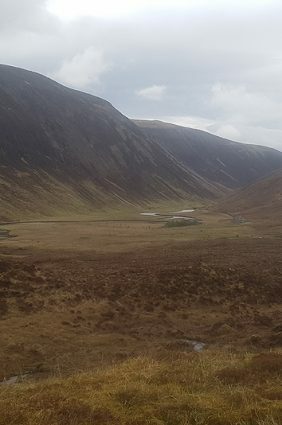 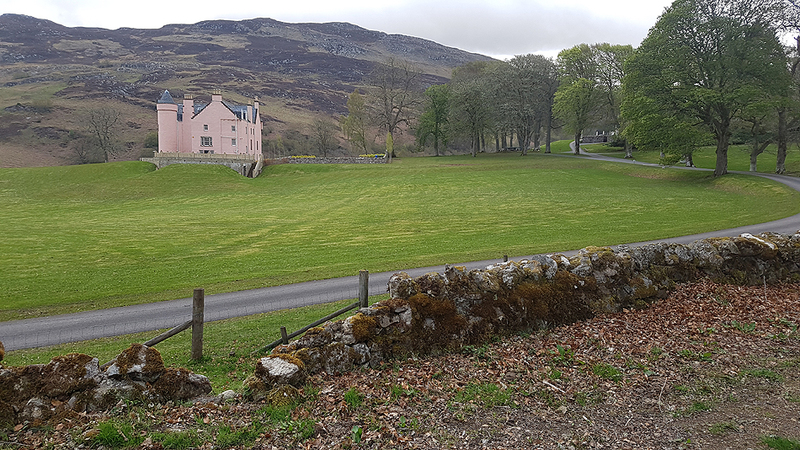 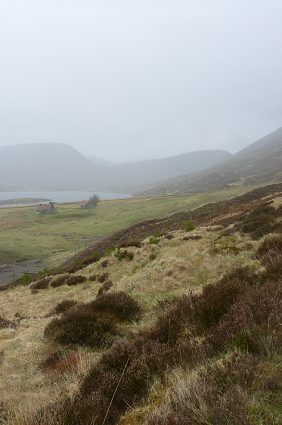 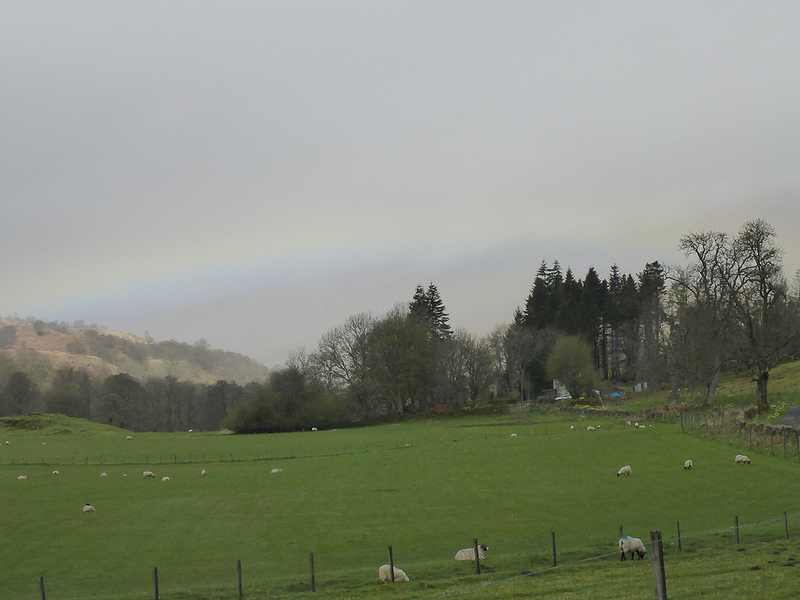 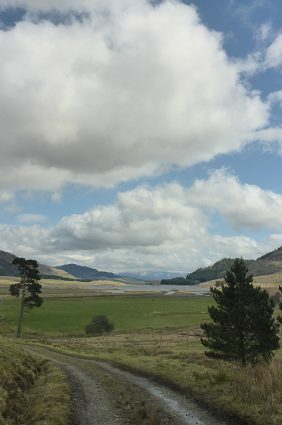 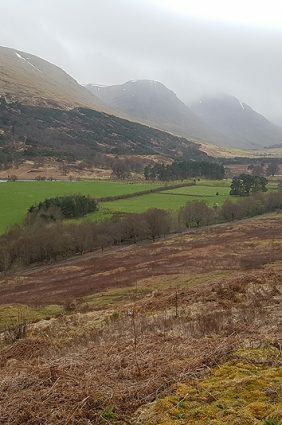 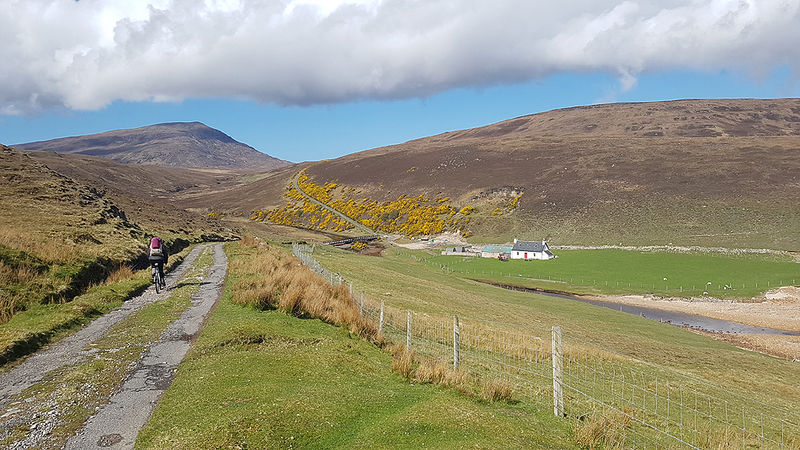 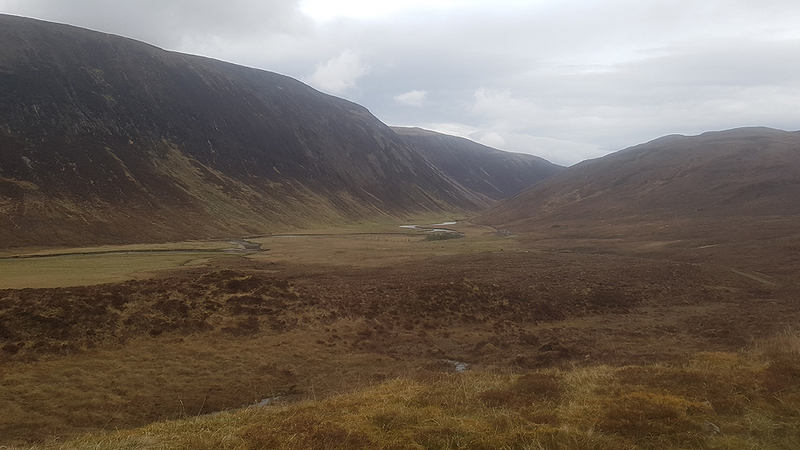 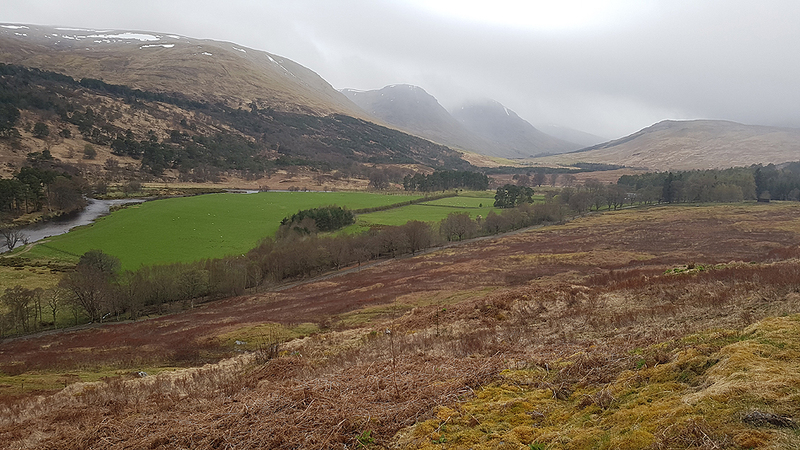 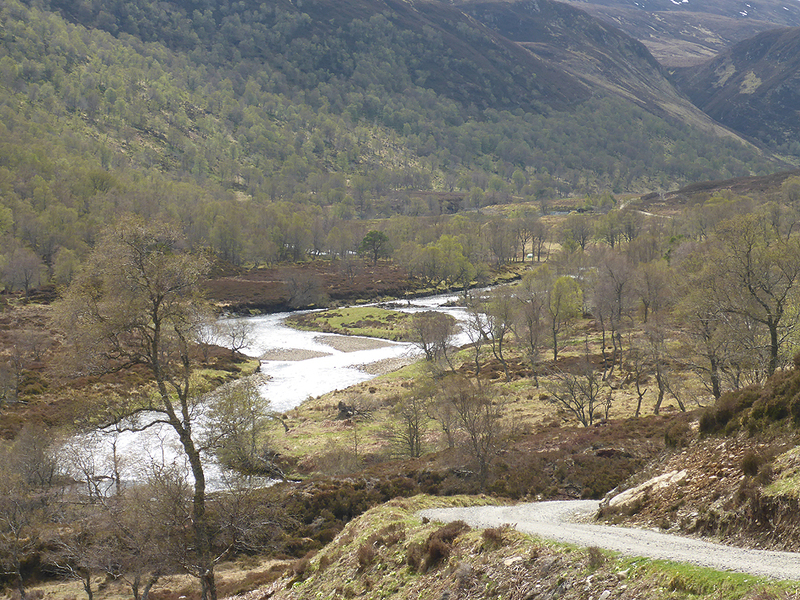 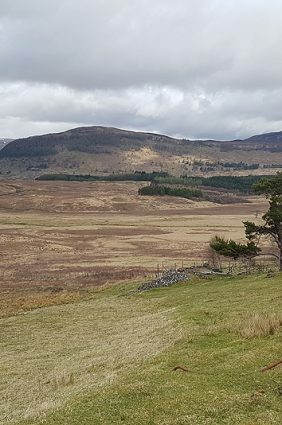 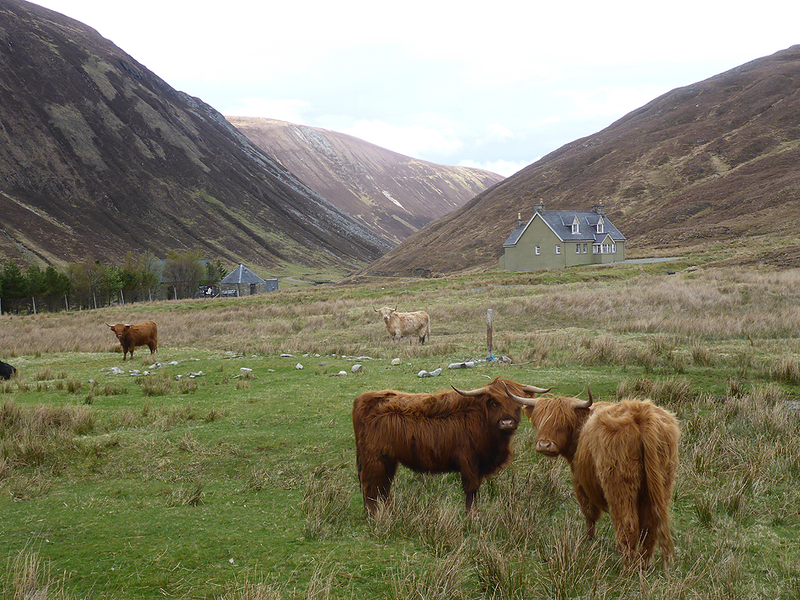 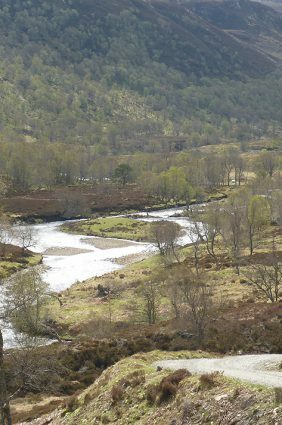 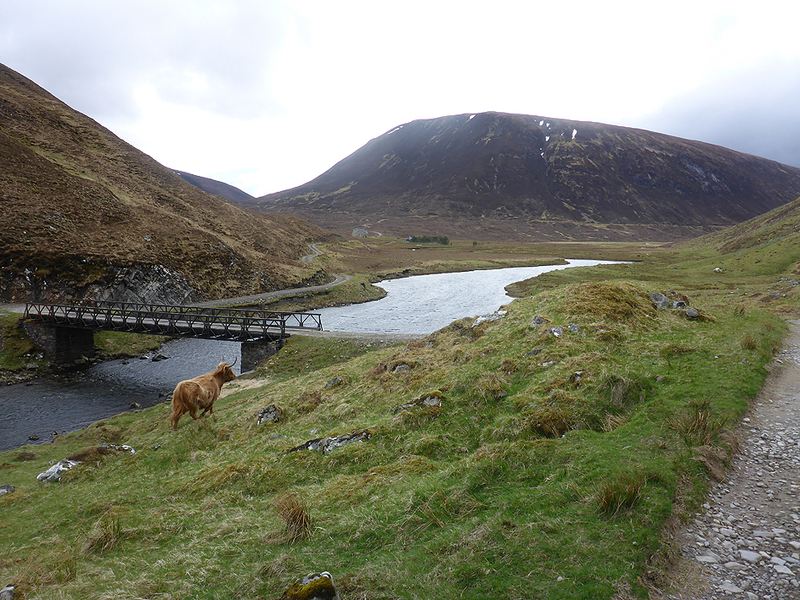 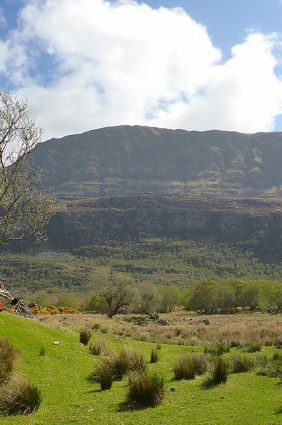 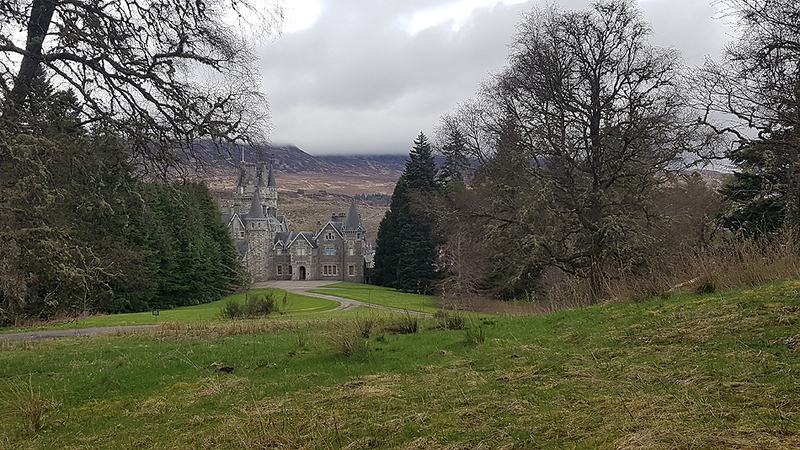 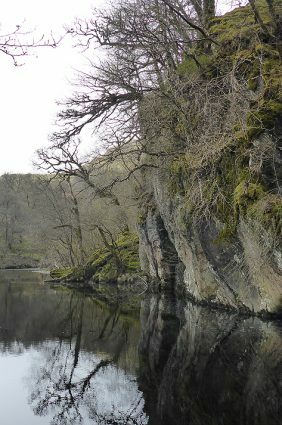 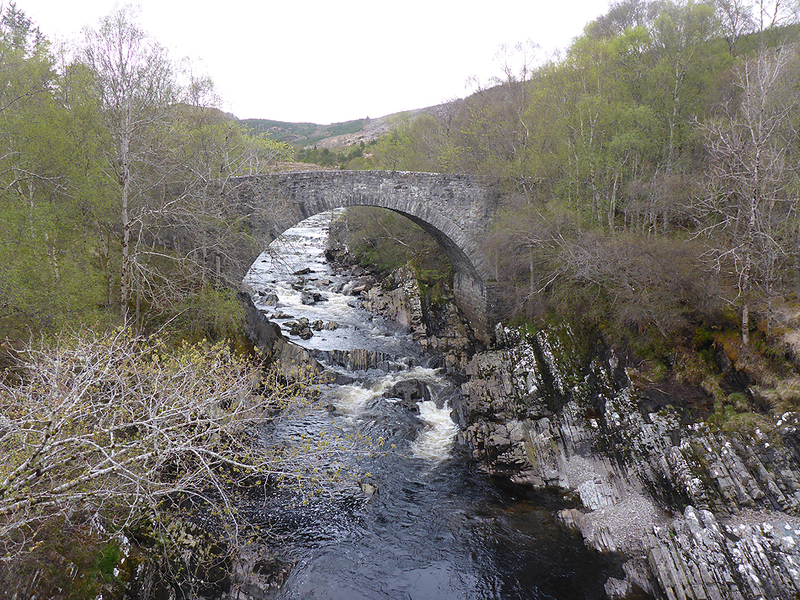 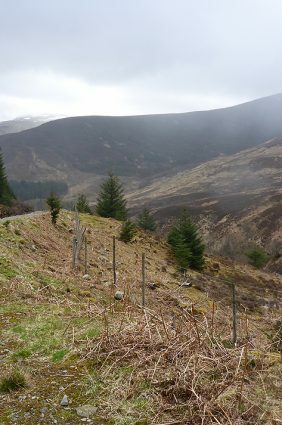 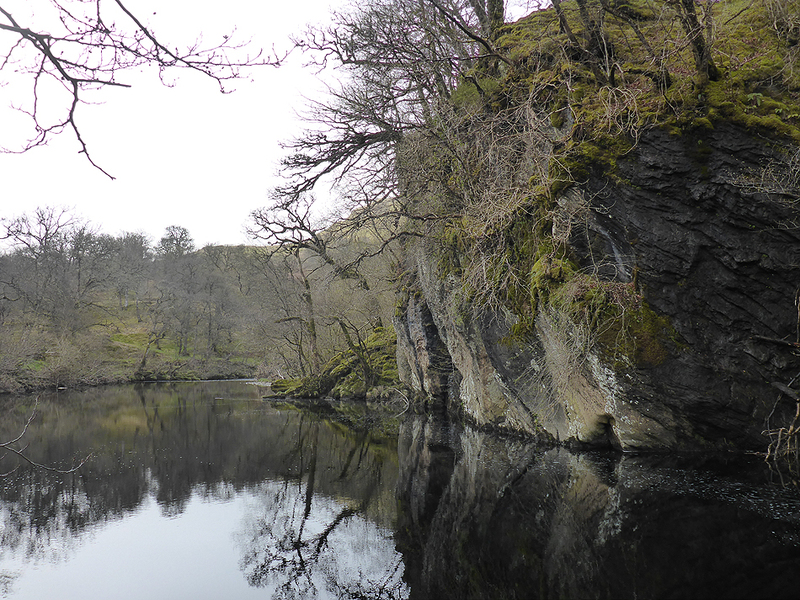 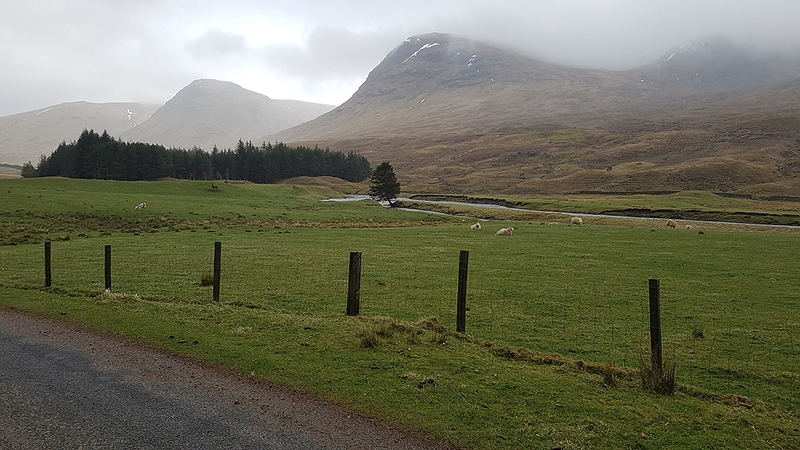 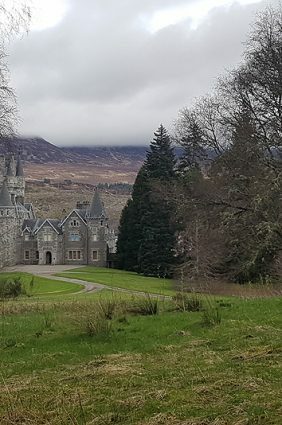 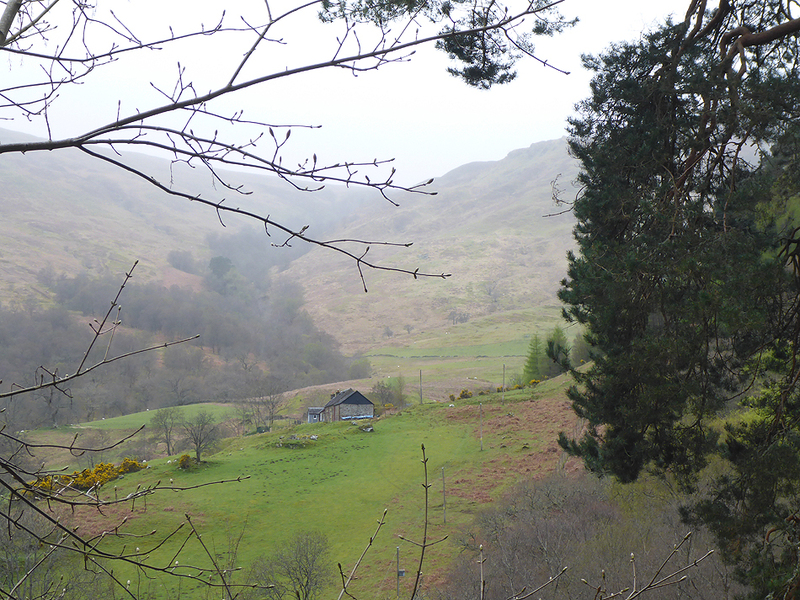 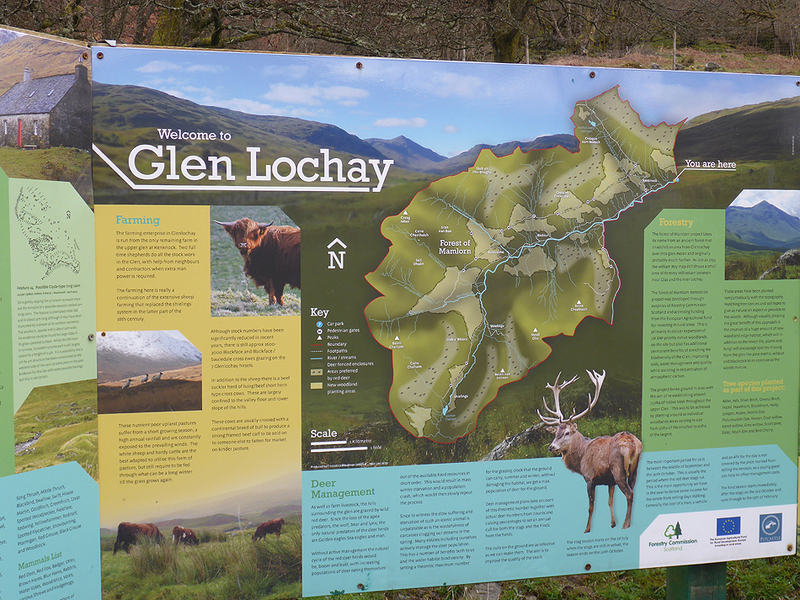 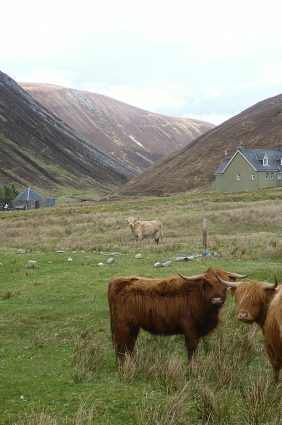 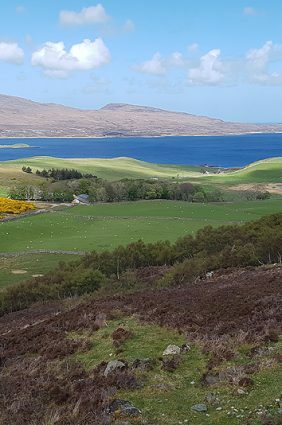 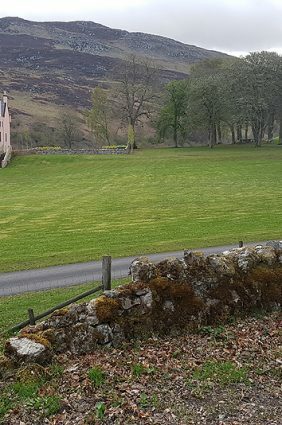 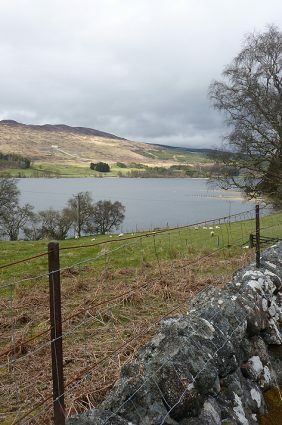 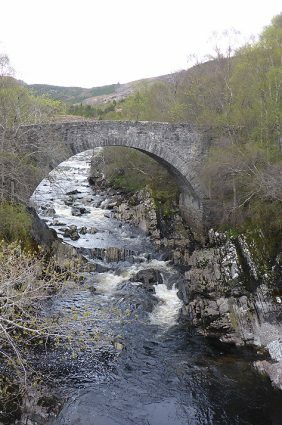 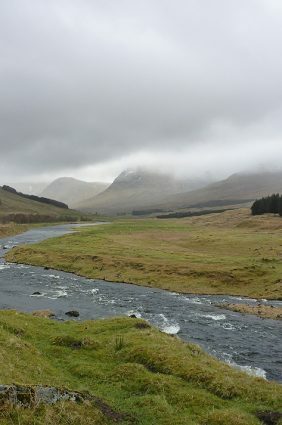 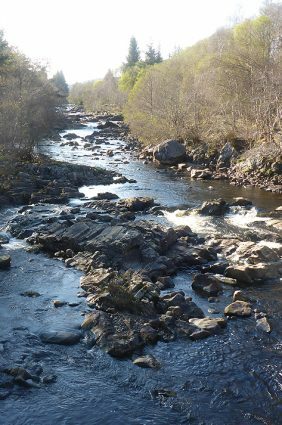 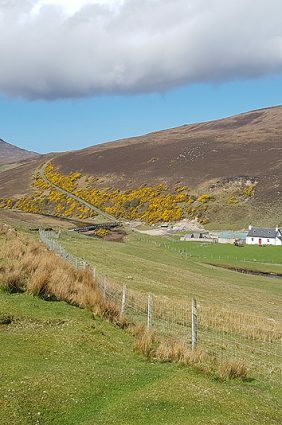 This beautiful glen leads to a paved road that heads steeply north-west from Kenknock, before plunging down into Glen Lyon and swiftly on, passing high cloudy summits on either side of the road, amongst sheep pasture and forested slopes to the Bridge of Balgie. 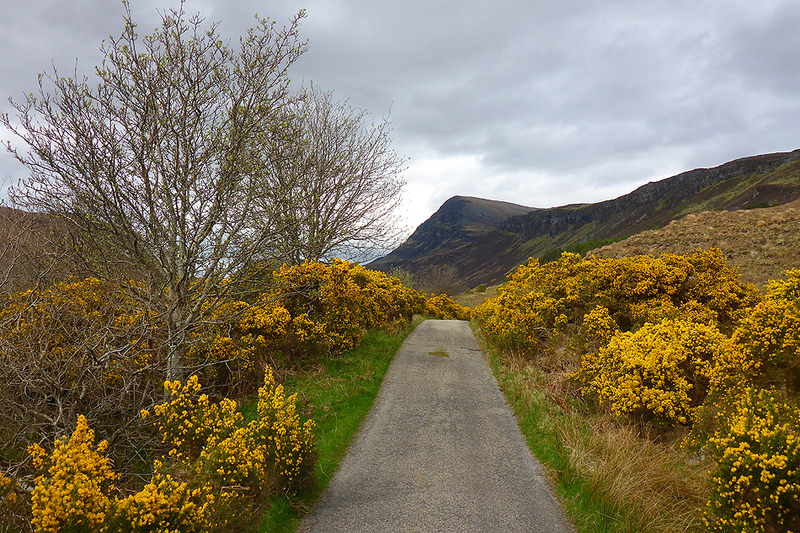 To this point, the cycling had been fairly mellow, mostly on quiet, paved minor roads. 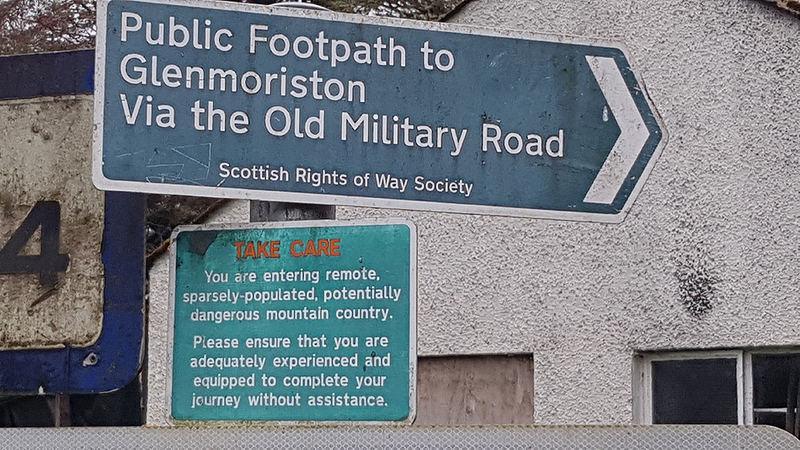 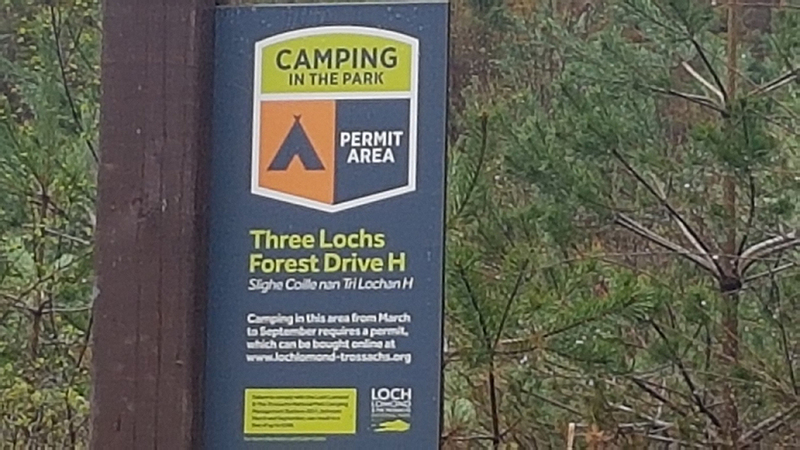 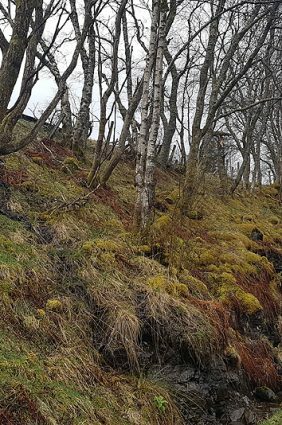 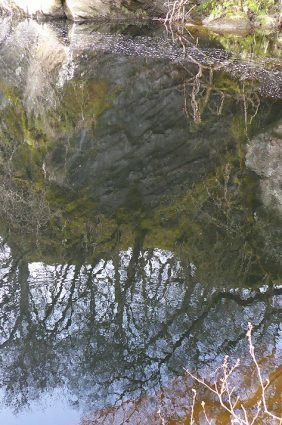 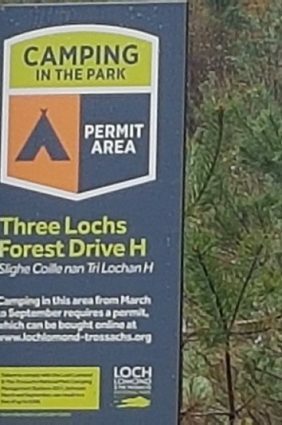 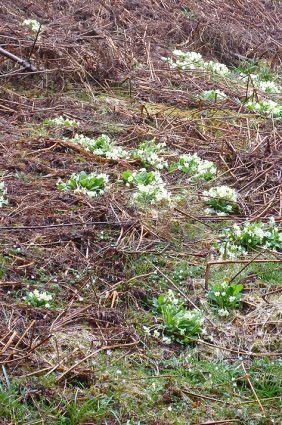 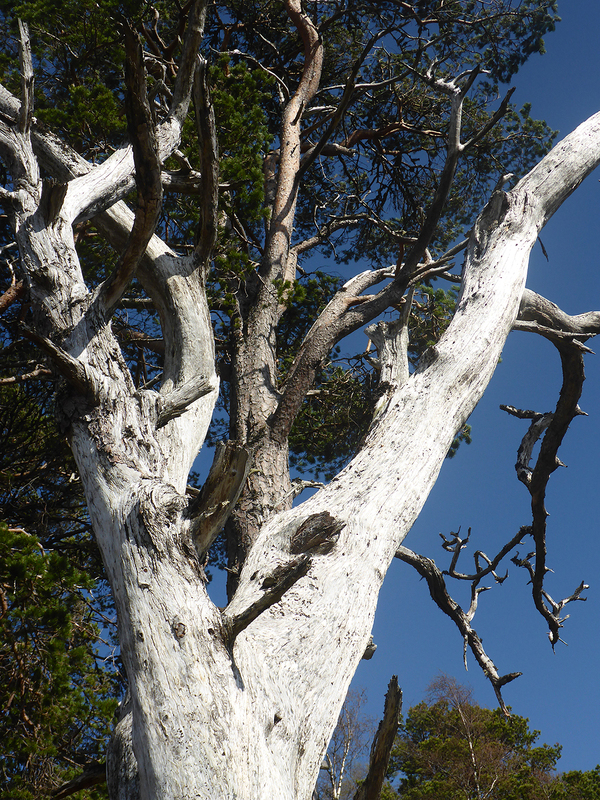 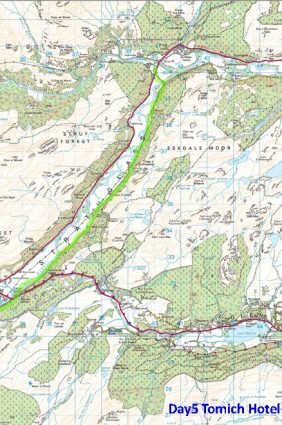 This all changes with the Kirk Road, which is a steep hike up on a gravel forest track, before heading down into the forest, south of Loch Rannoch, where I became misplaced for a while. 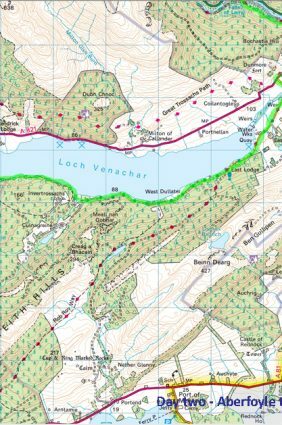 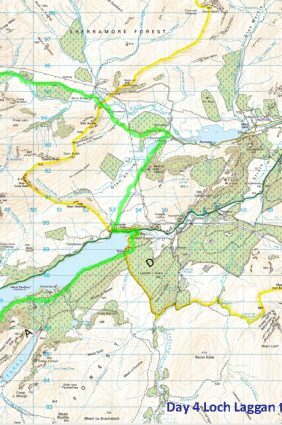 A ‘spaghetti junction’ of paths that did not agree with my digital mapping did eventually gain access to the minor road, alongside of Loch Rannoch. 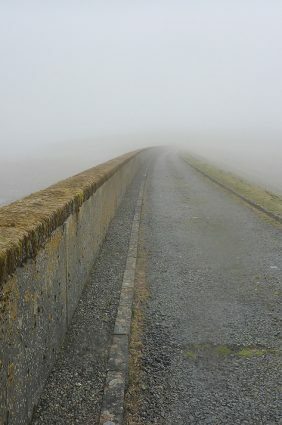 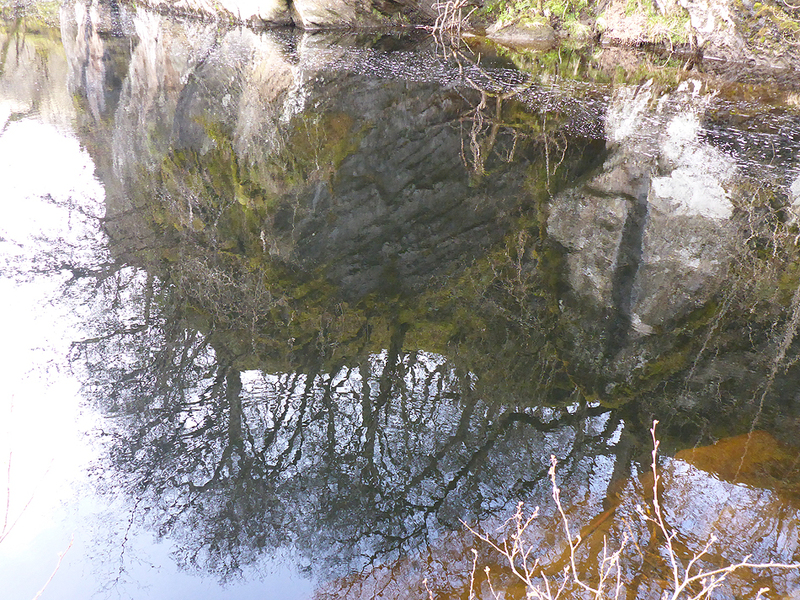 The way was clear from then on, as I had been here before. 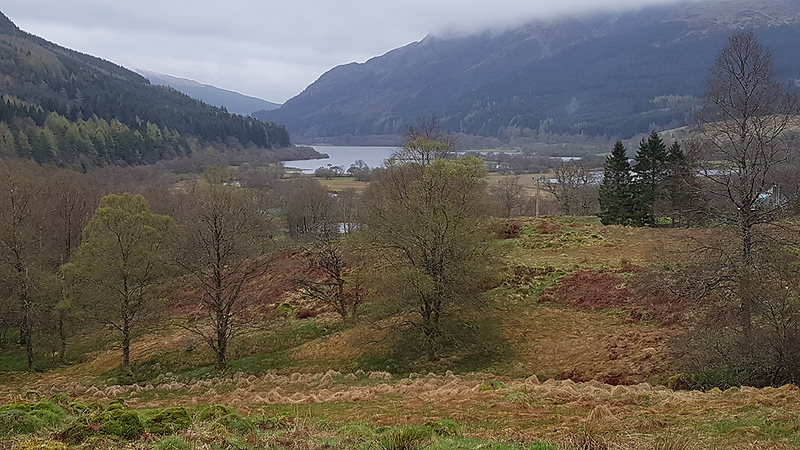 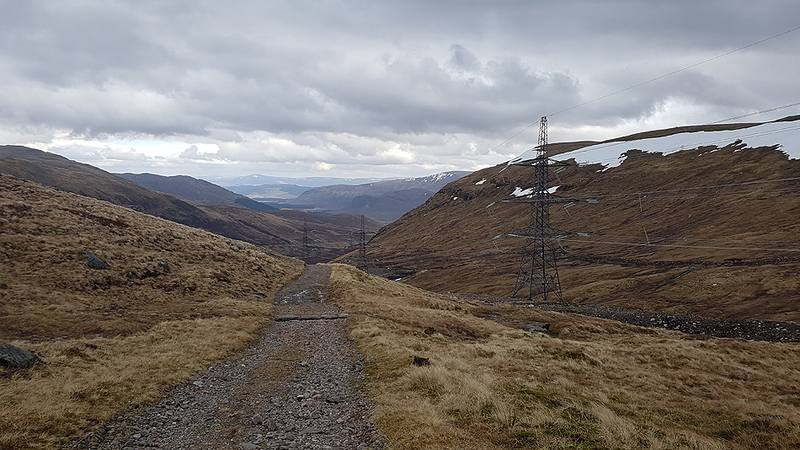 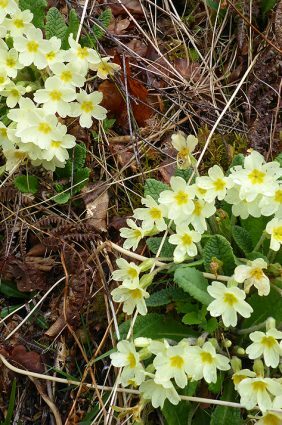 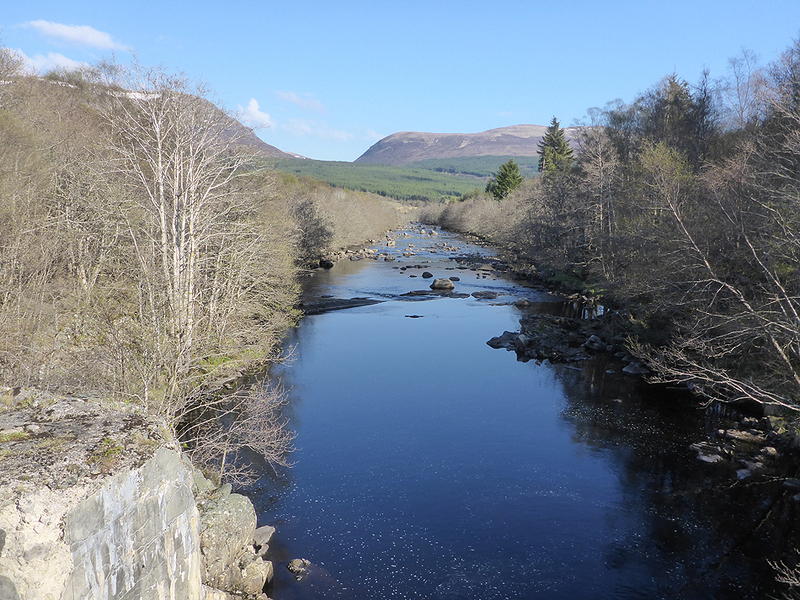 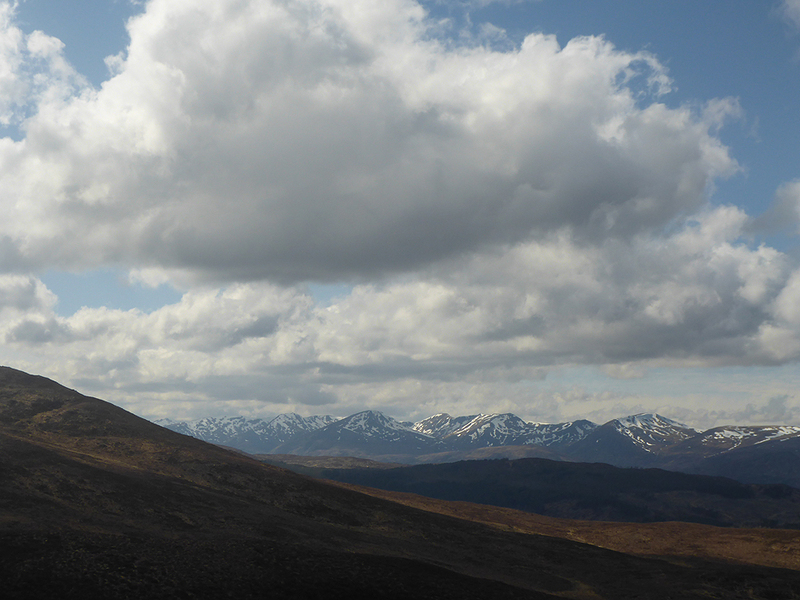 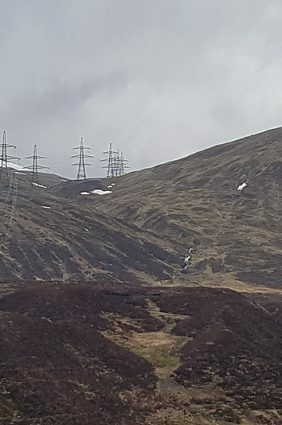 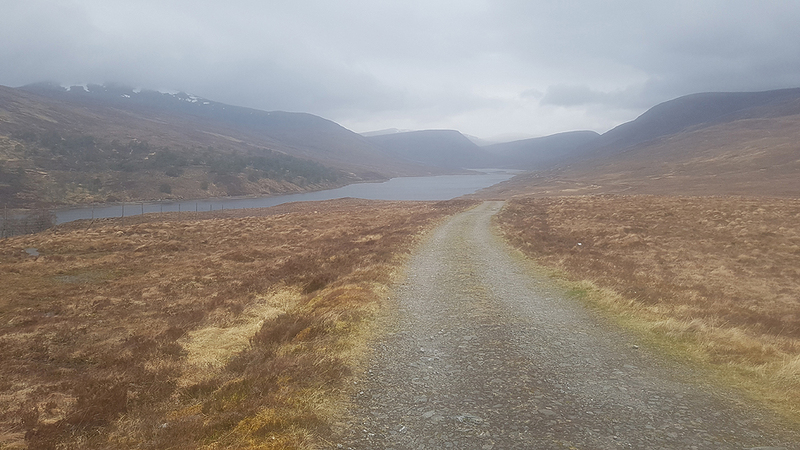 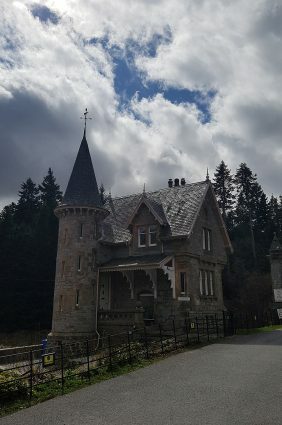 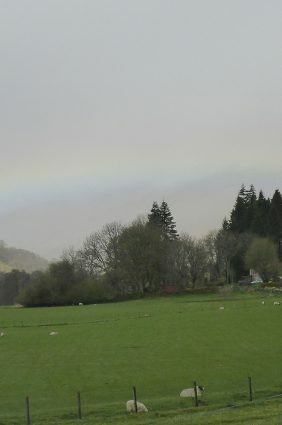 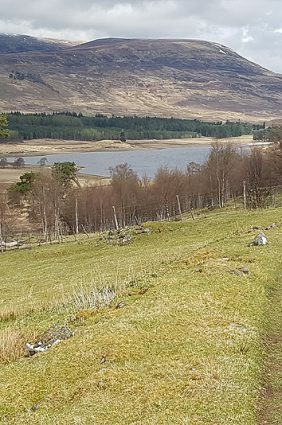 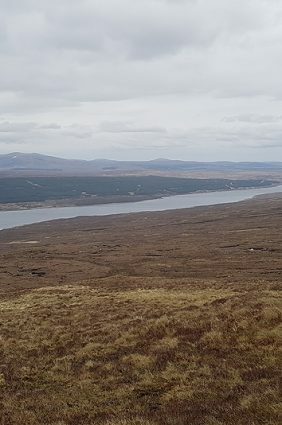 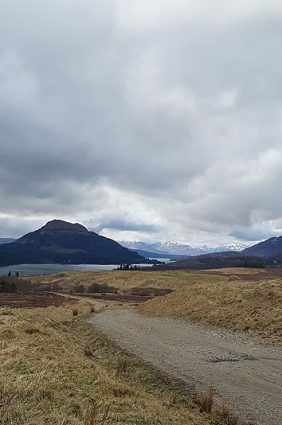 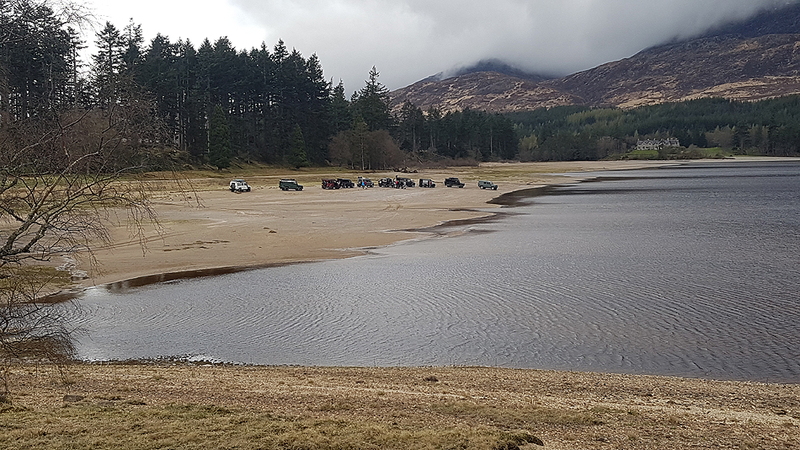 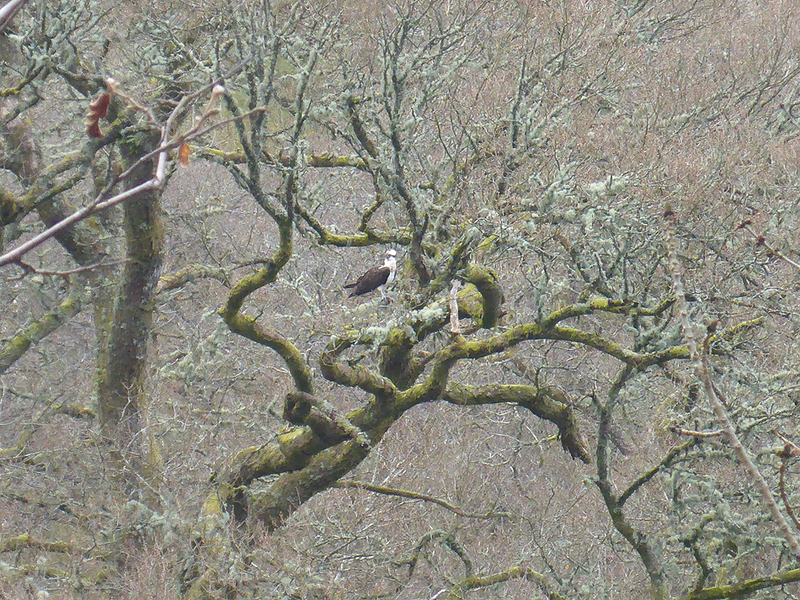 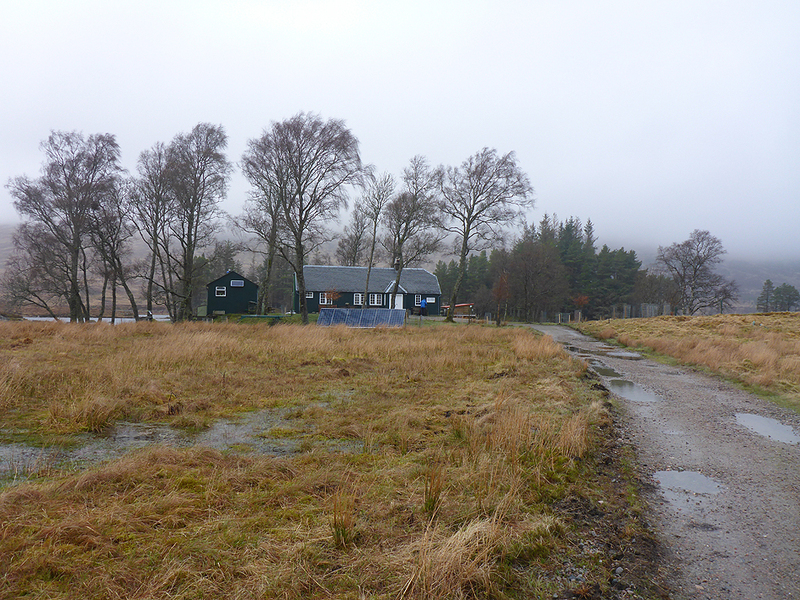 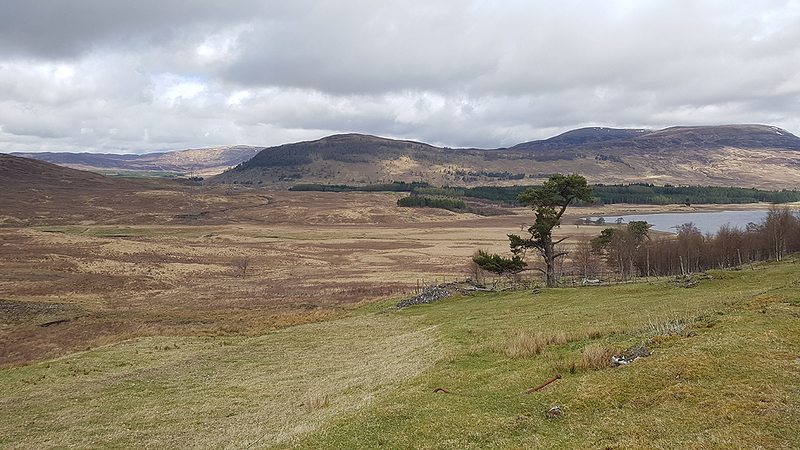 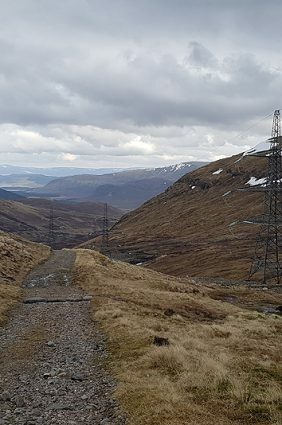 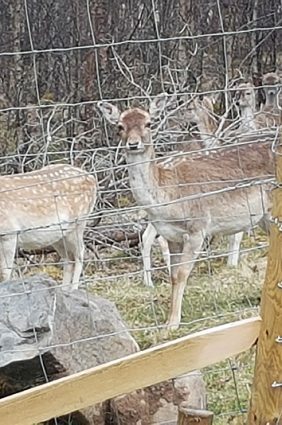 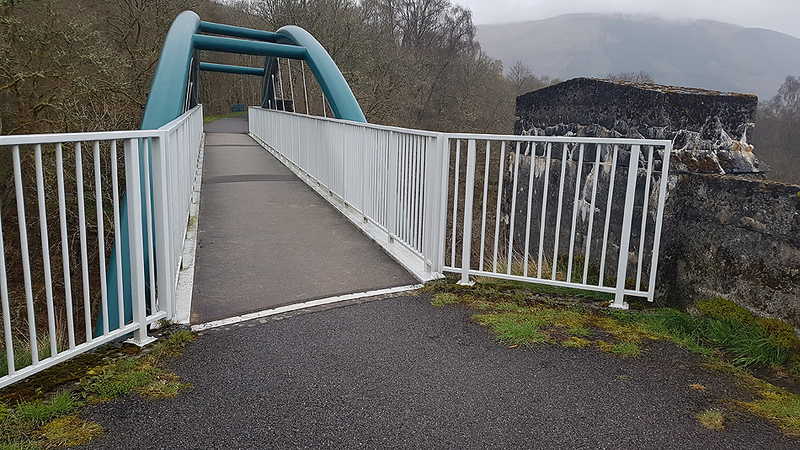 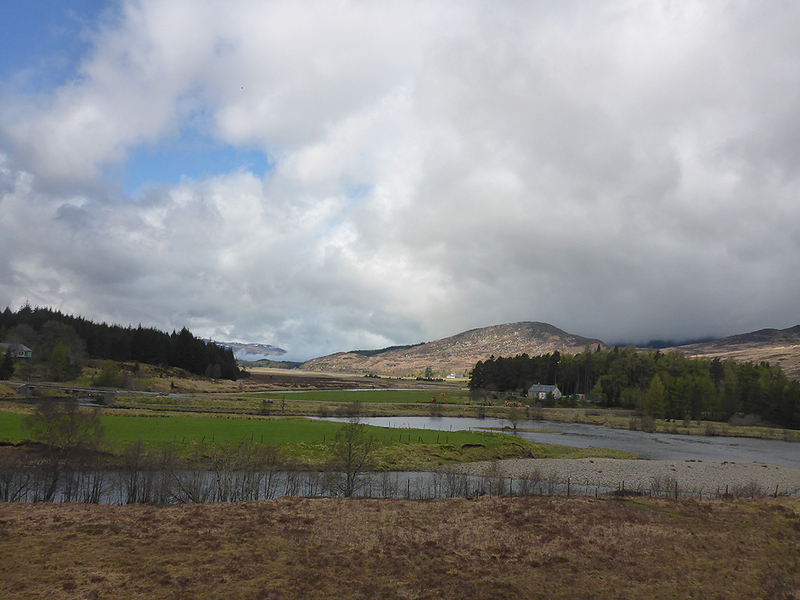 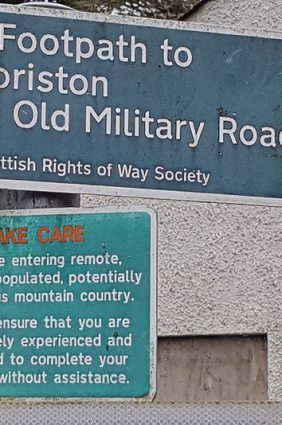 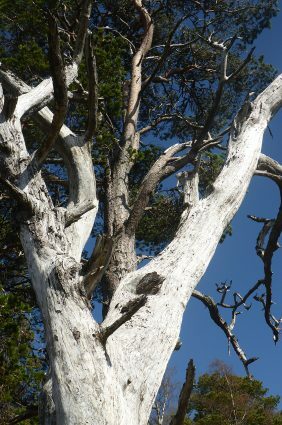 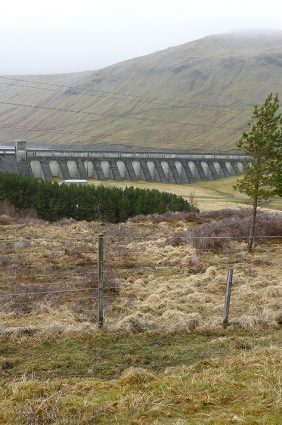 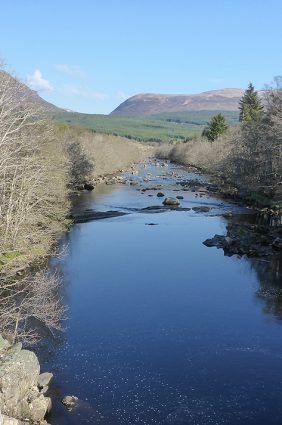 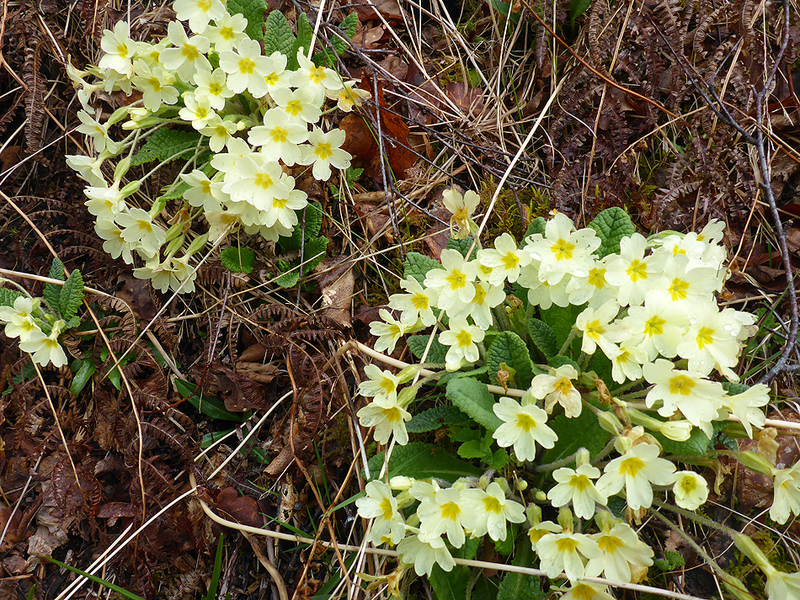 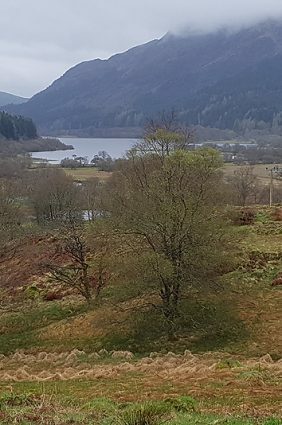 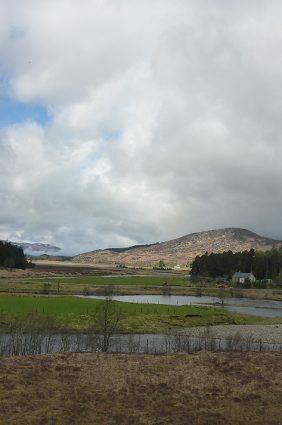 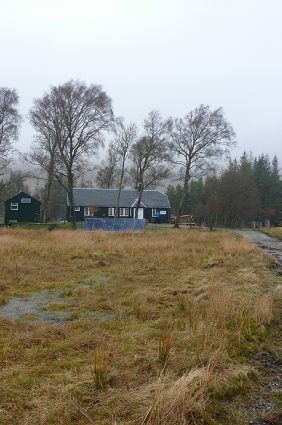 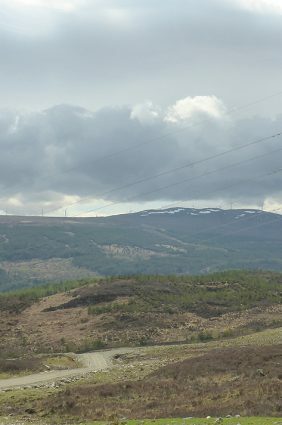 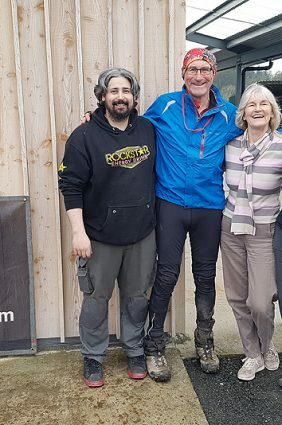 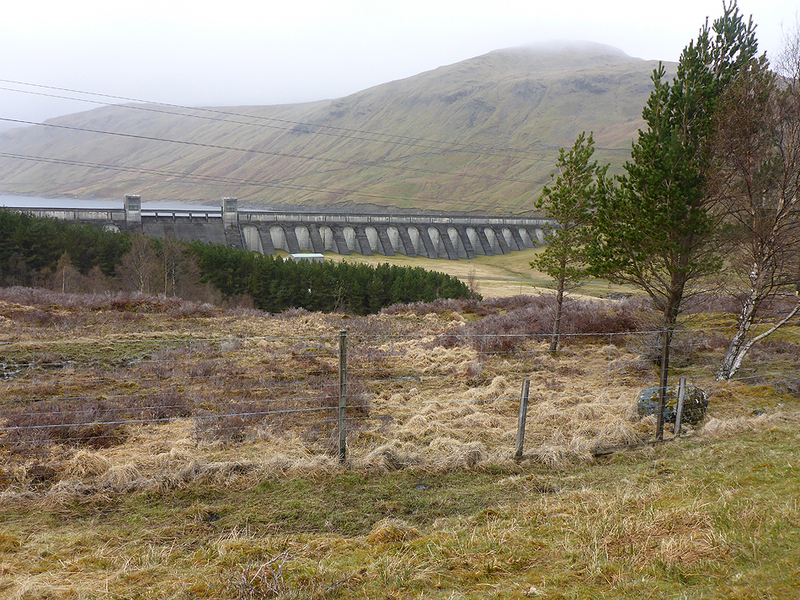 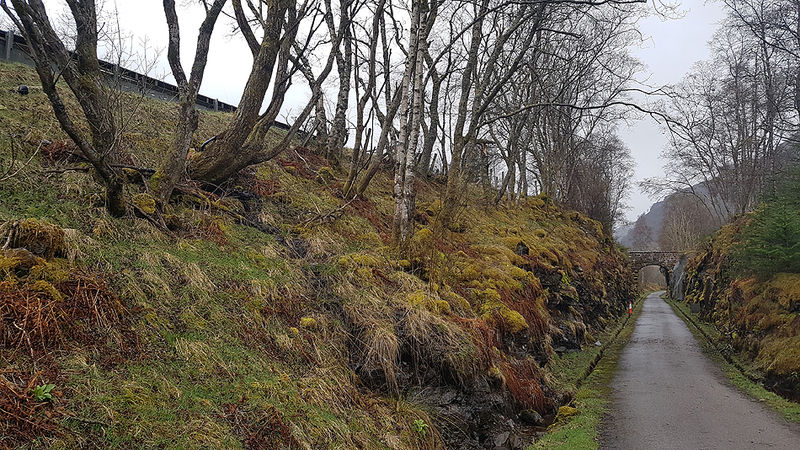 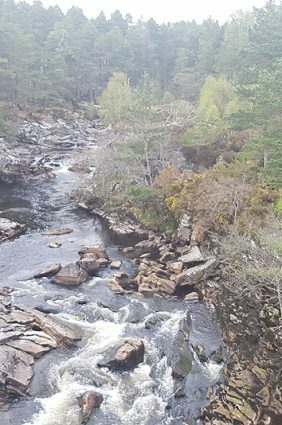 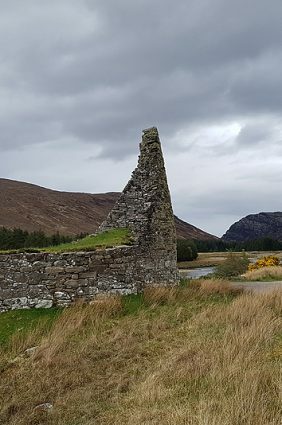 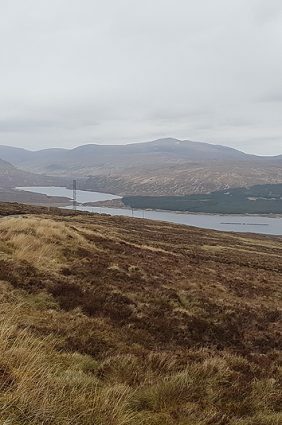 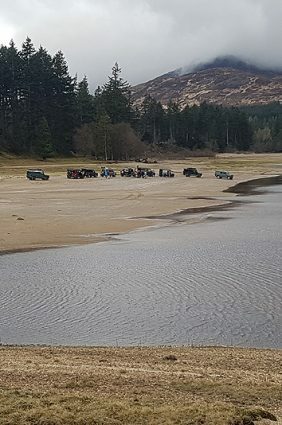 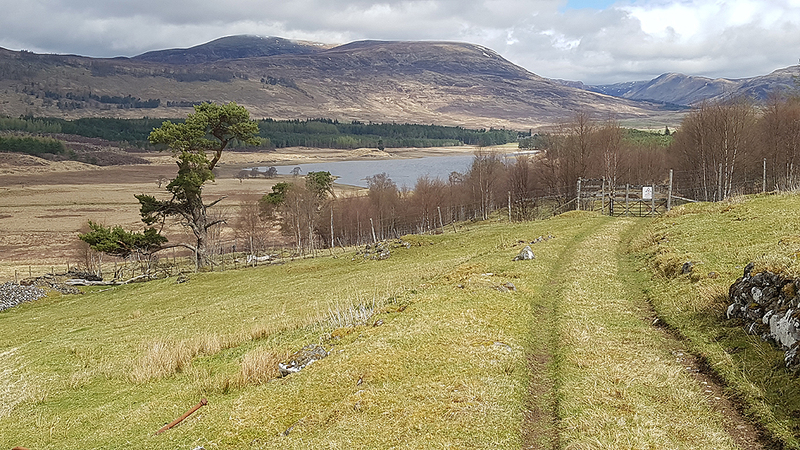 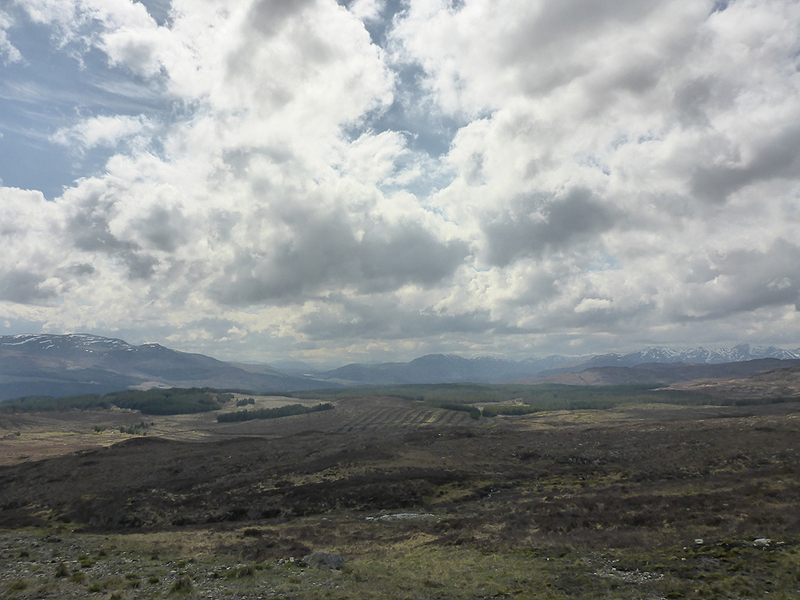 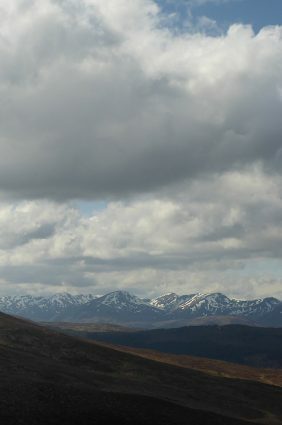 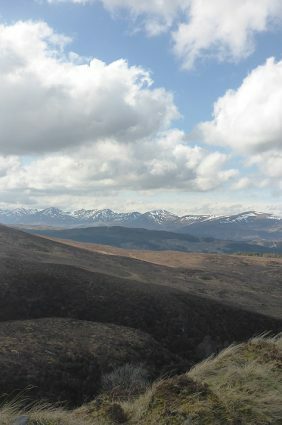 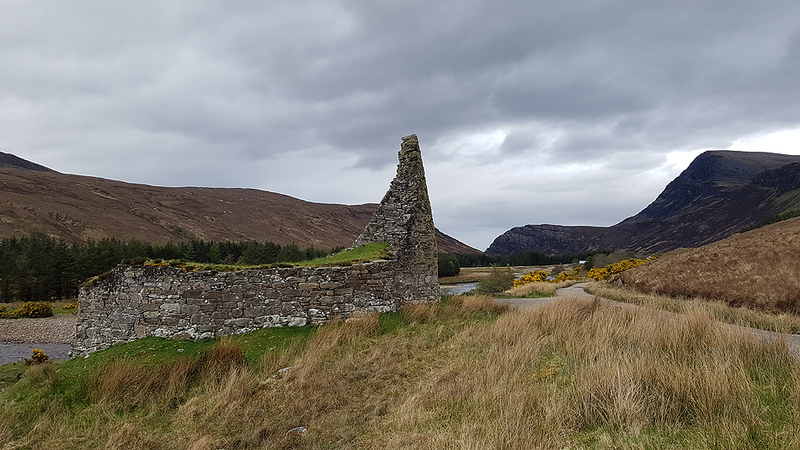 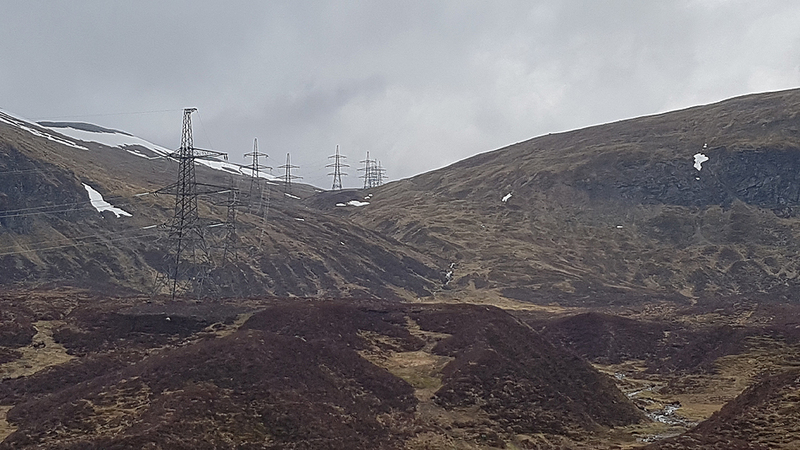 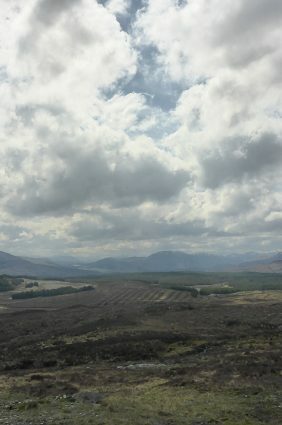 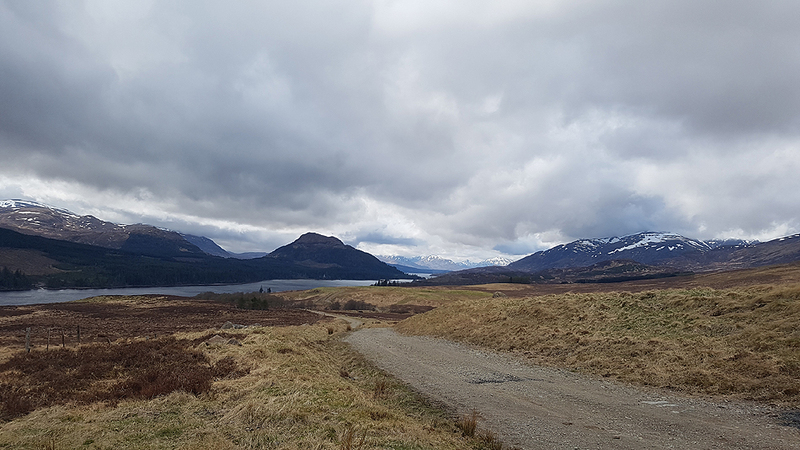 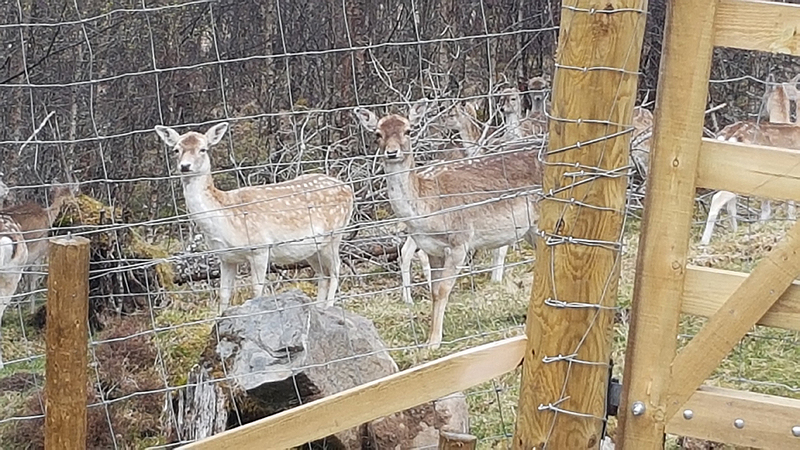 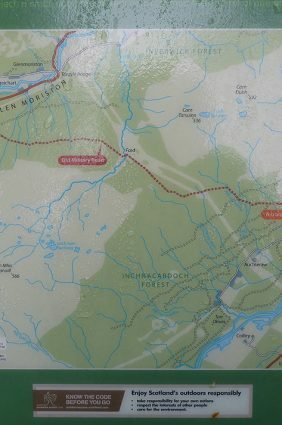 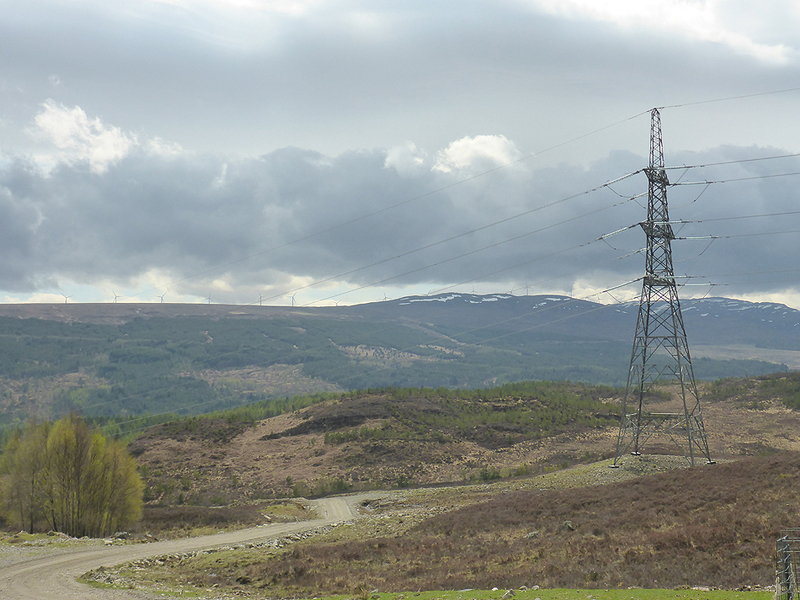 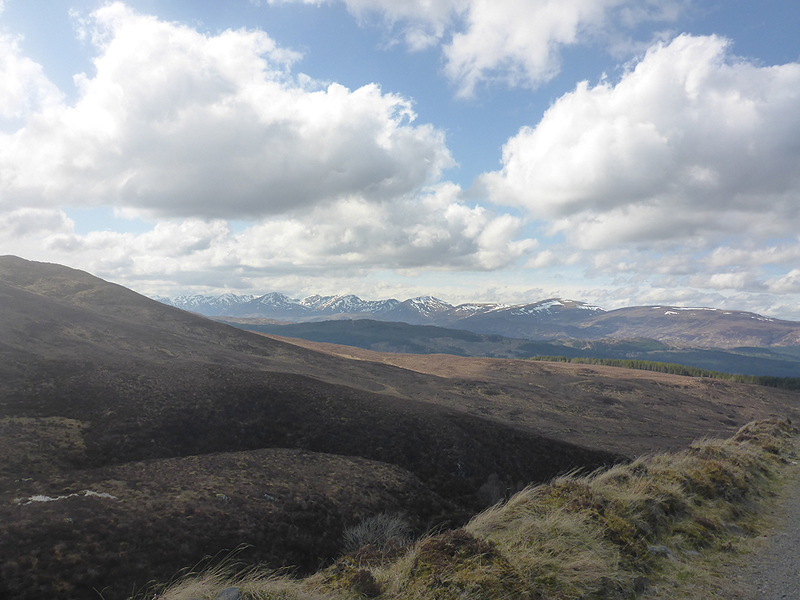 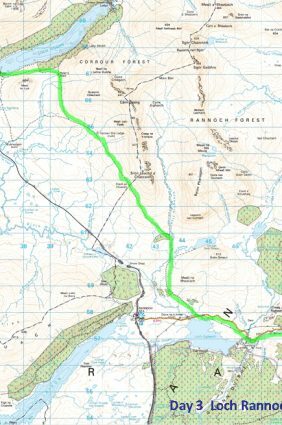 All that was left was the estate road loop over from Rannoch towards Loch Ossian SYHA, north-east of the Glasgow to Fort William railway track. 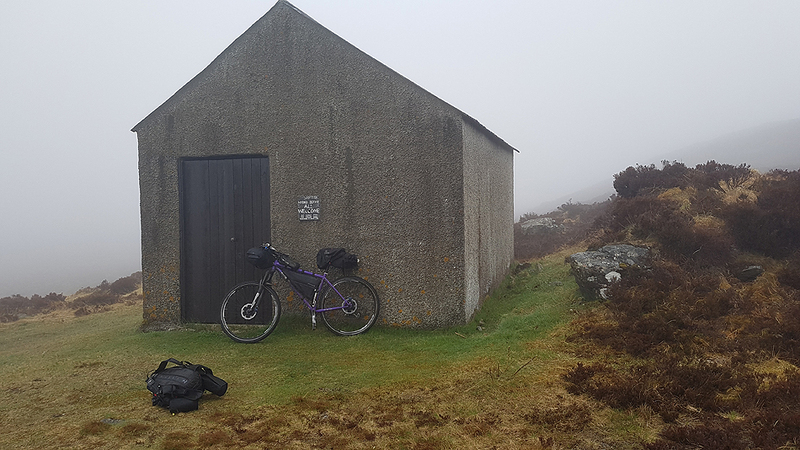 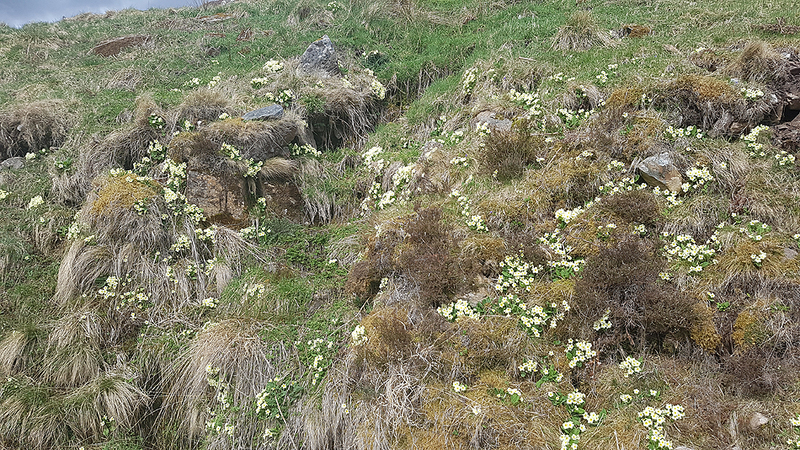 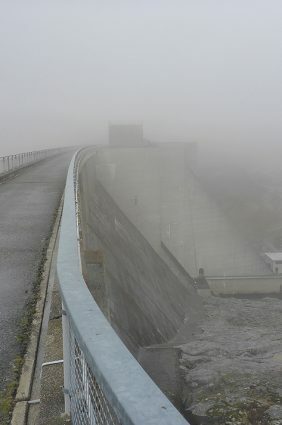 A short rest and a brew stop, fueled with some grub, allowed this final height to be summited in deteriorating weather and energy levels. 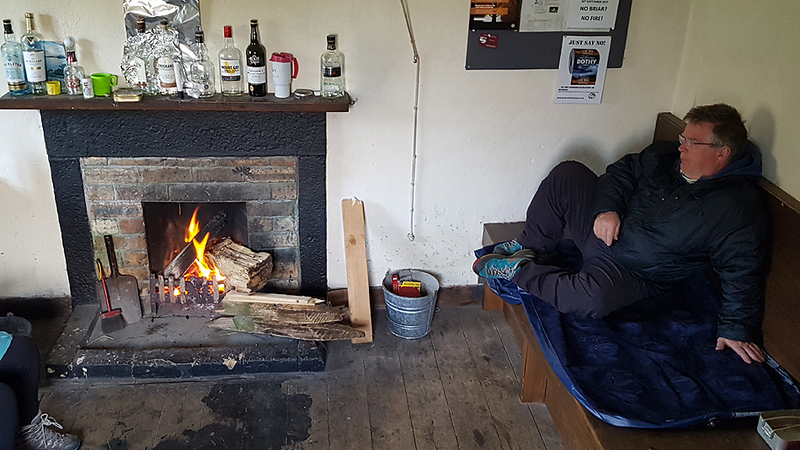 The cosy hostel and spare food cupboard was a welcome spot for the night. 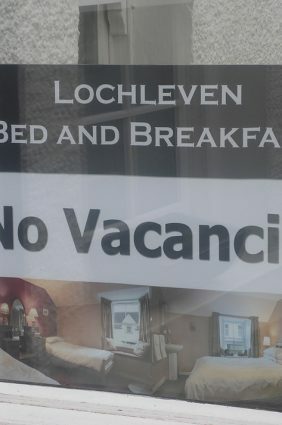 A good night’s sleep was simple. 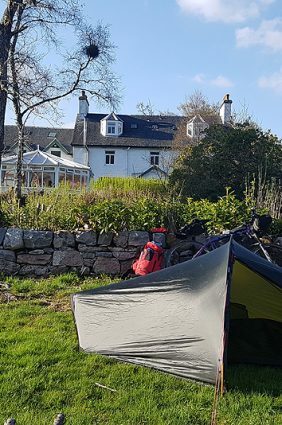 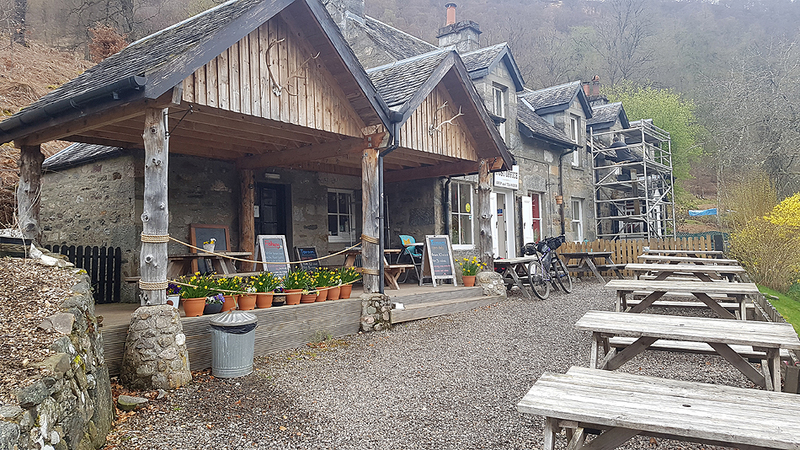 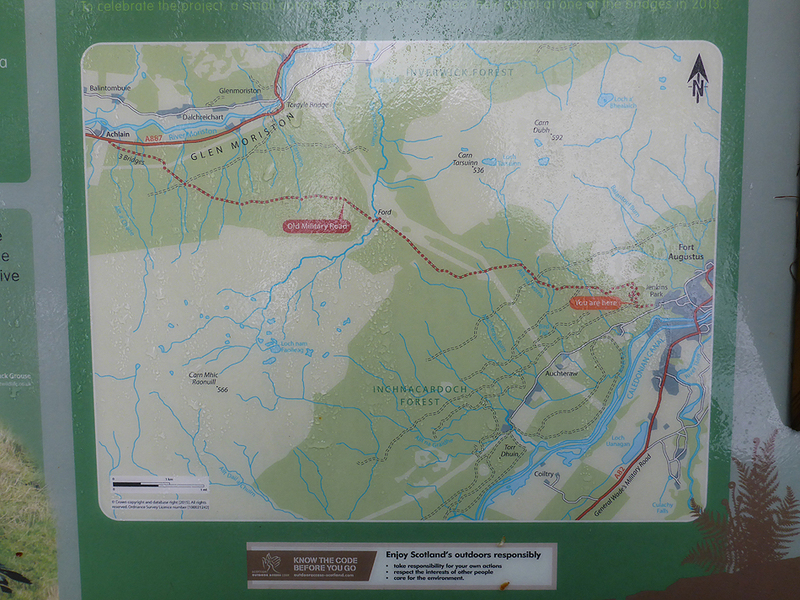 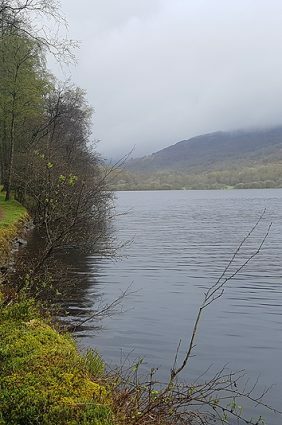 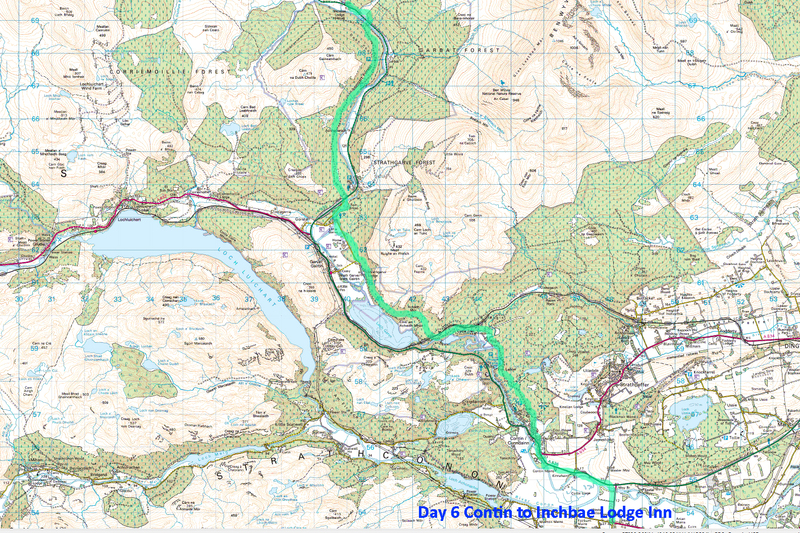 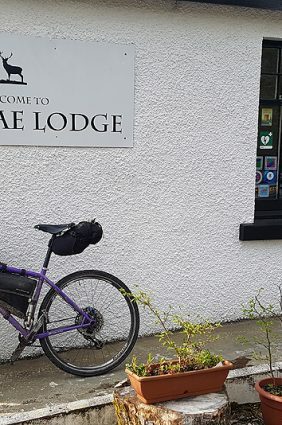 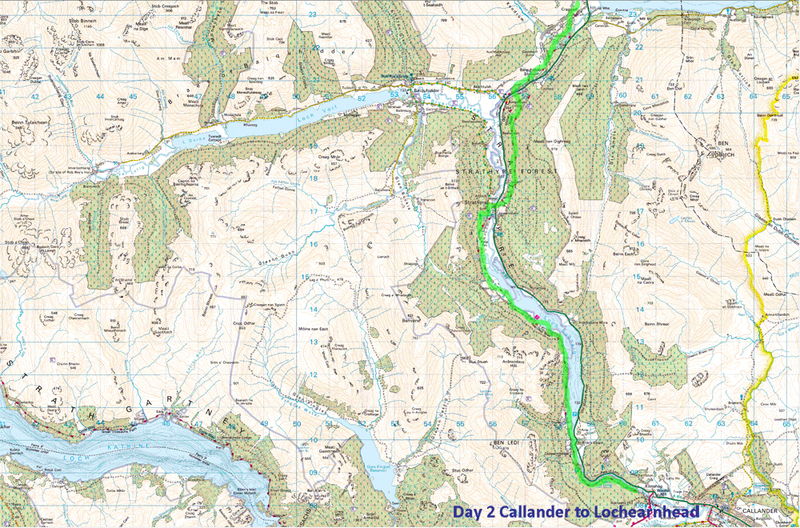 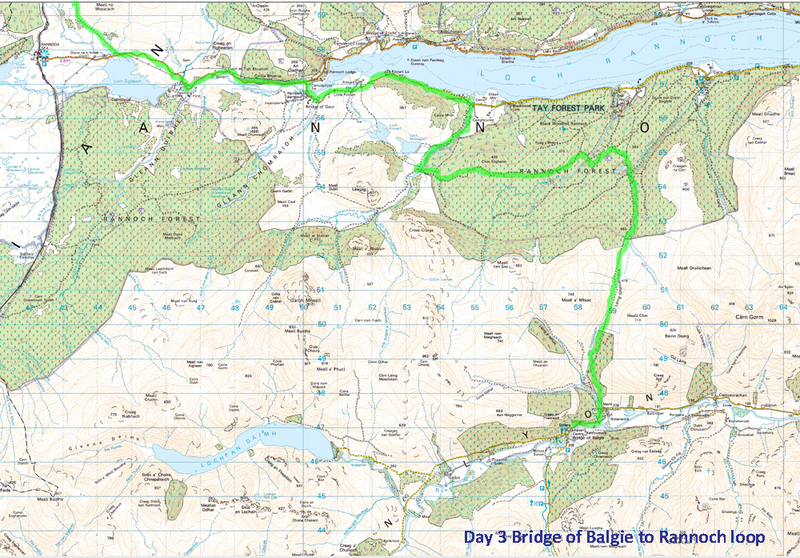 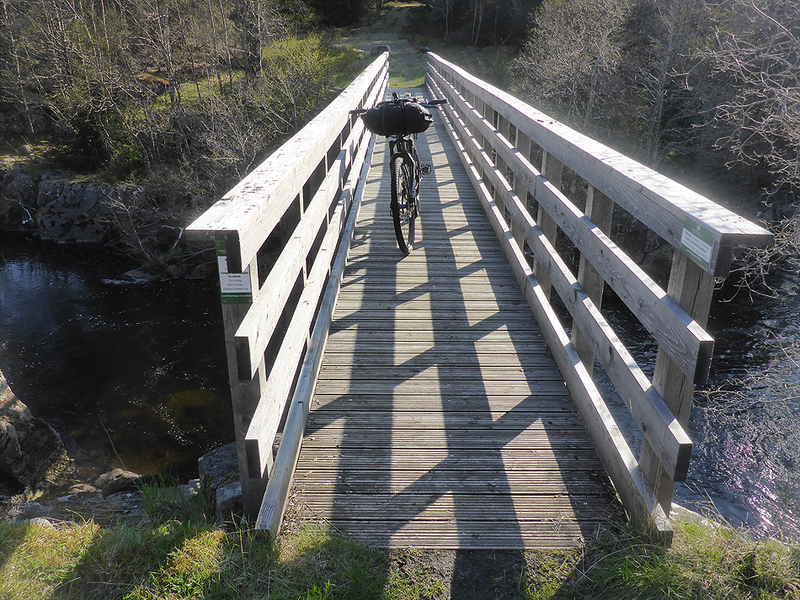 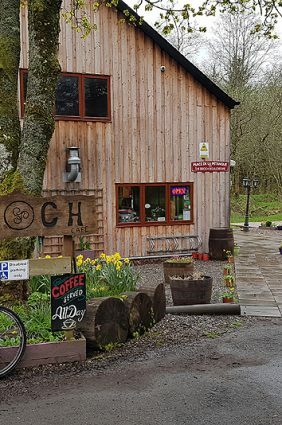 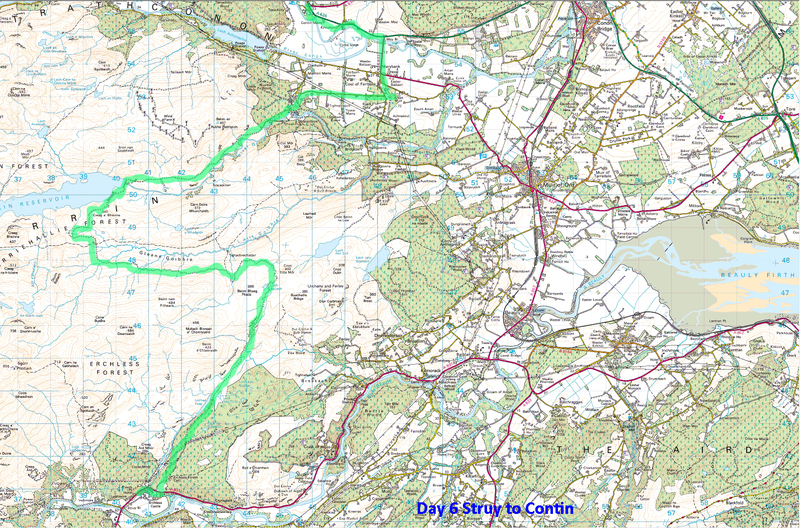 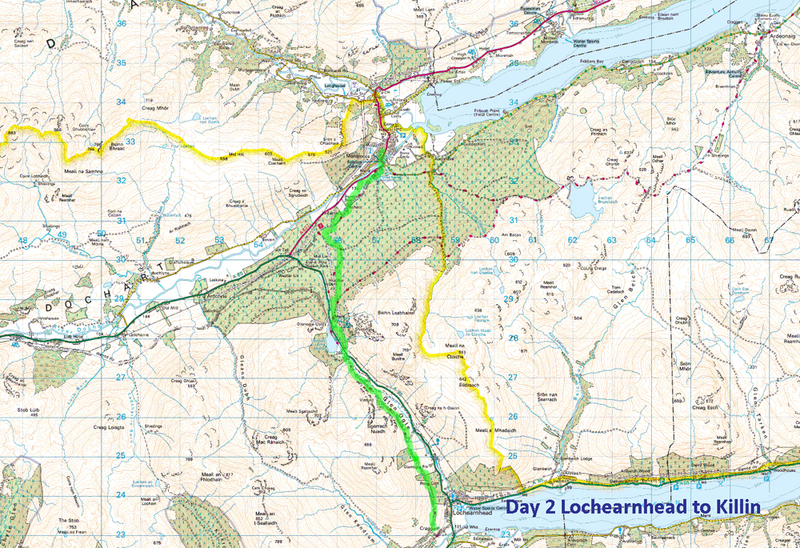 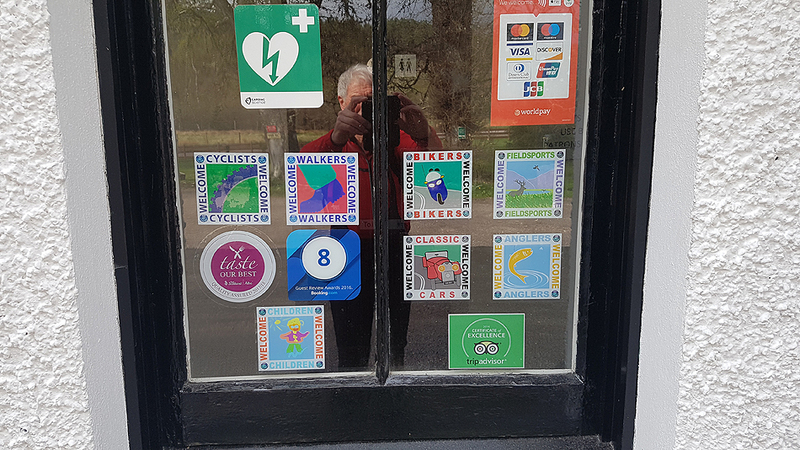 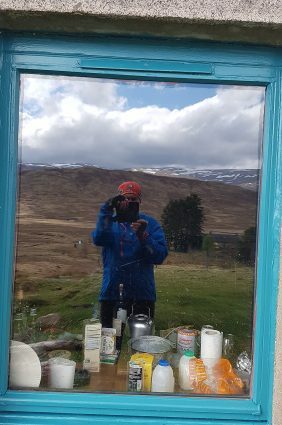 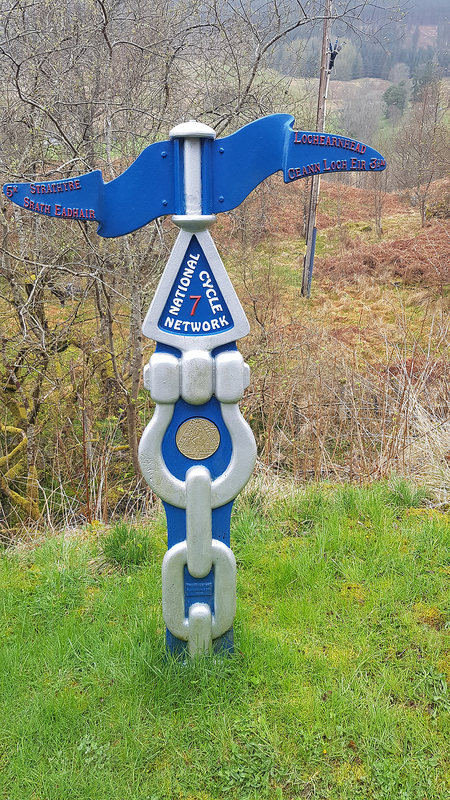 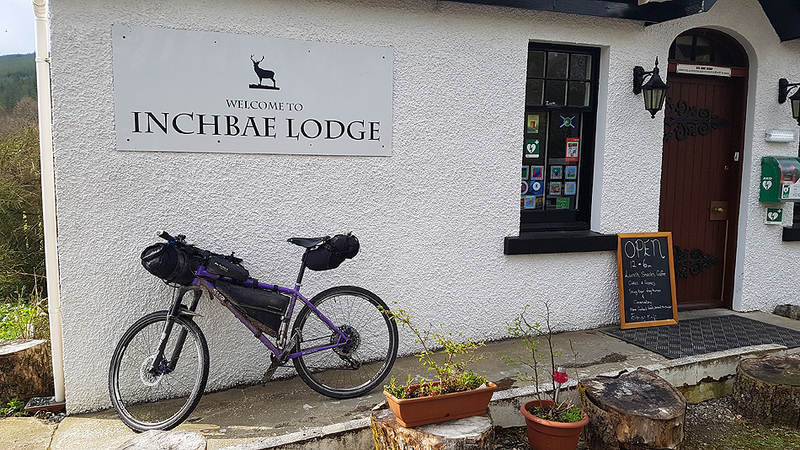 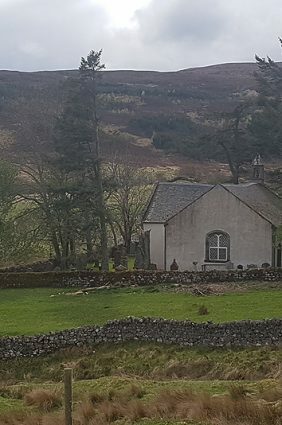 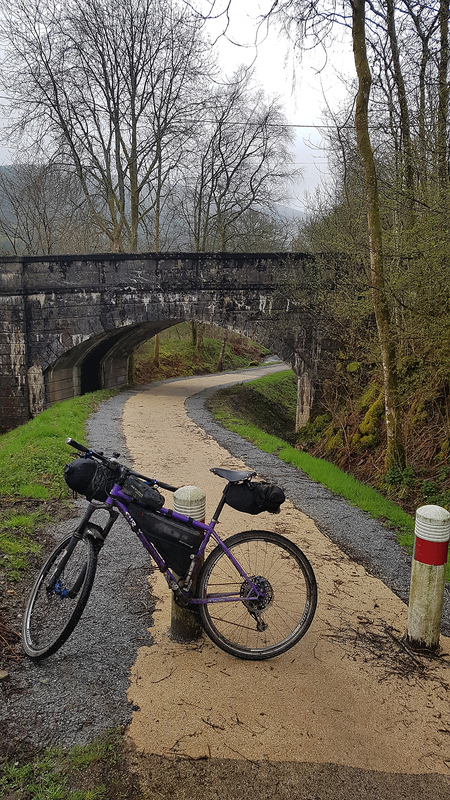 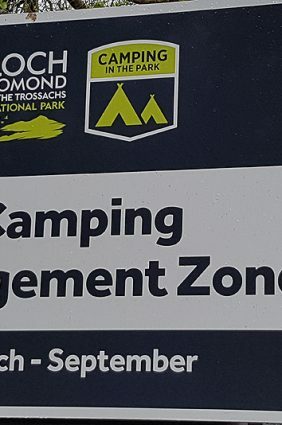 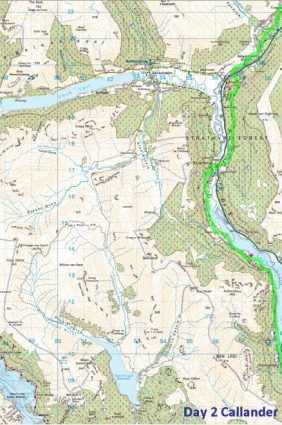 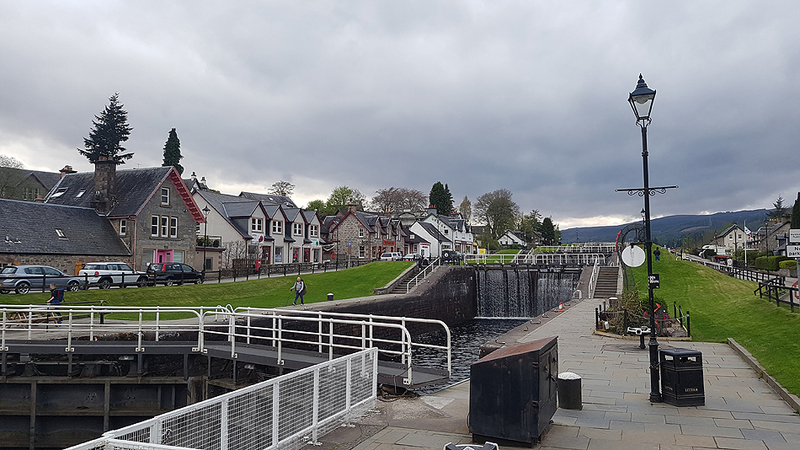 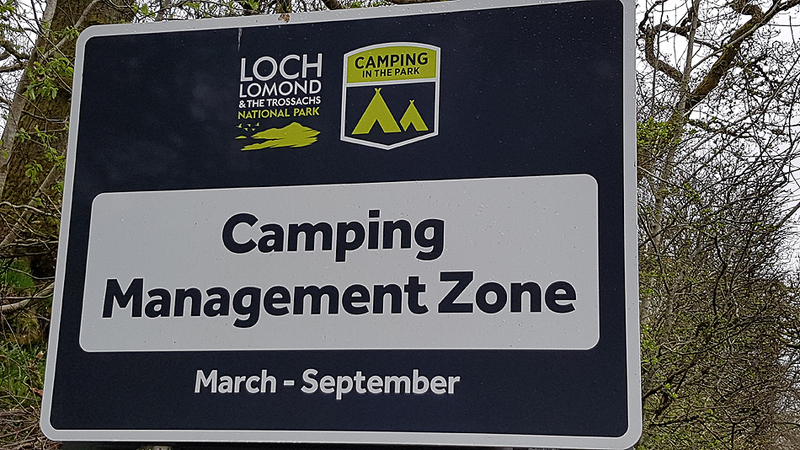 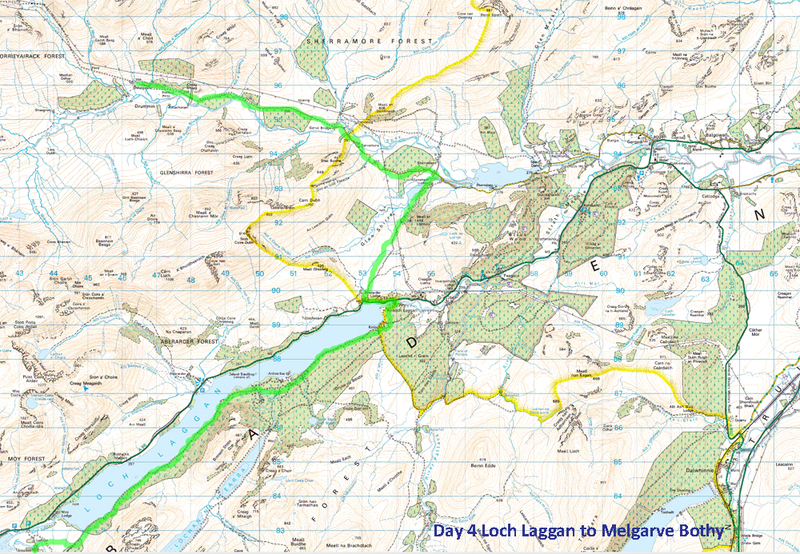 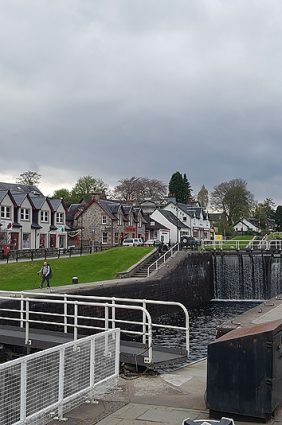 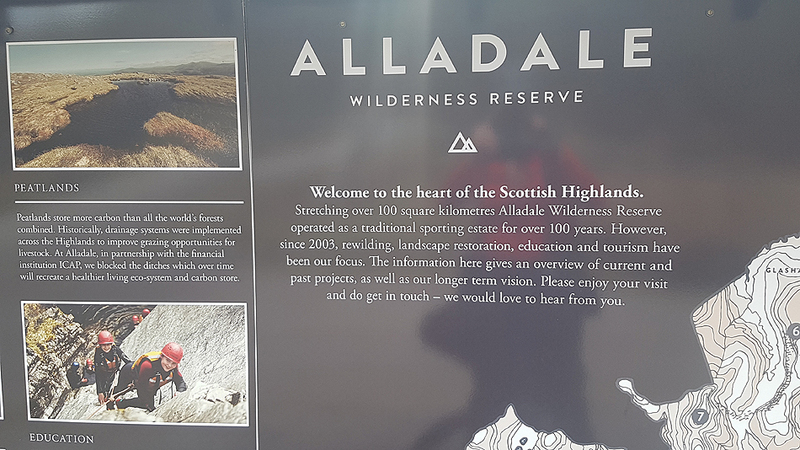 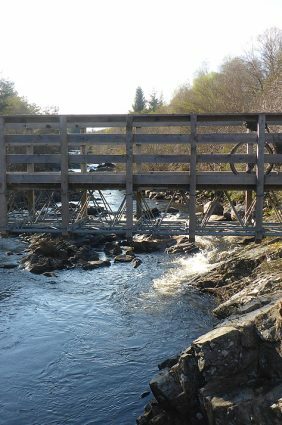 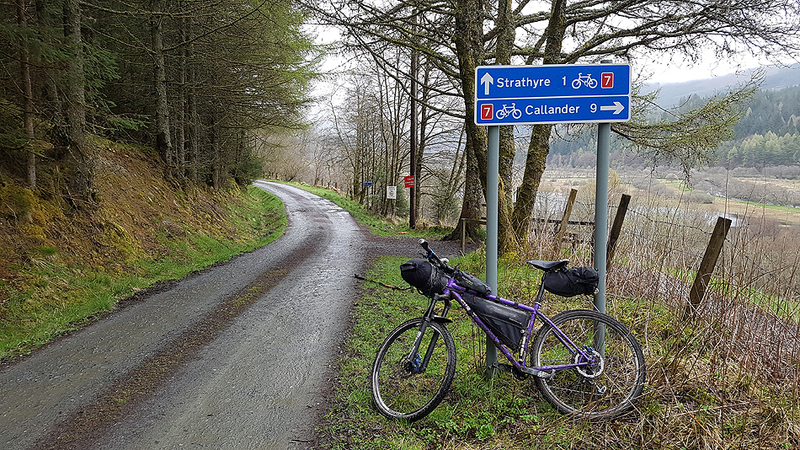 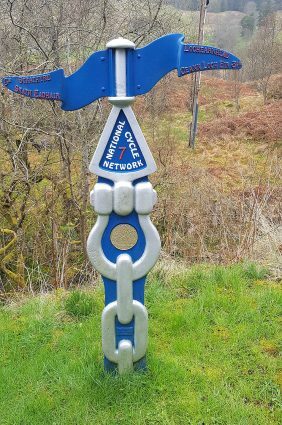 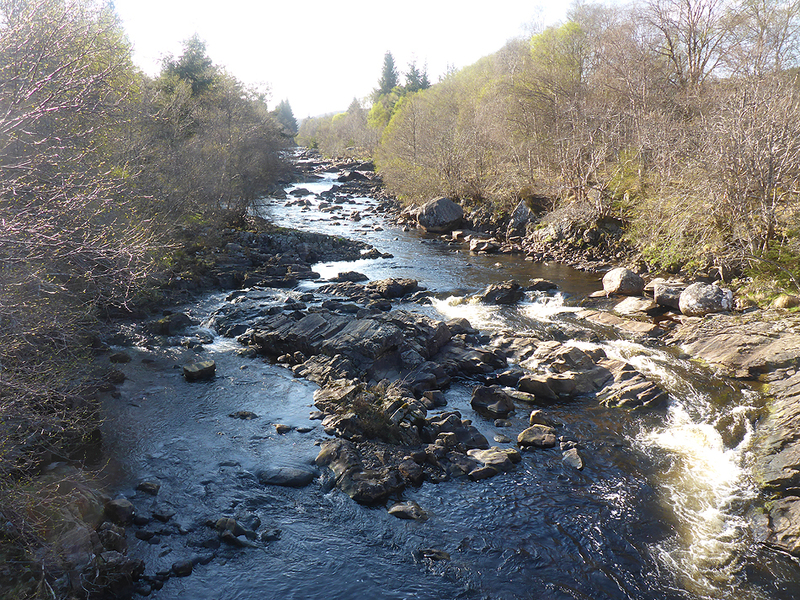 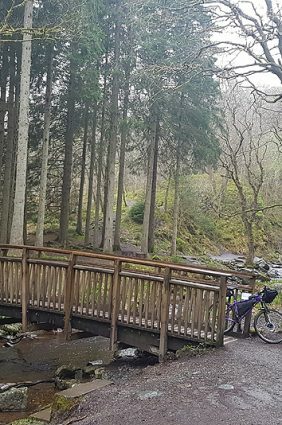 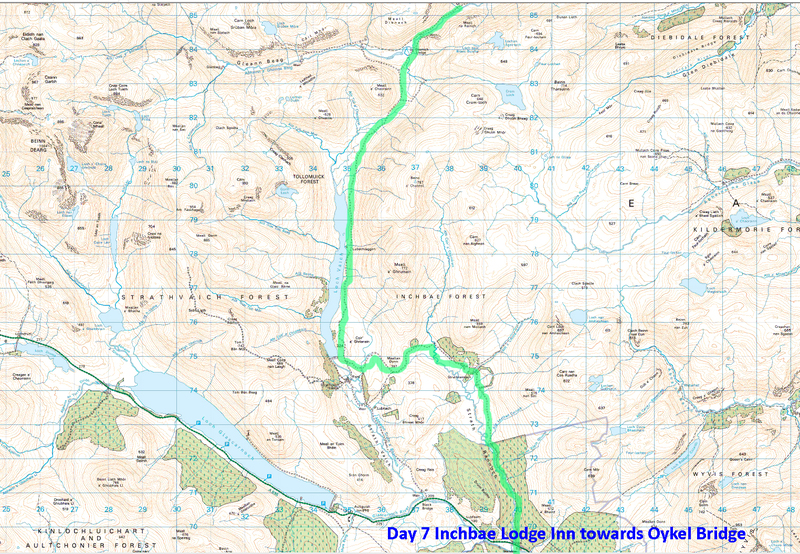 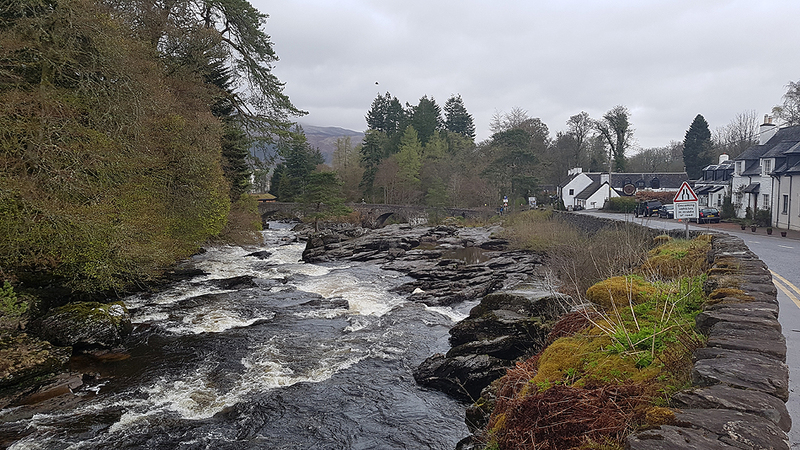 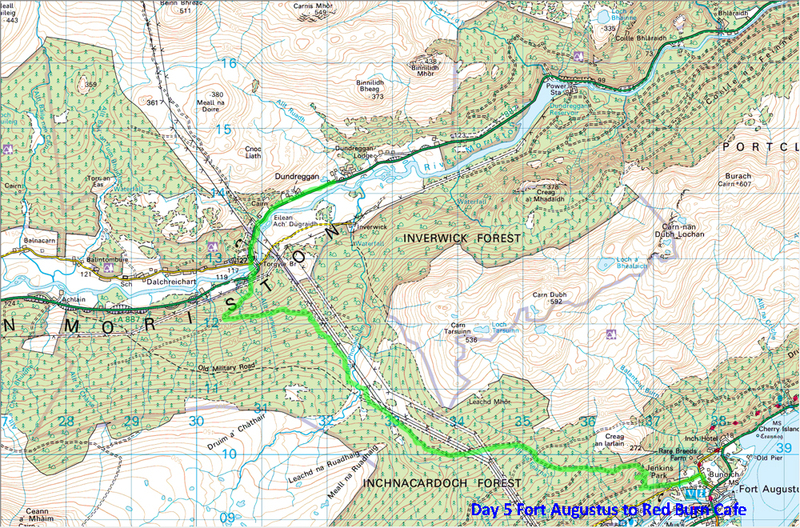 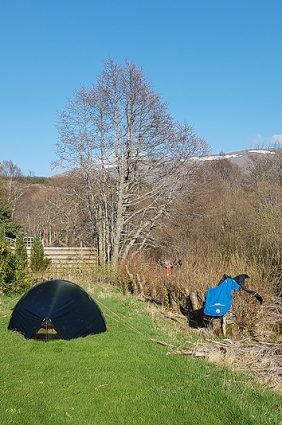 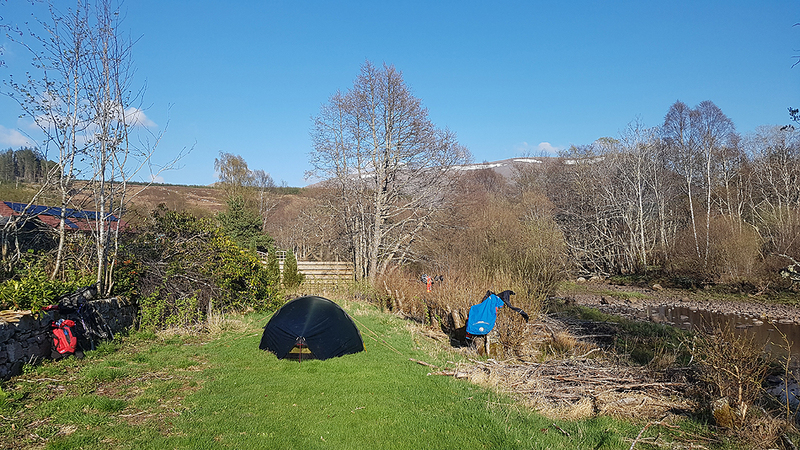 Day two of the Clyde to Cape Wrath trail, off-road bike route There are a number of routes linking Callandar with Aberfoyle and onward to Killin, my next overnight stop. 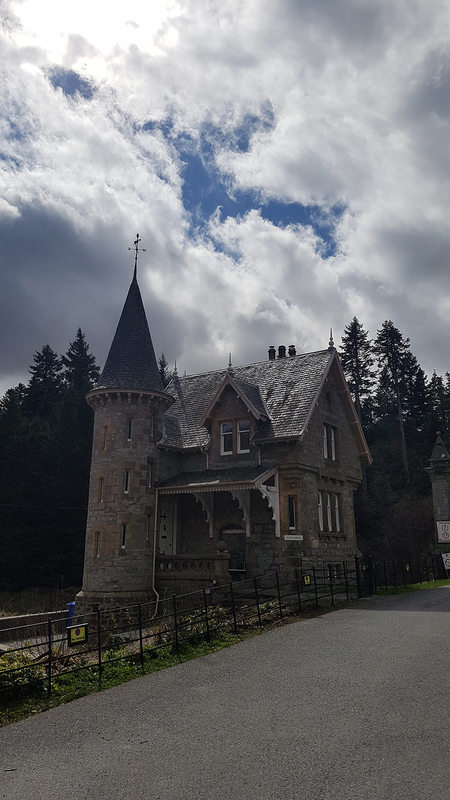 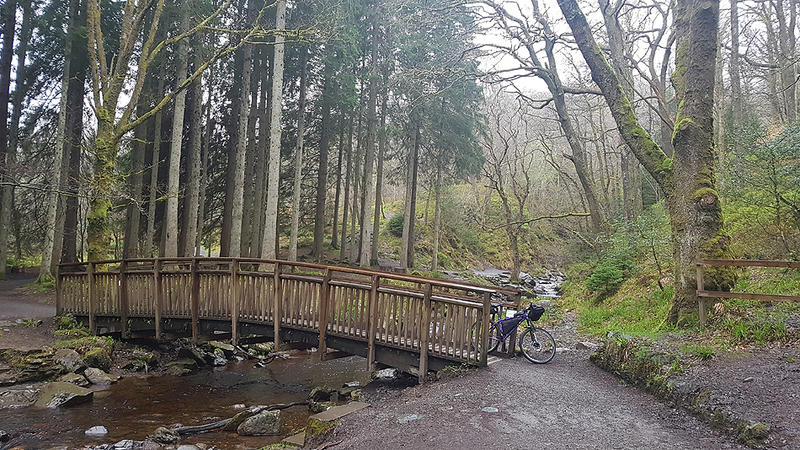 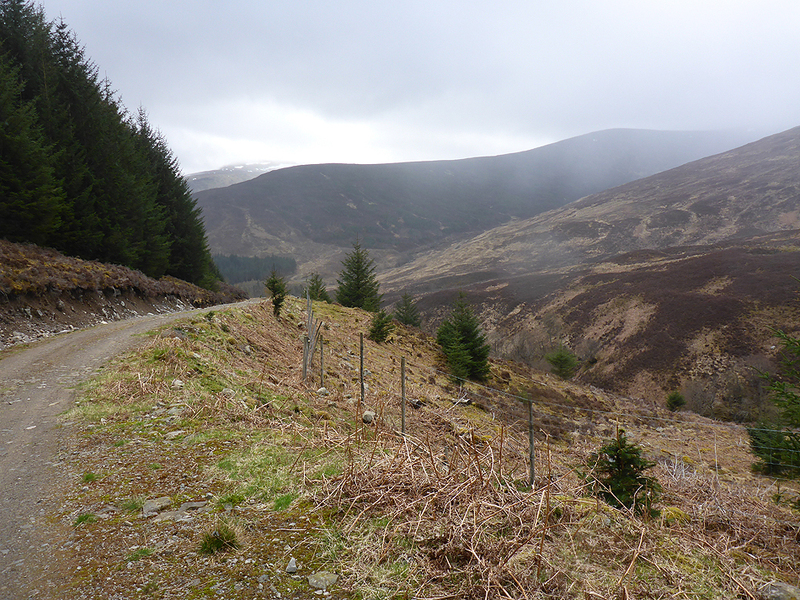 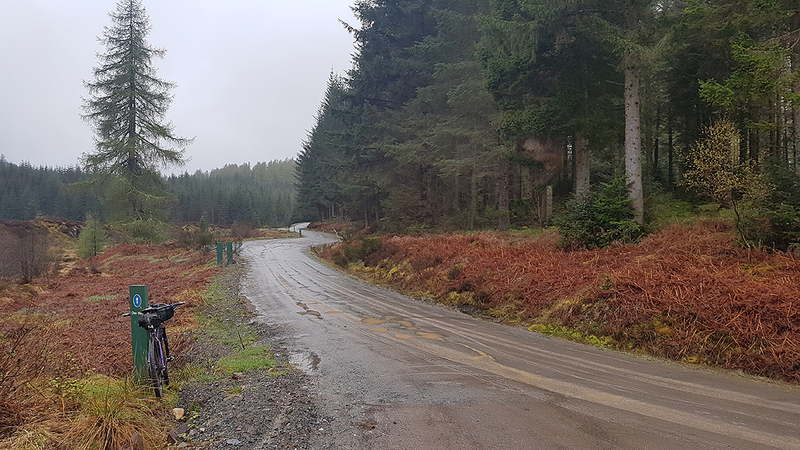 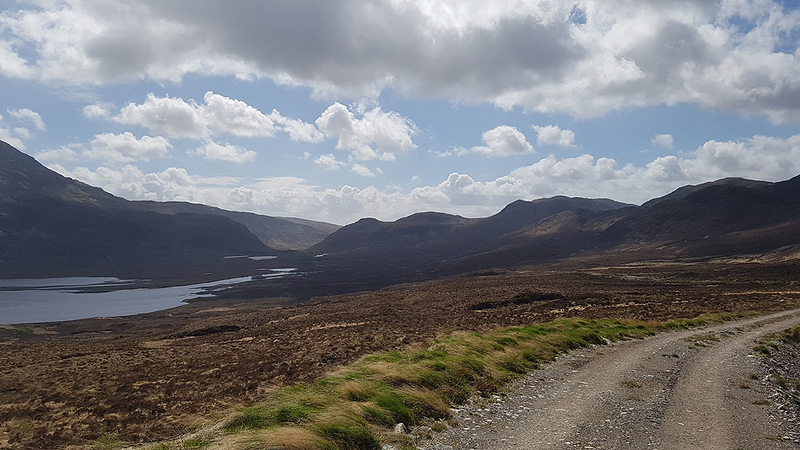 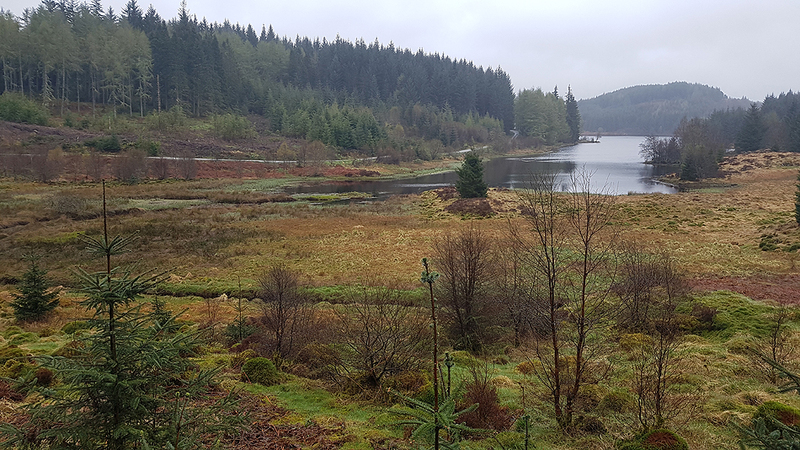 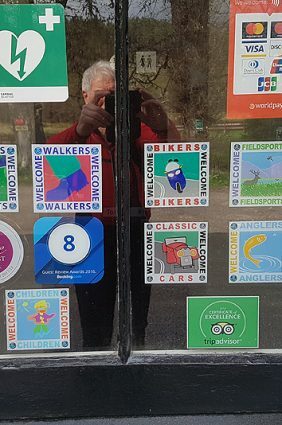 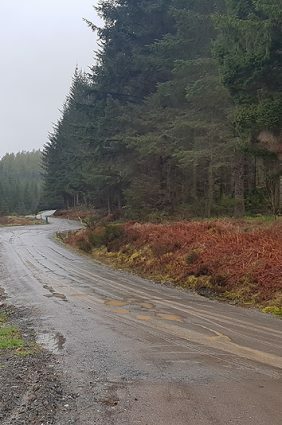 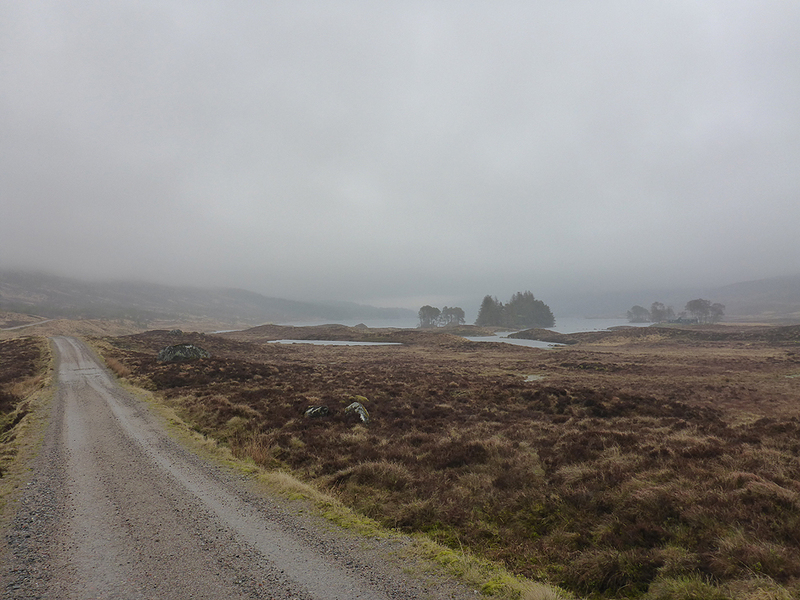 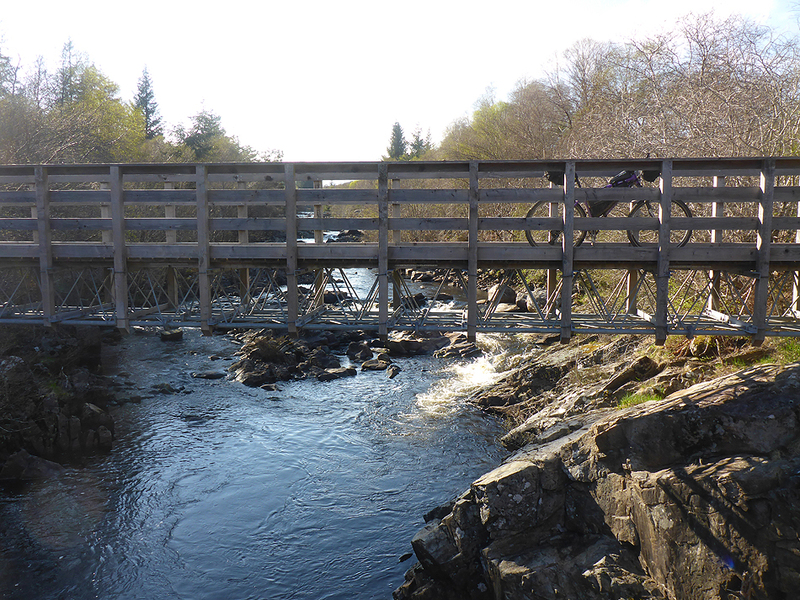 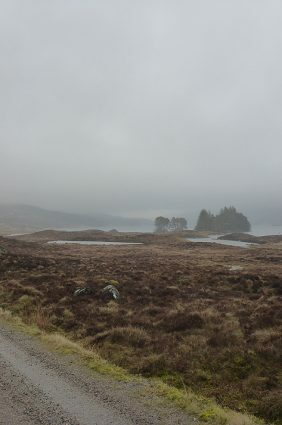 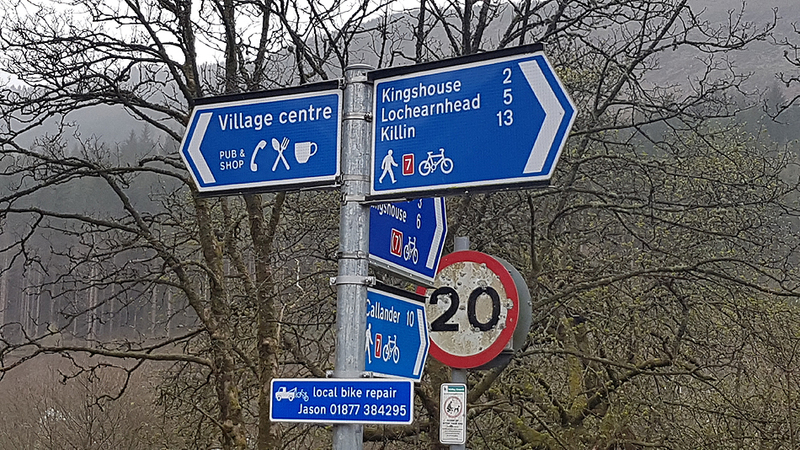 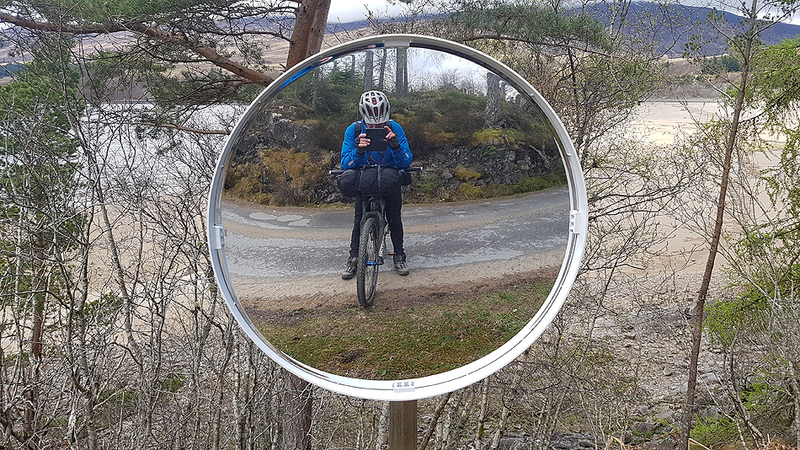 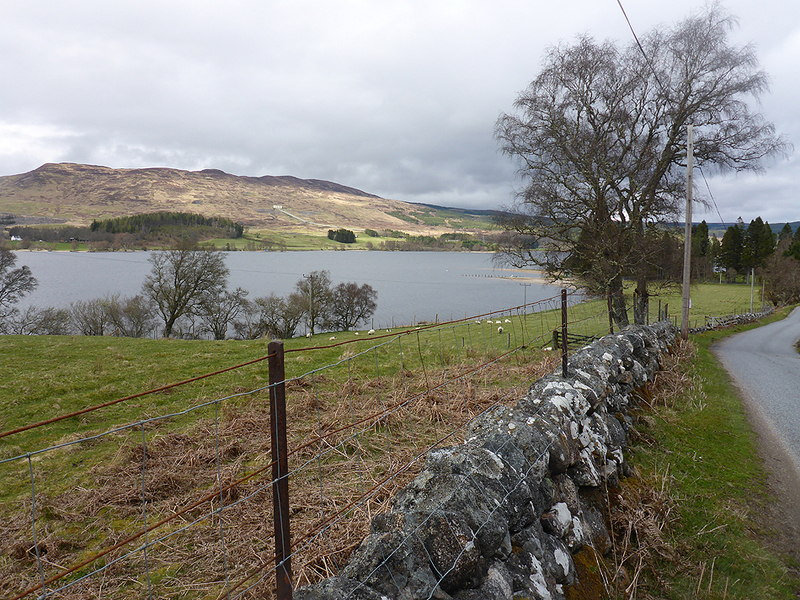 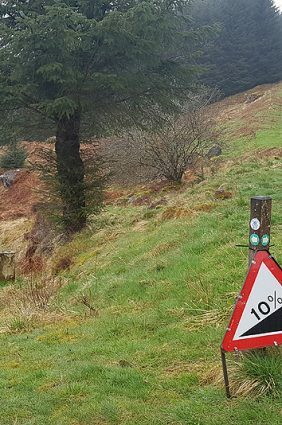 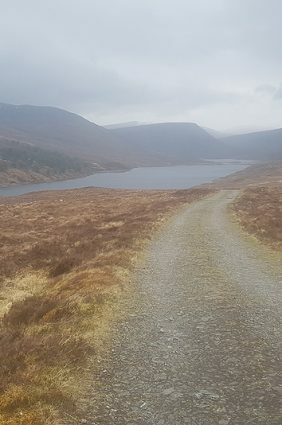 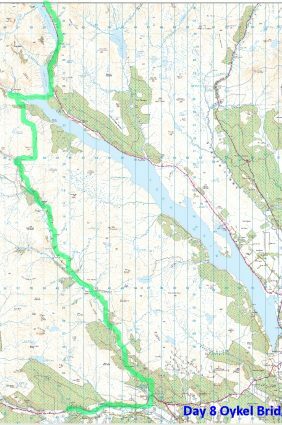 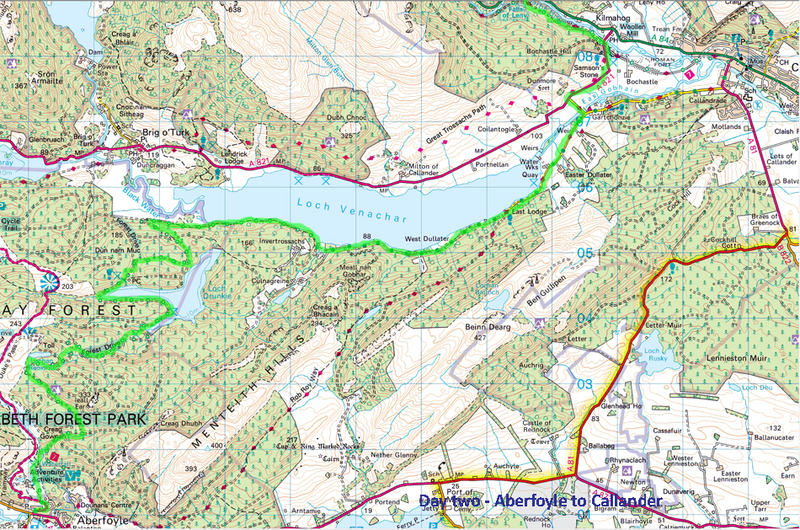 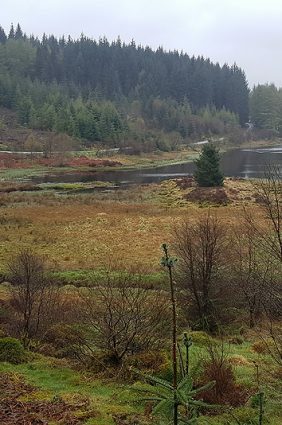 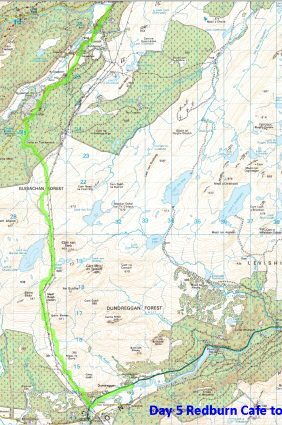 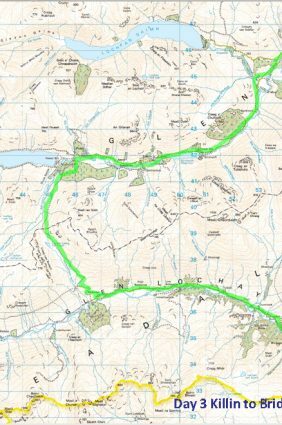 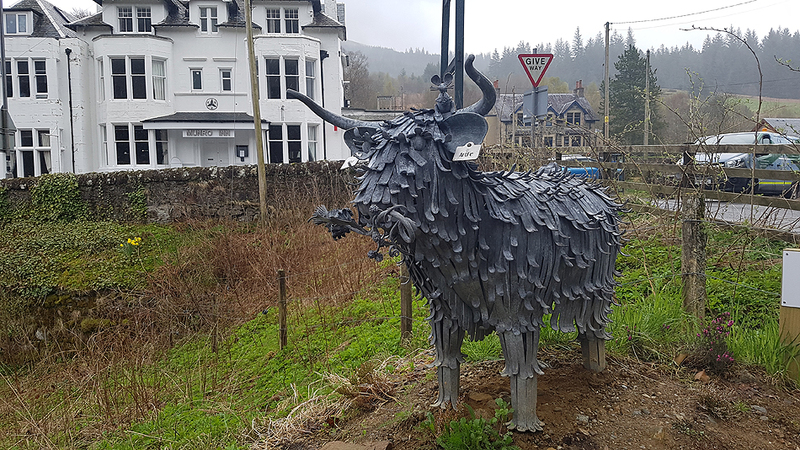 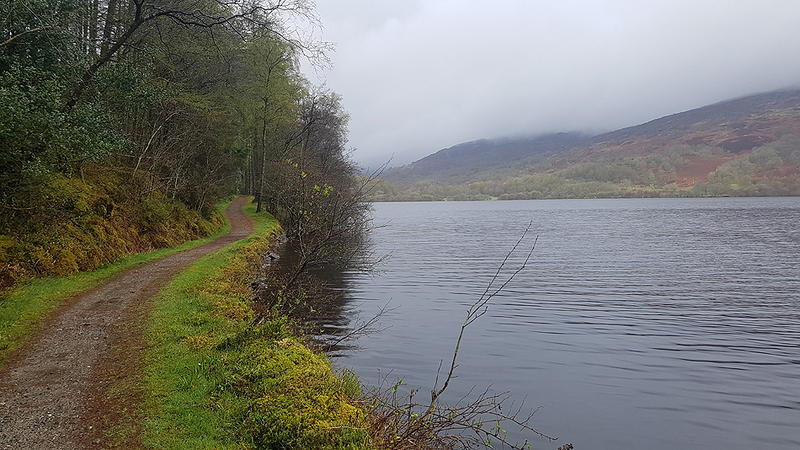 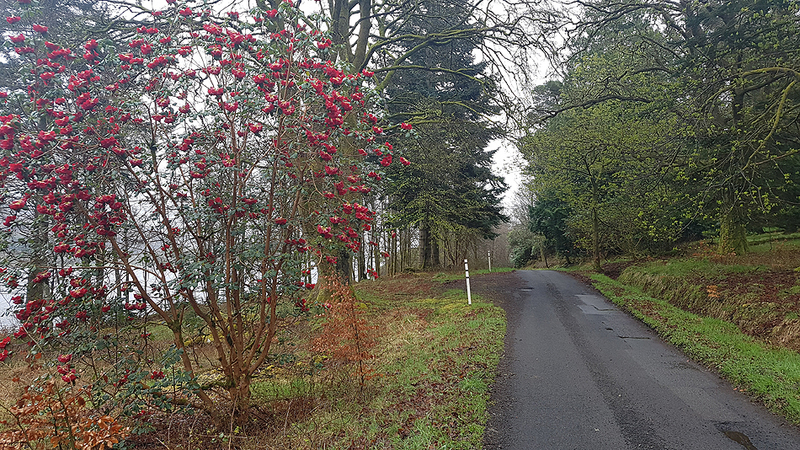 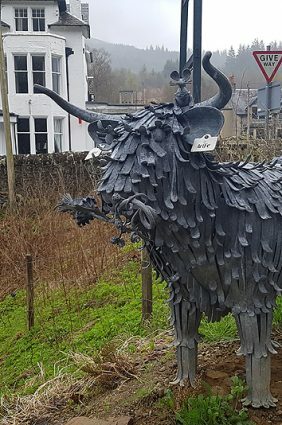 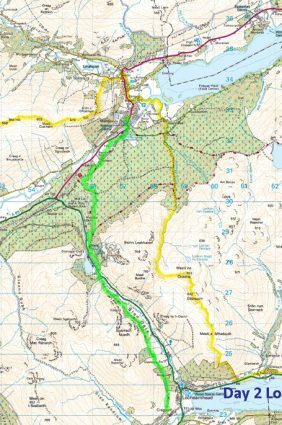 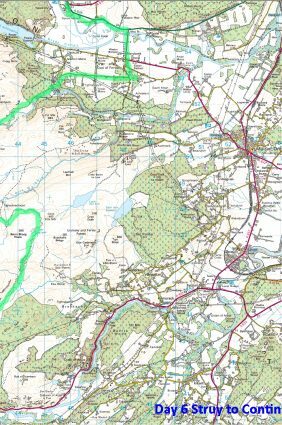 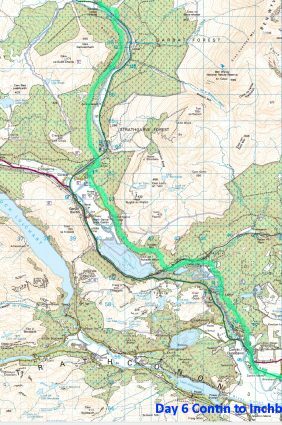 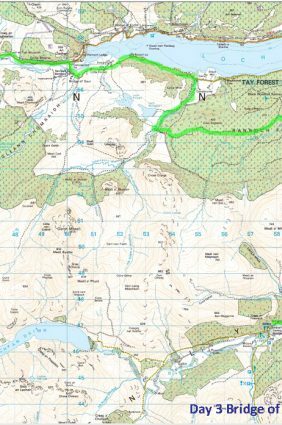 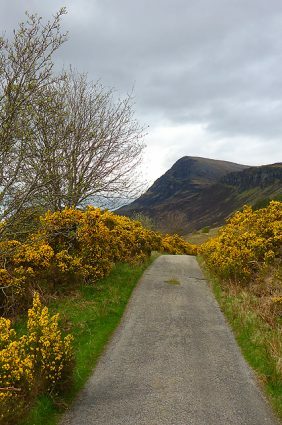 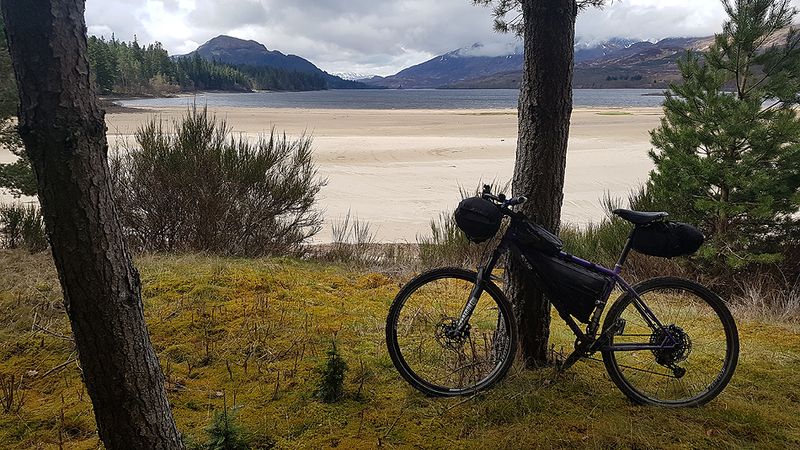 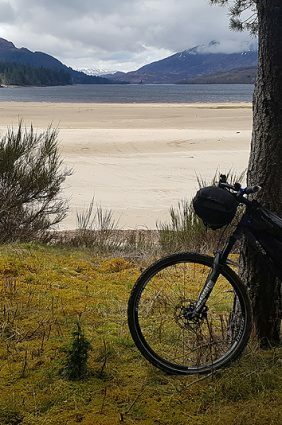 The Duke’s Pass is well known amongst those cycling on the road, but my chosen route followed the off-road Sustrans route 7 steeply out of Aberfoyle, northwards through Queen Elizabeth Forest Park, traversing forest roads and lochans, before heading east alongside Loch Venachar. 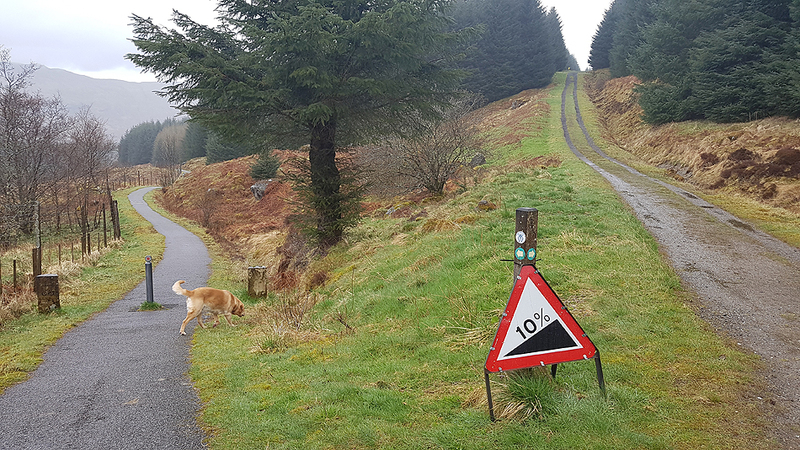 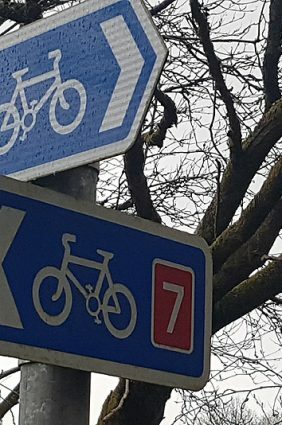 A delightful section, rewarded with plenty of good downhill speed. 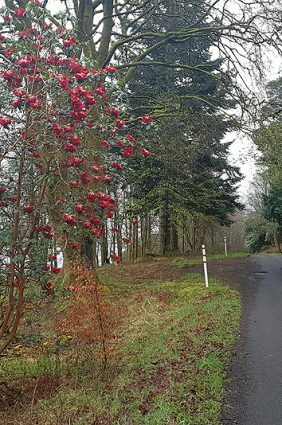 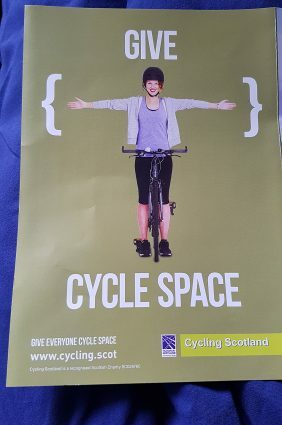 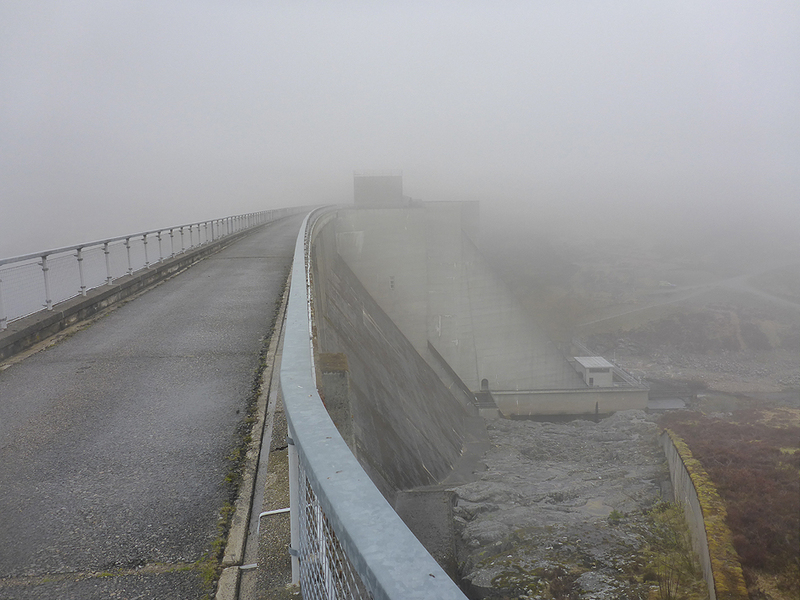 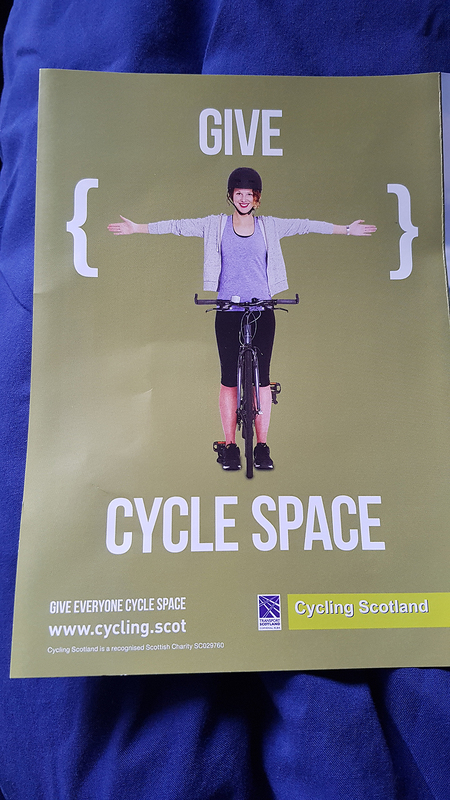 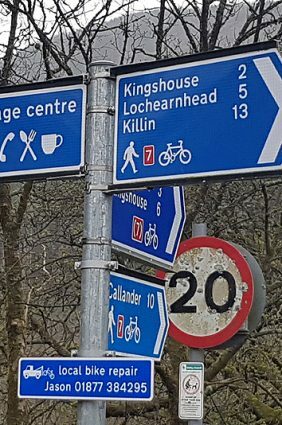 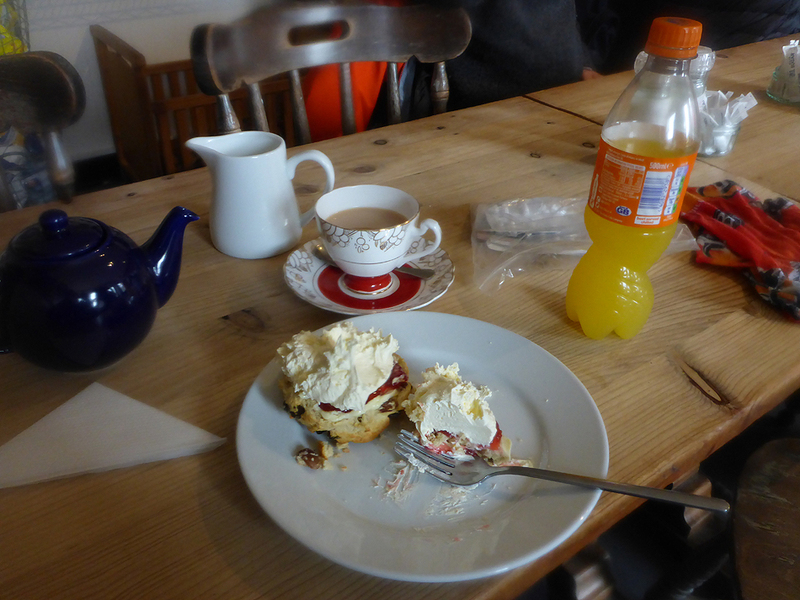 My chain had been skipping gears but fortunately I found Scottish Cycling Centre and a quick fix, plus plenty of Callander shortbread and pots of tea. 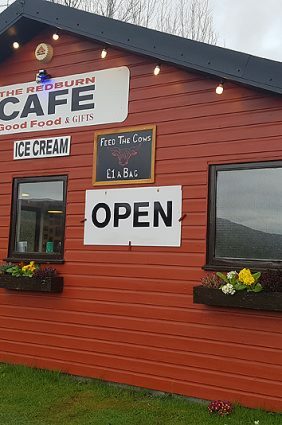 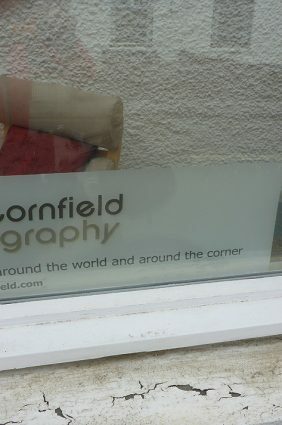 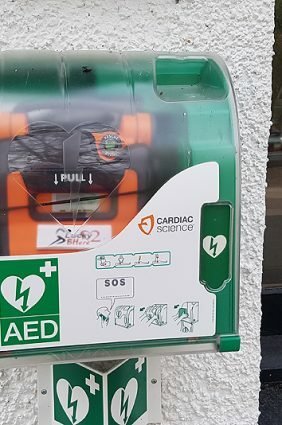 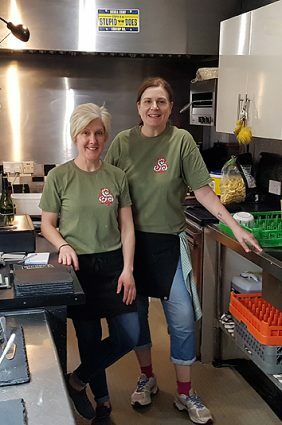 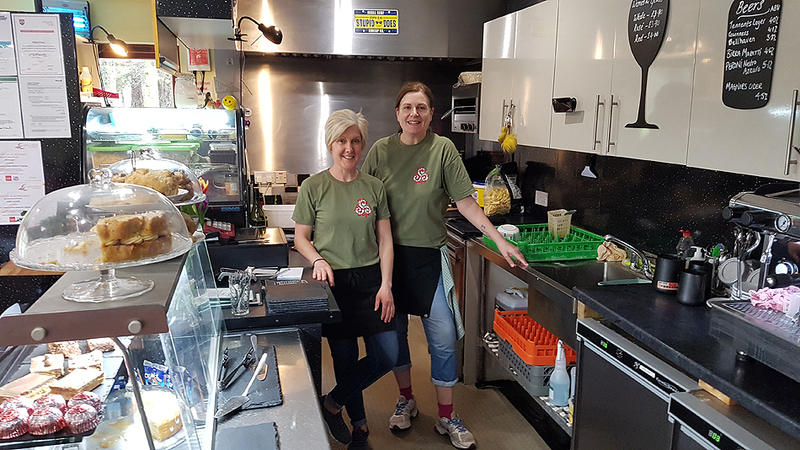 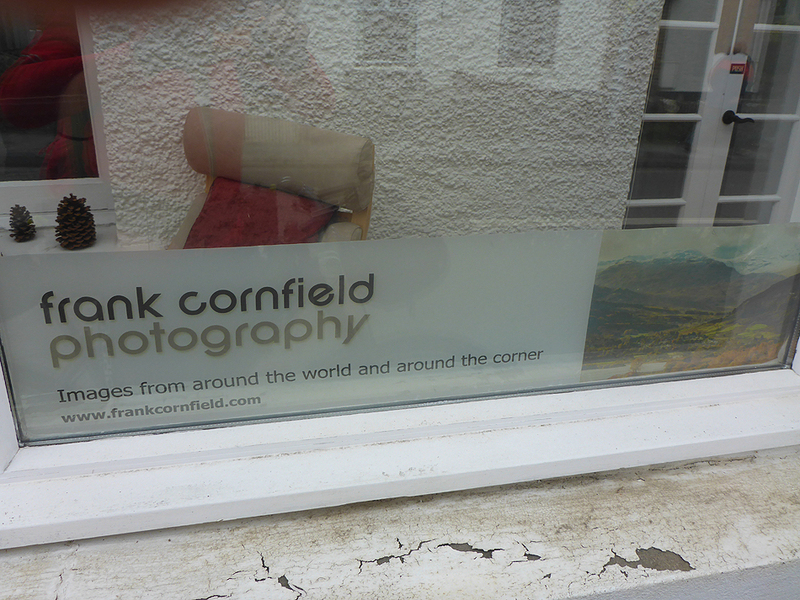 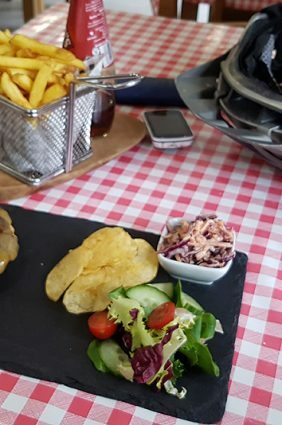 A great place, friendly and helpful. 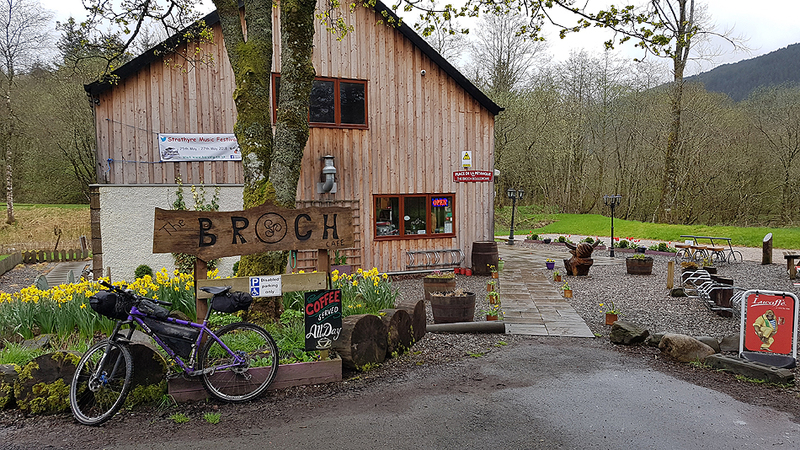 Pointing north from Callander the good cycle track alongside Loch Lubnaig leads to one of the best feed and drink stations on the whole trip The Broch Cafe at Strathyre. 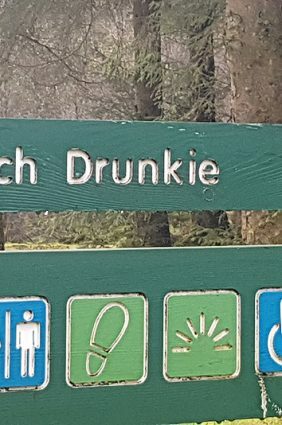 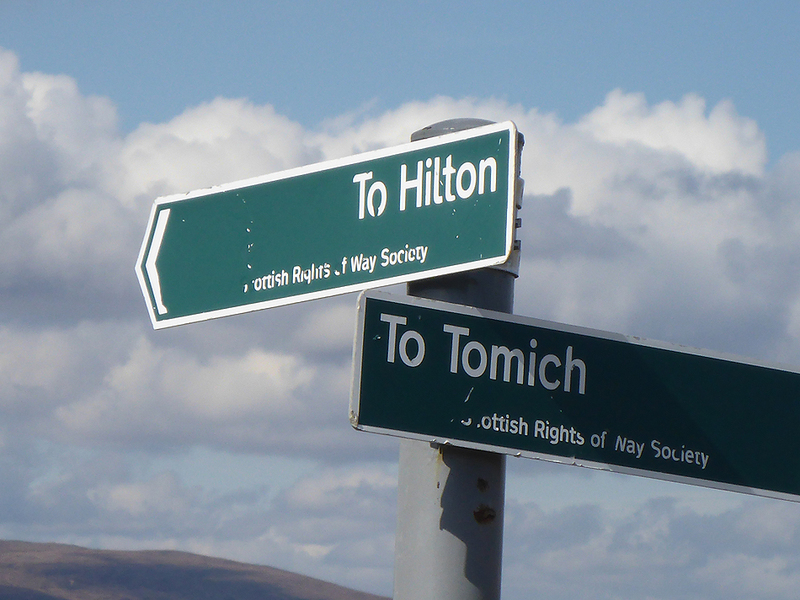 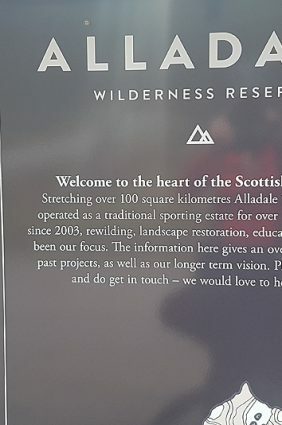 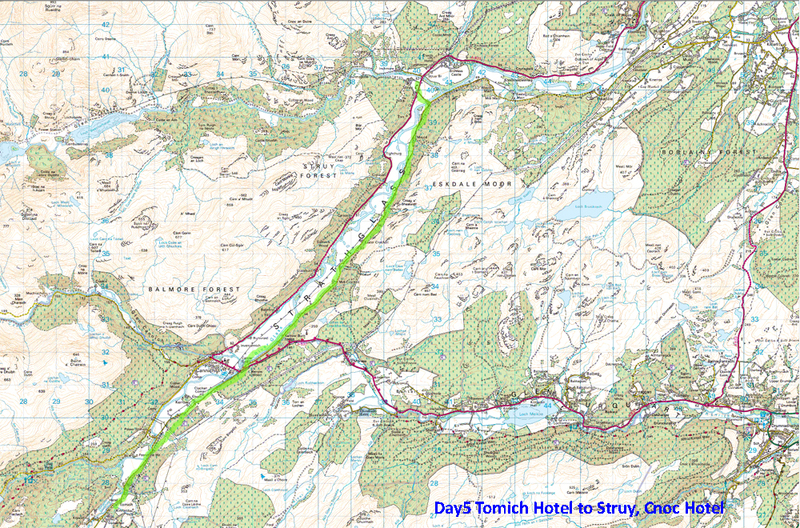 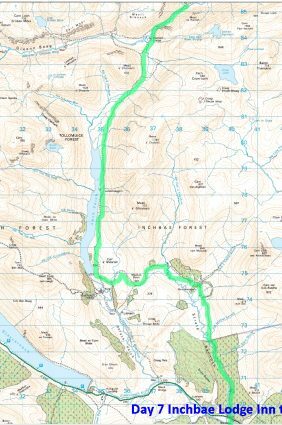 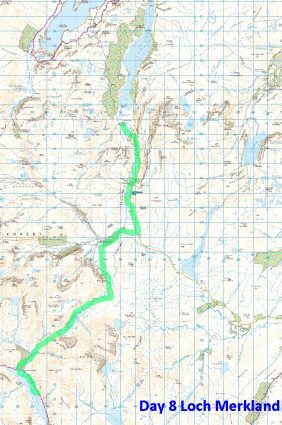 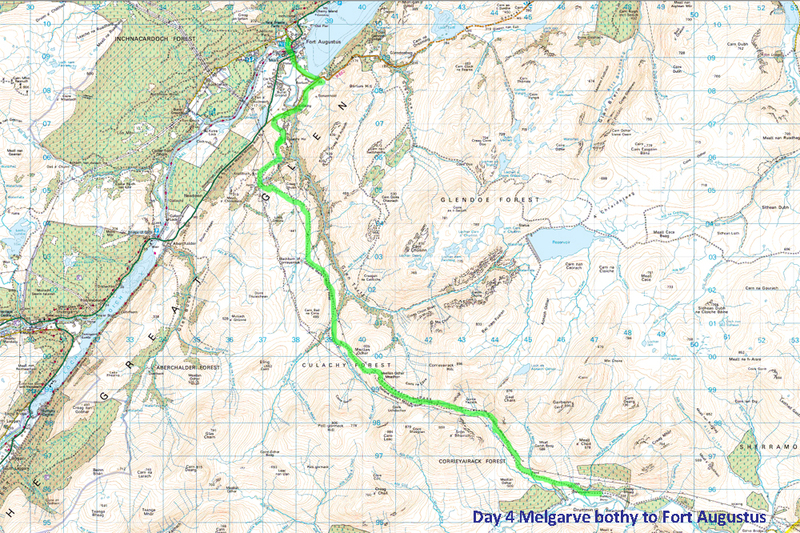 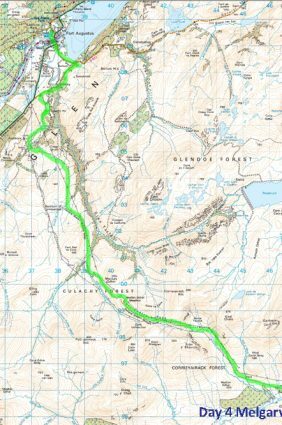 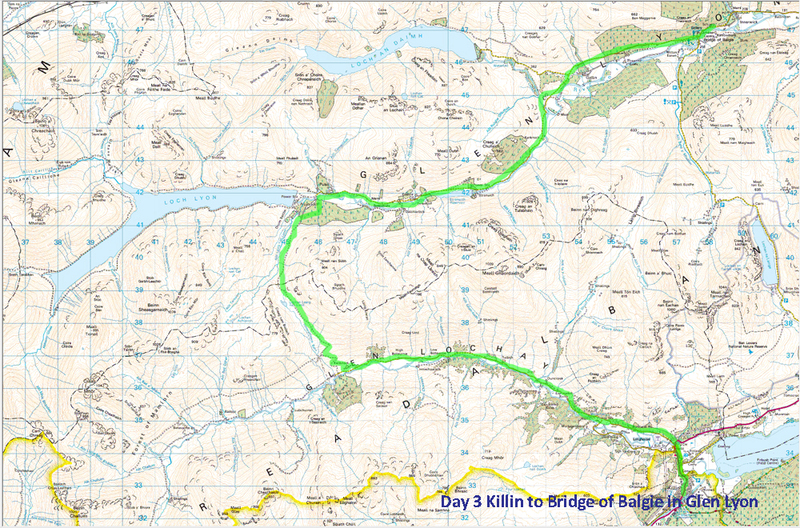 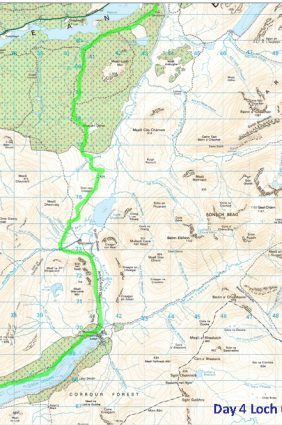 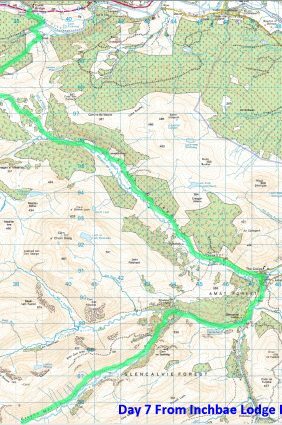 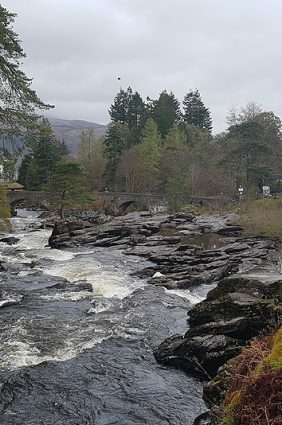 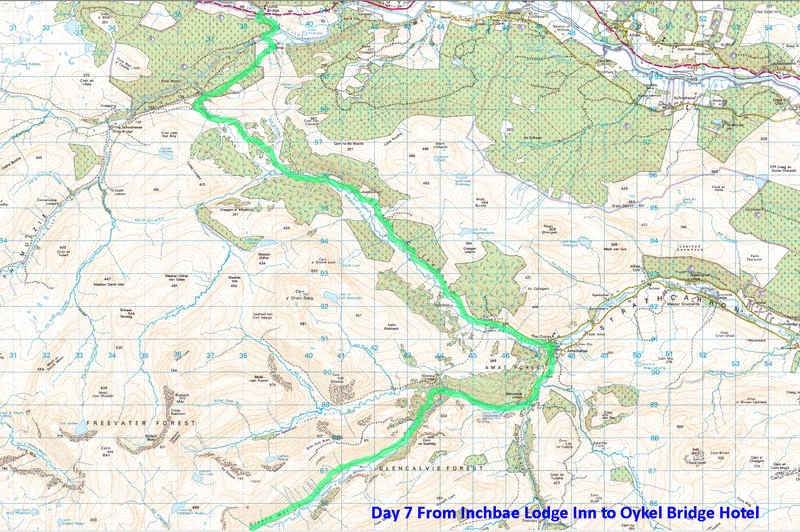 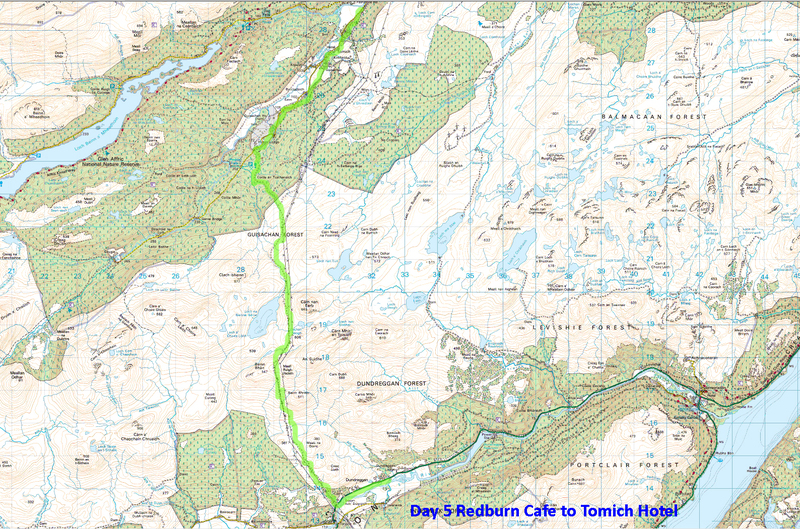 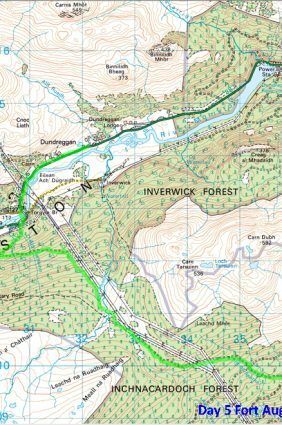 Suitably replenished, the journey leads on to Lochearnhead and then follows the old railway route, steeply at first and then more easily, ascending Glen Ogle to the A85 road pass, before descending into Killin and the Falls of Dochart. 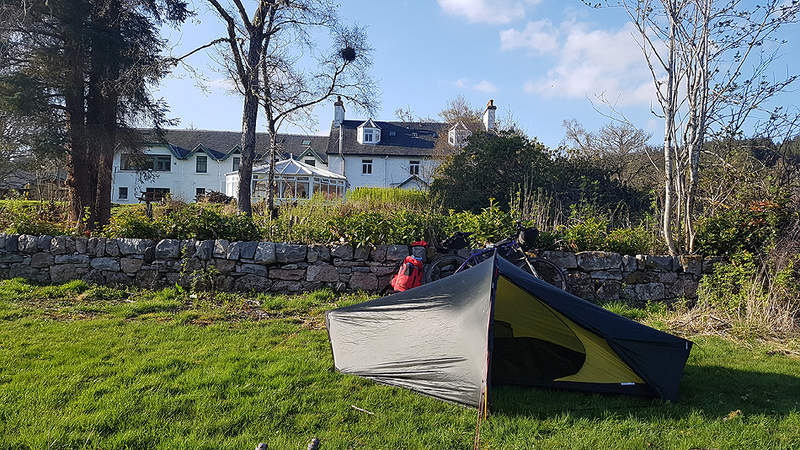 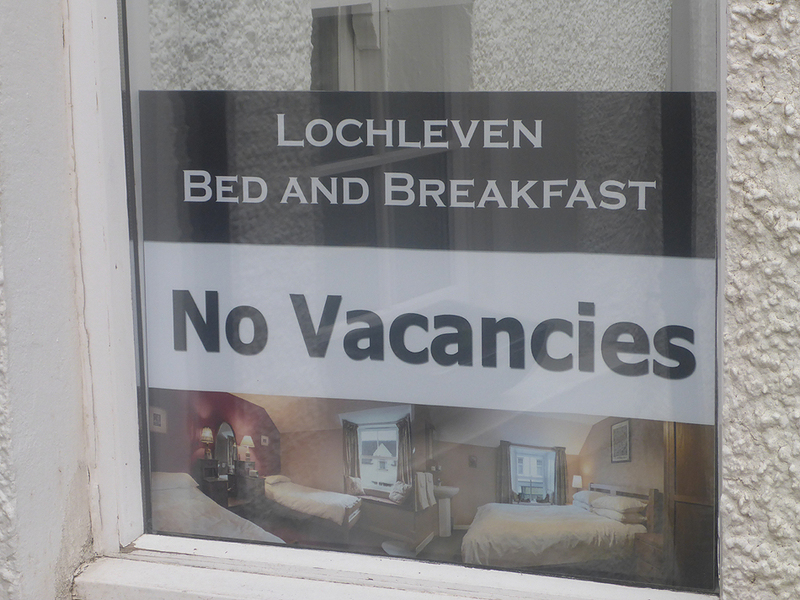 The reward was a cosy night at Lochleven B&B A really good day with minimal traffic on the small amount of side roads used at times.